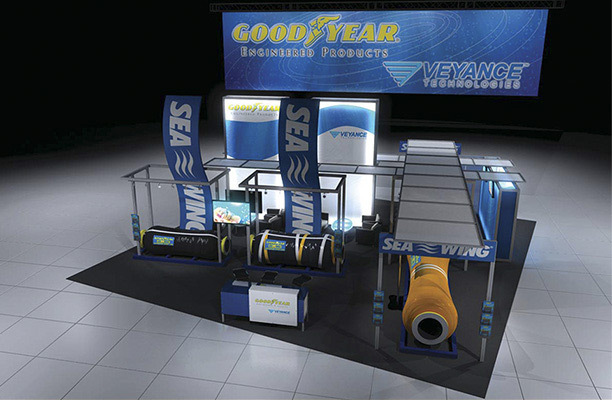 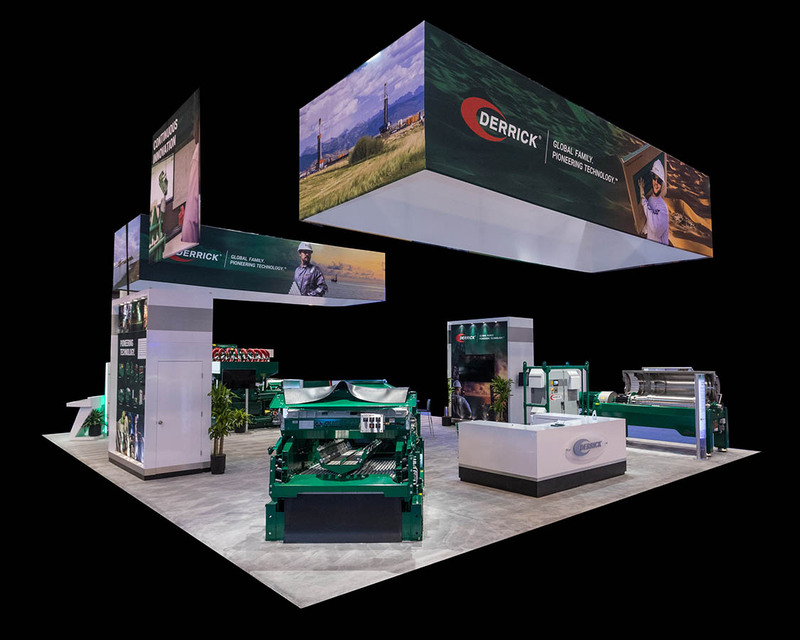 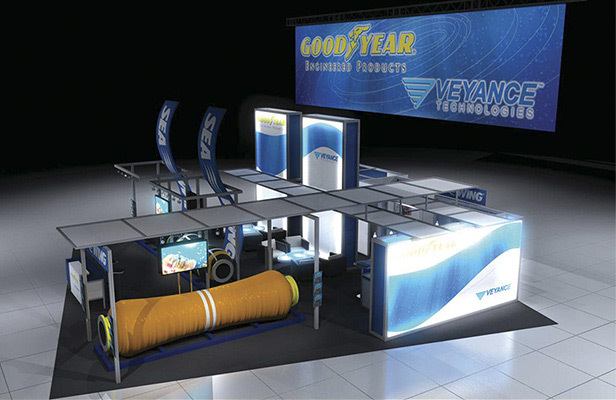 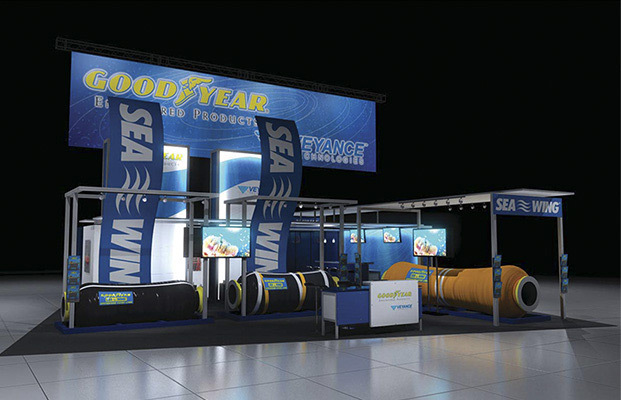 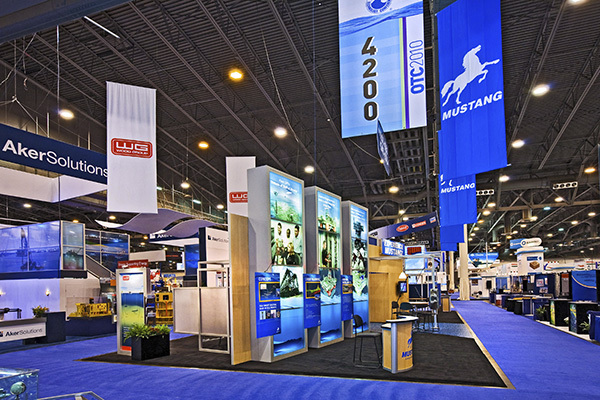 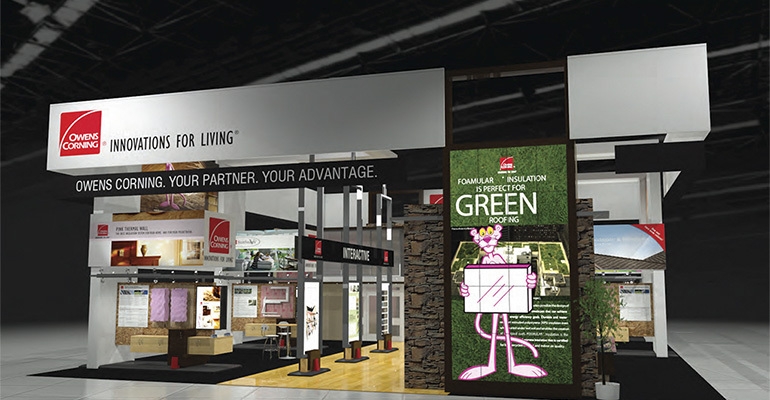 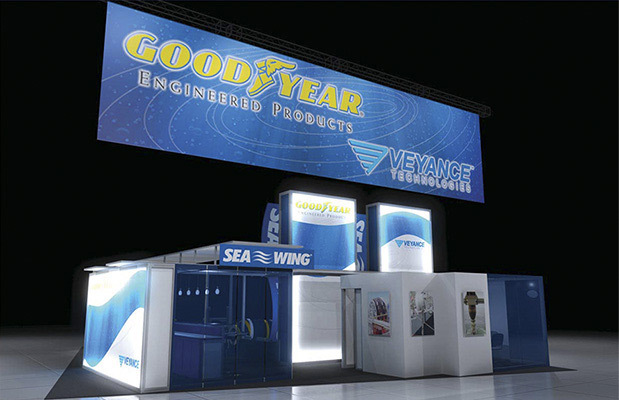 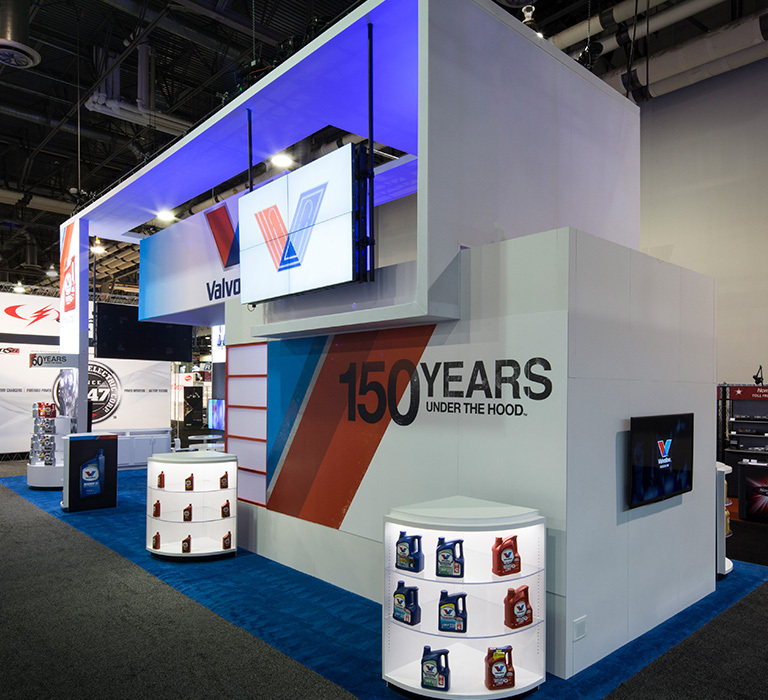 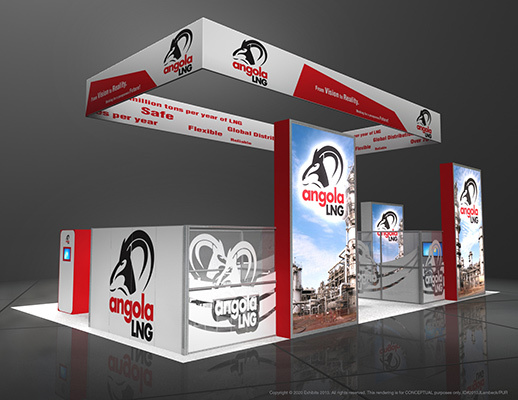 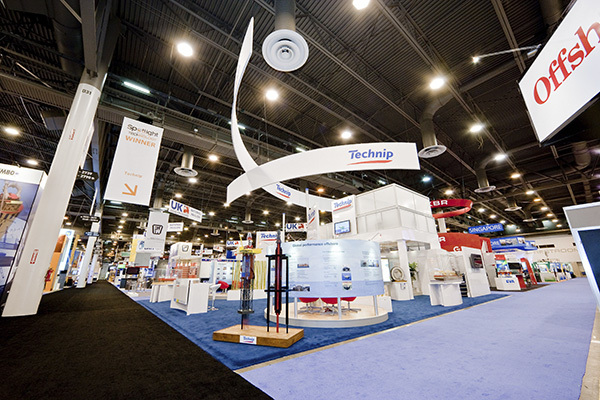 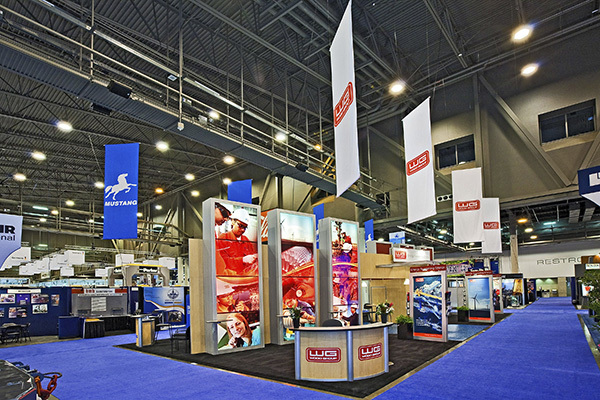 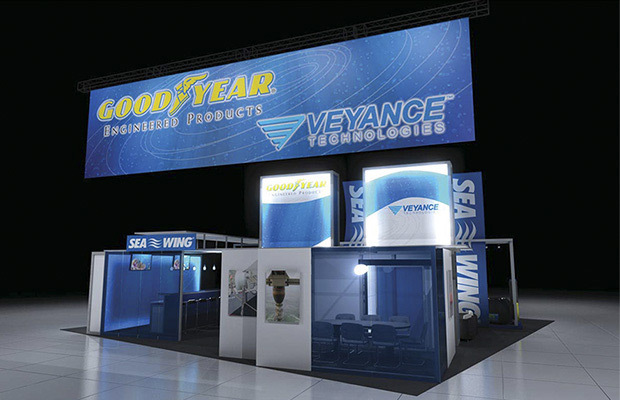 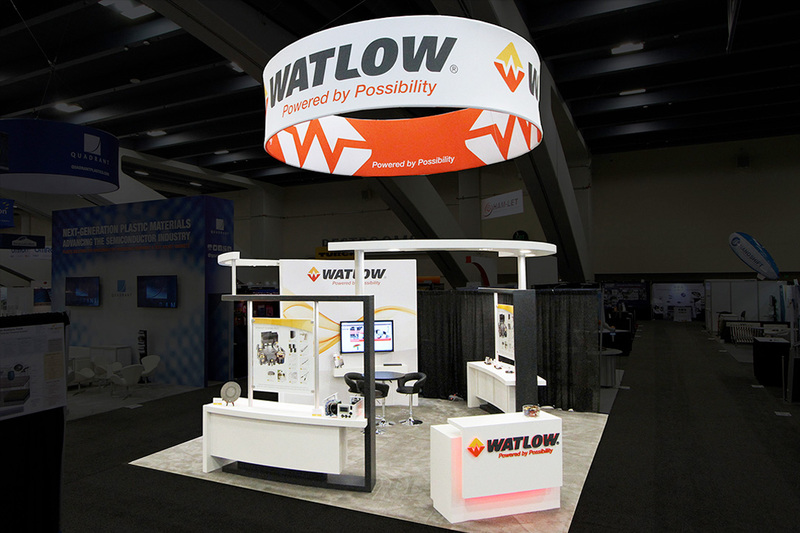 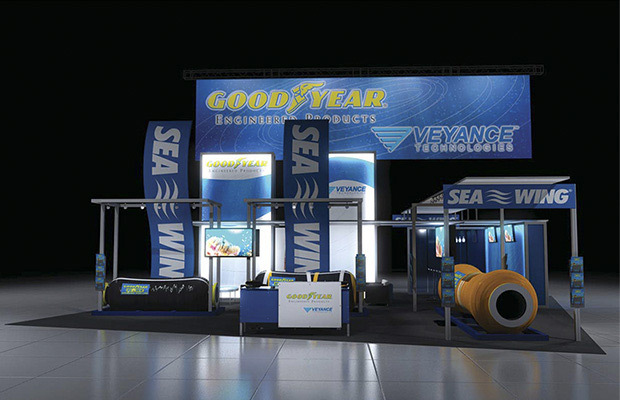 Prominent overhead graphic banner with logos, as well as several well-placed graphic banners and stands, draw visitors in to learn more. 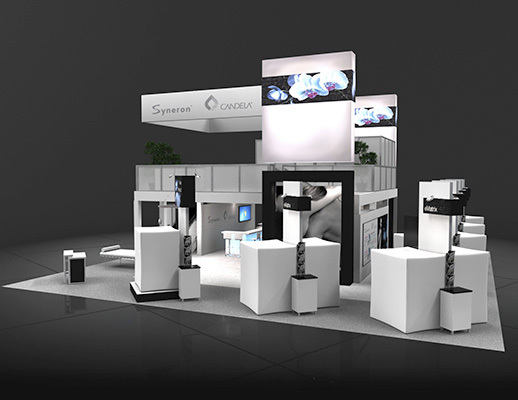 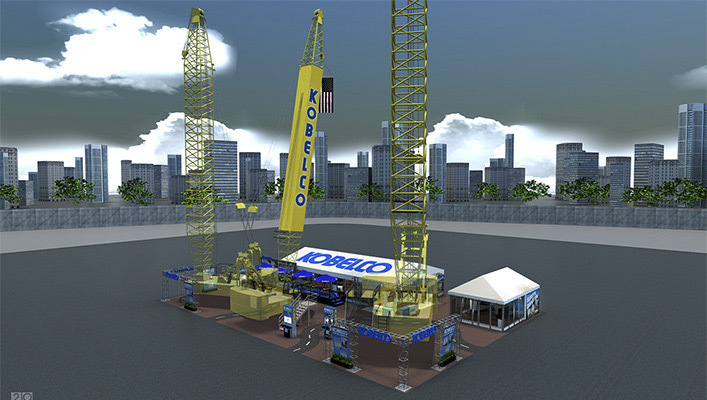 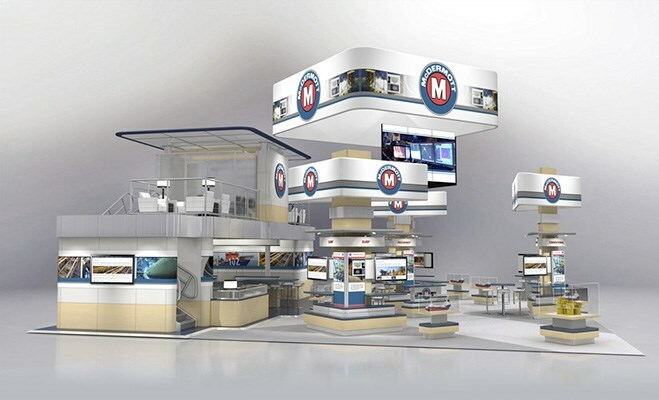 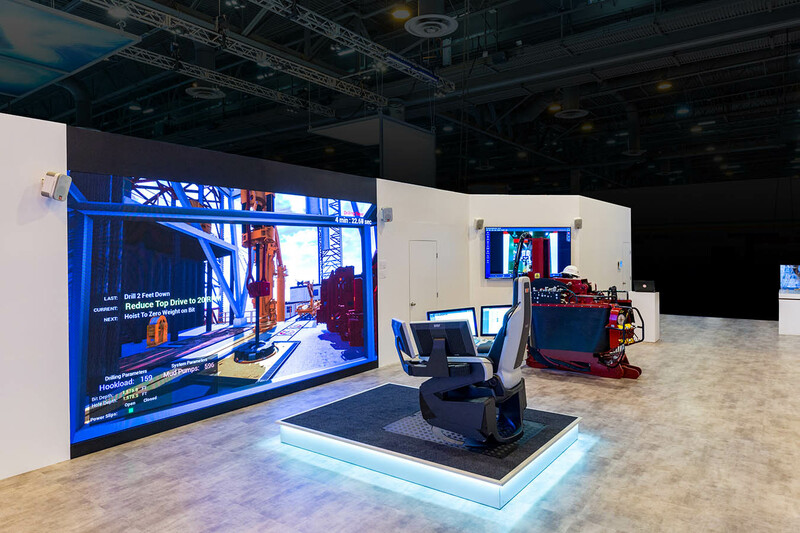 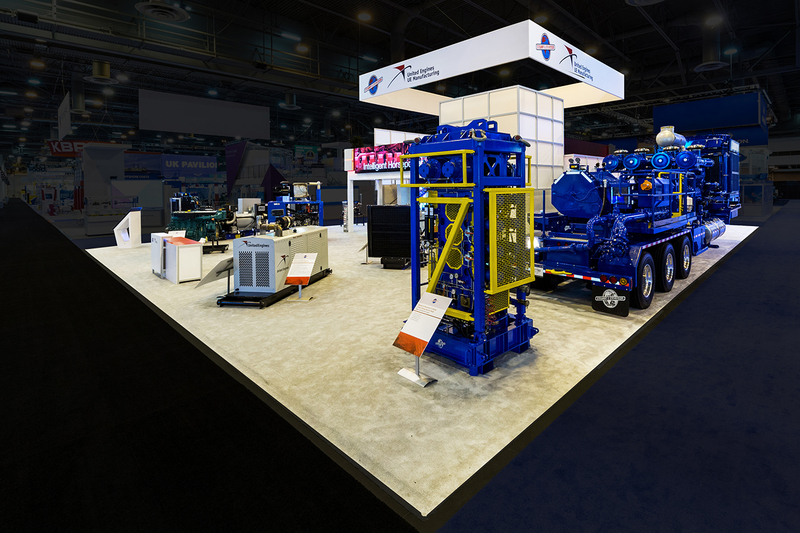 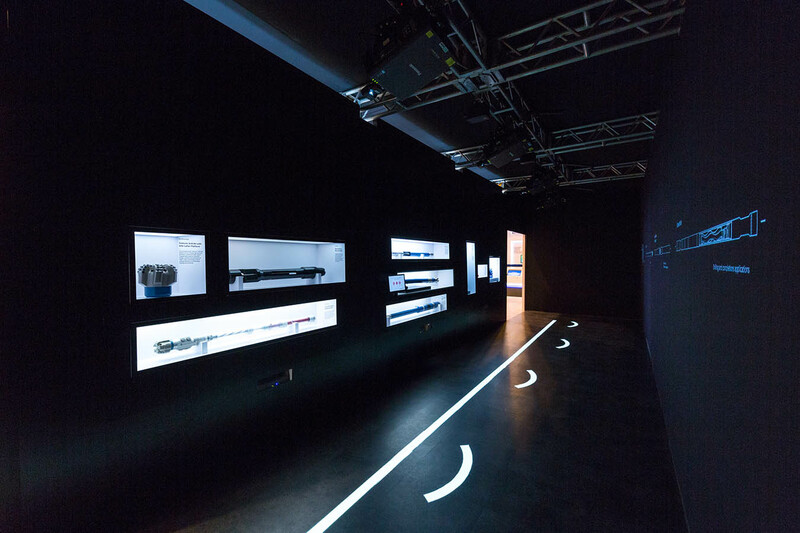 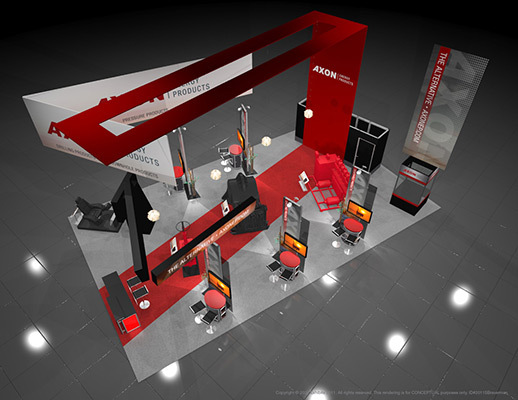 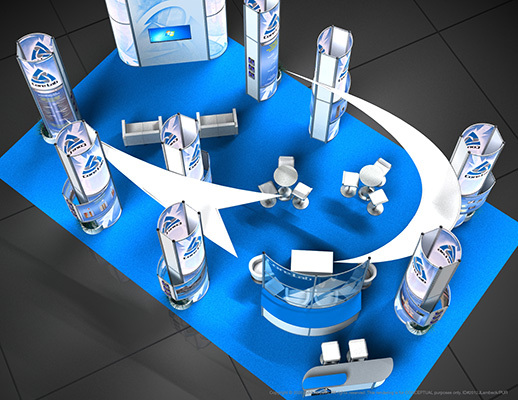 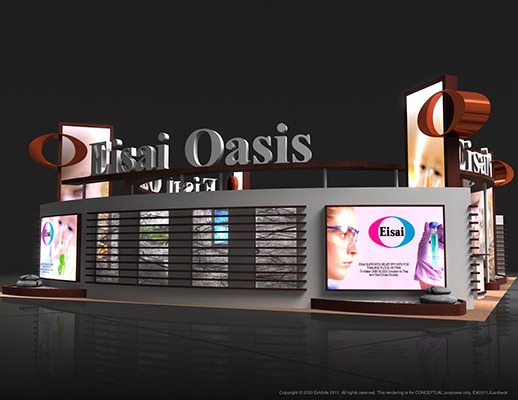 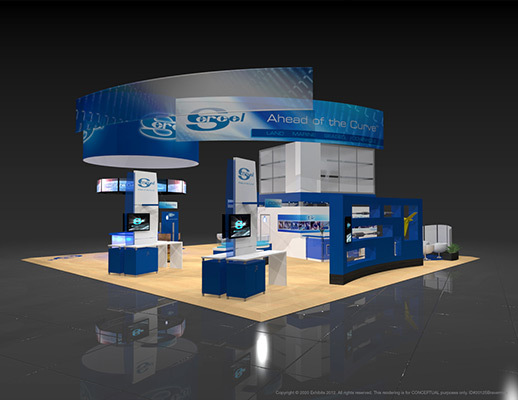 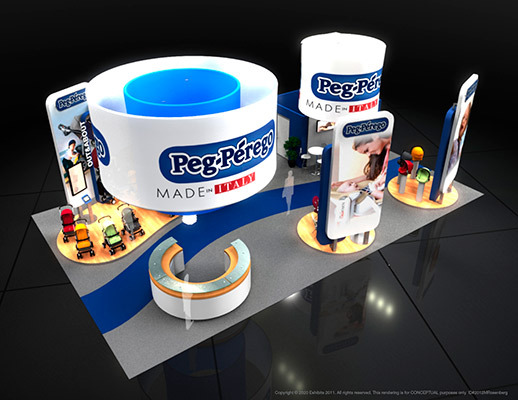 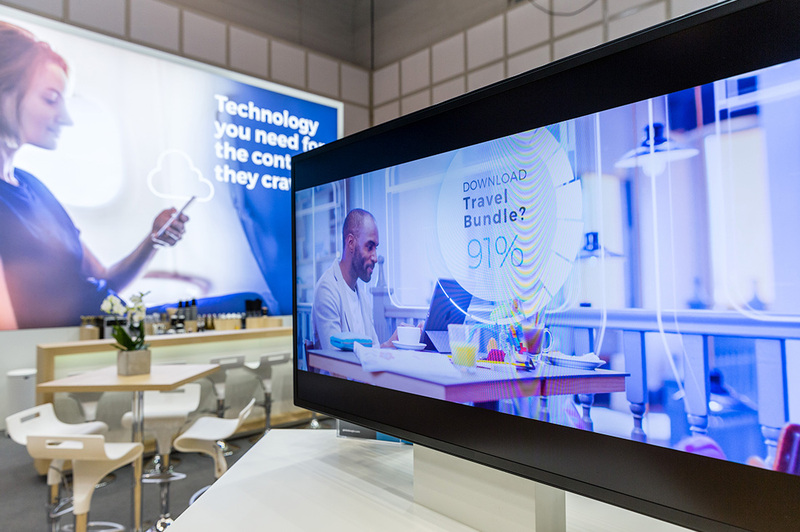 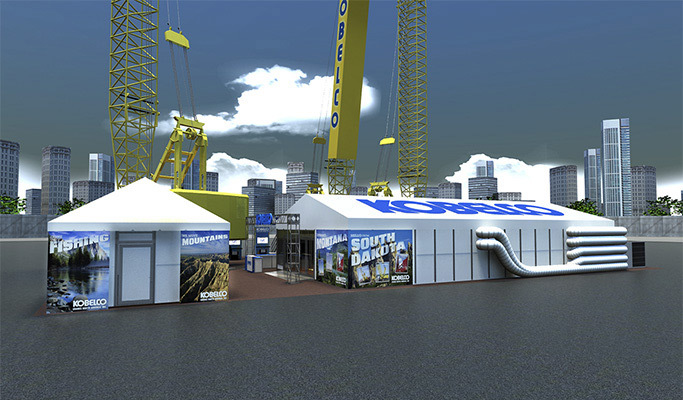 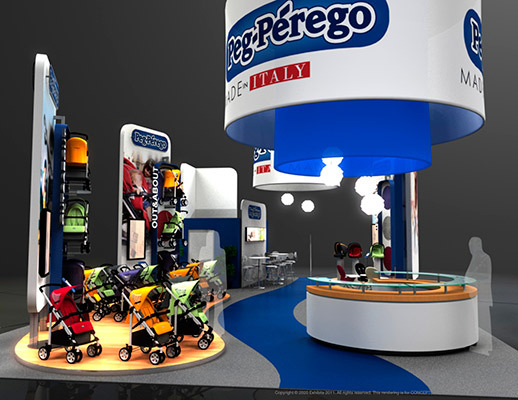 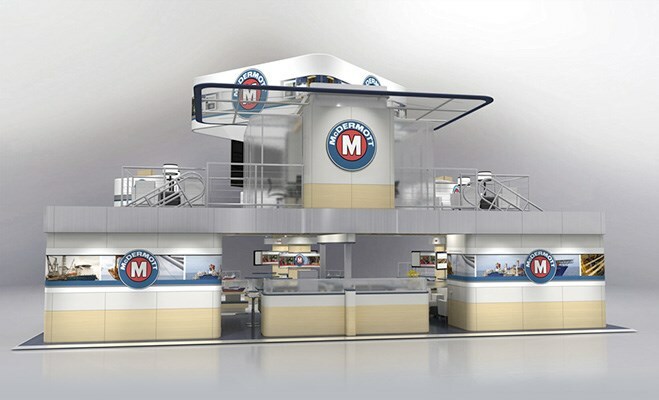 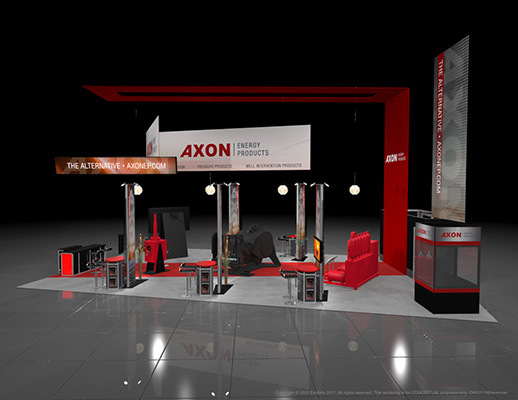 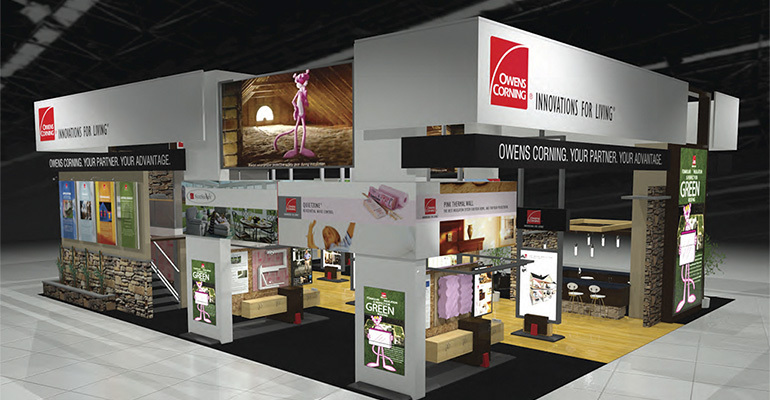 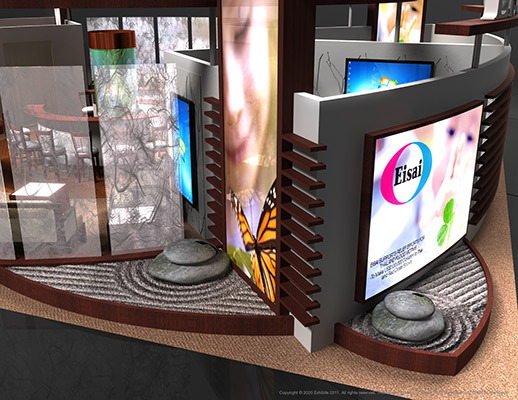 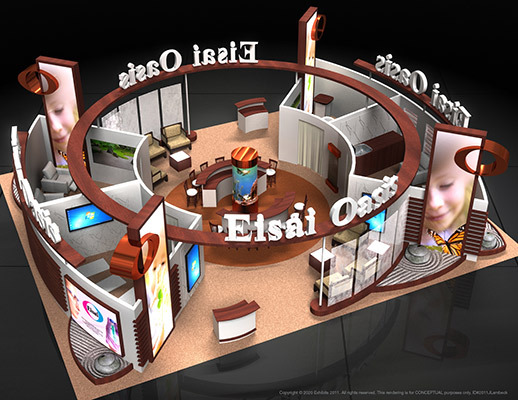 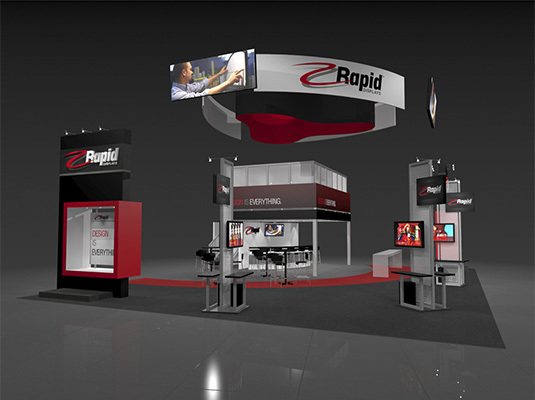 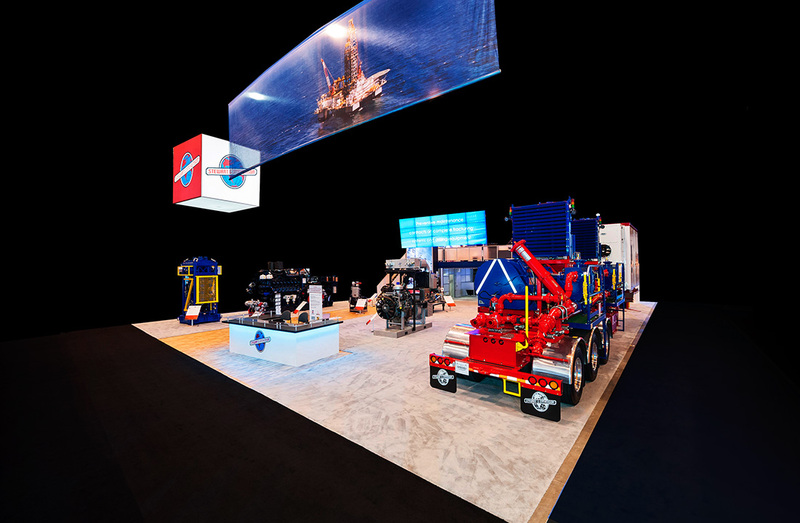 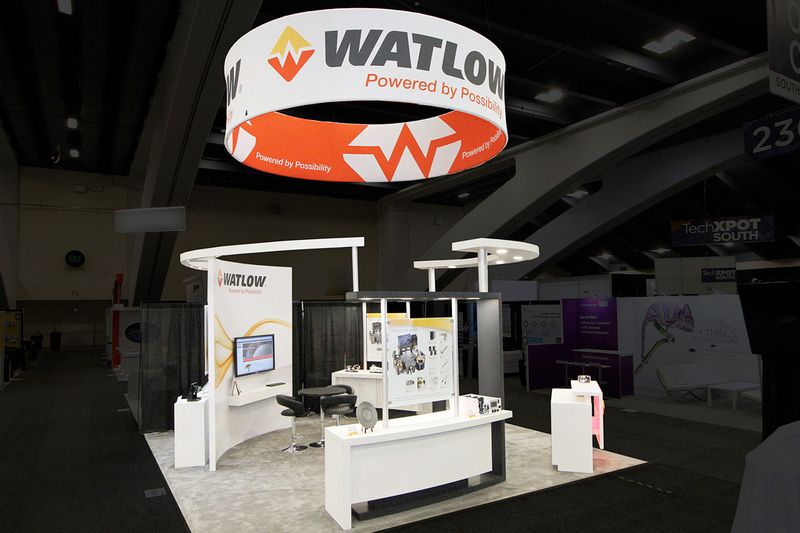 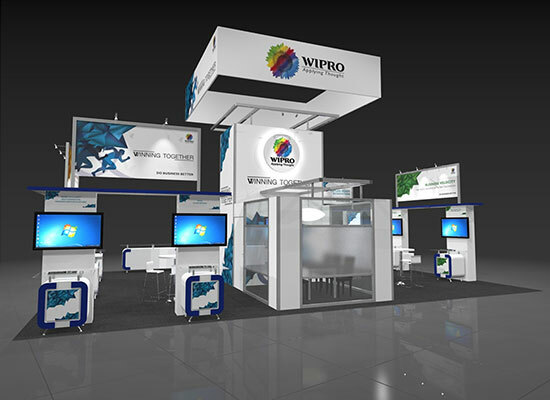 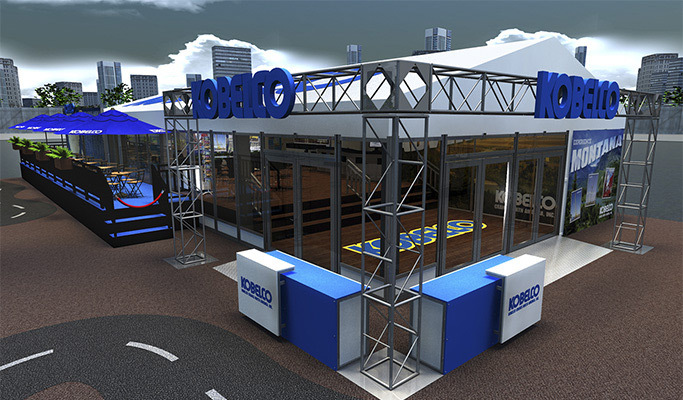 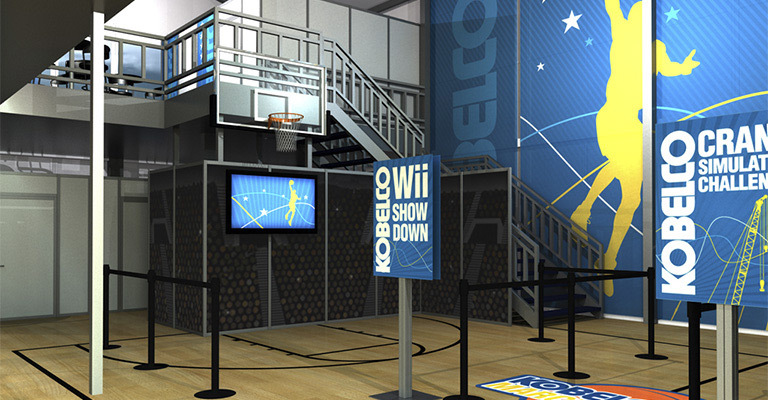 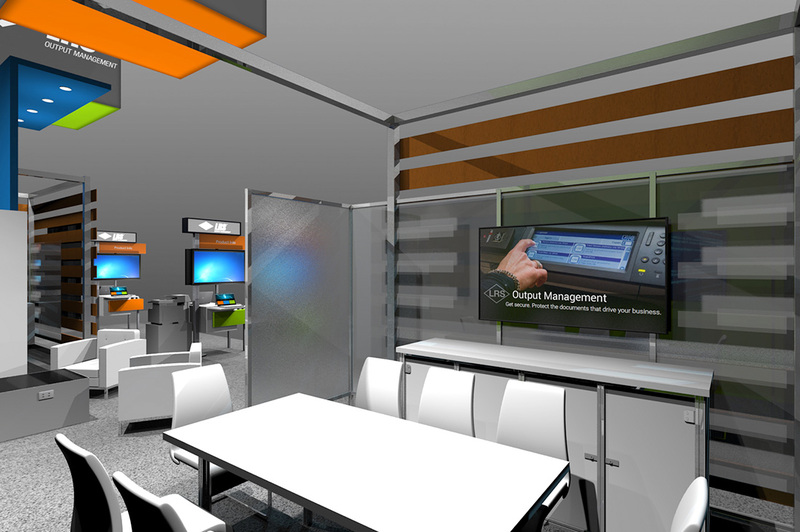 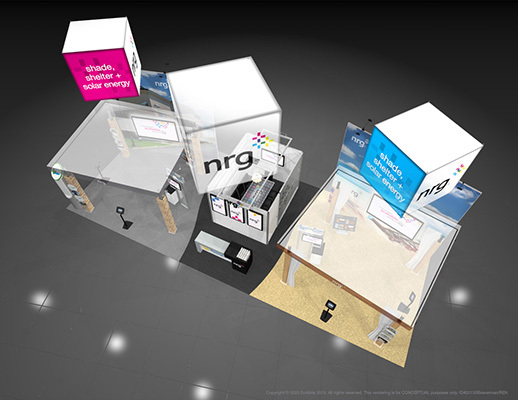 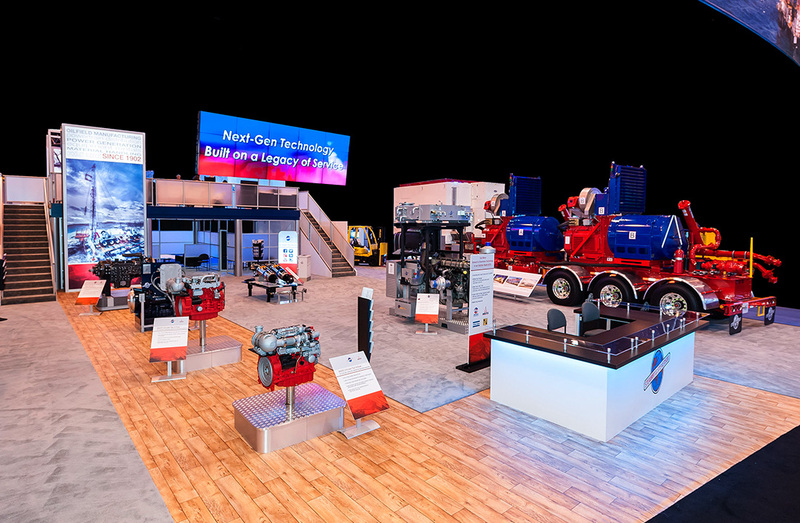 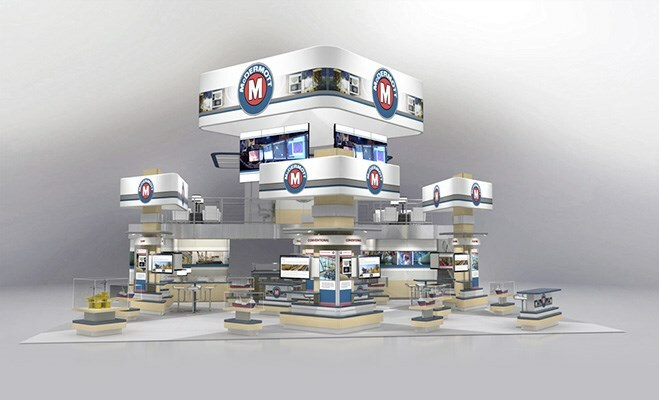 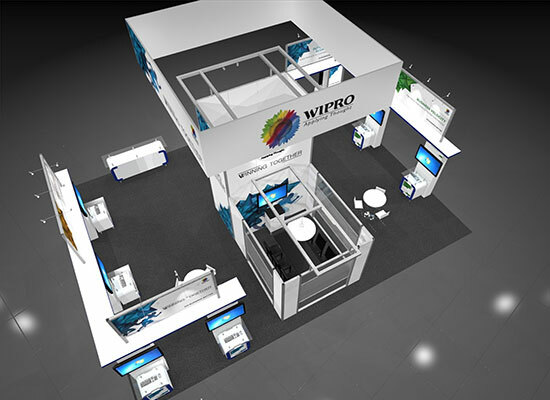 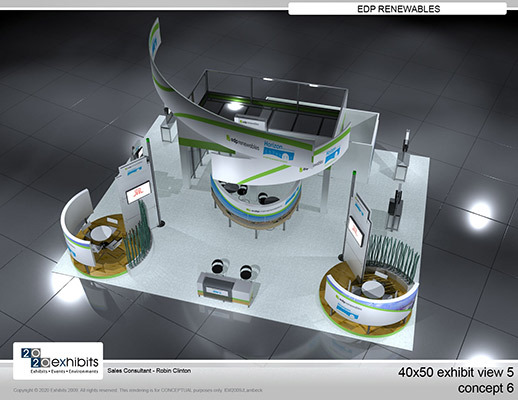 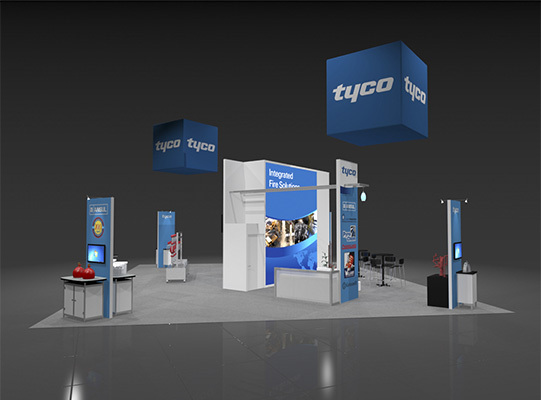 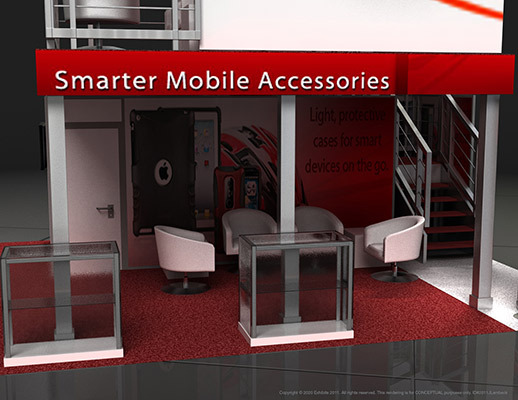 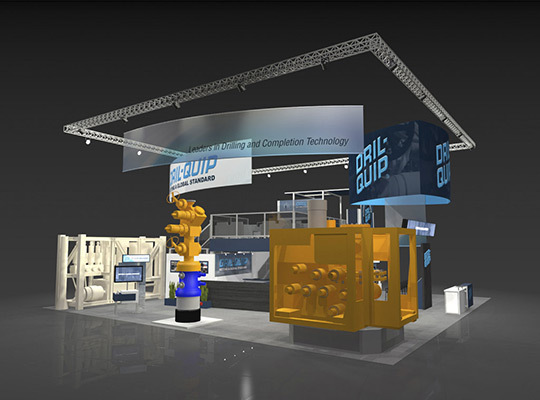 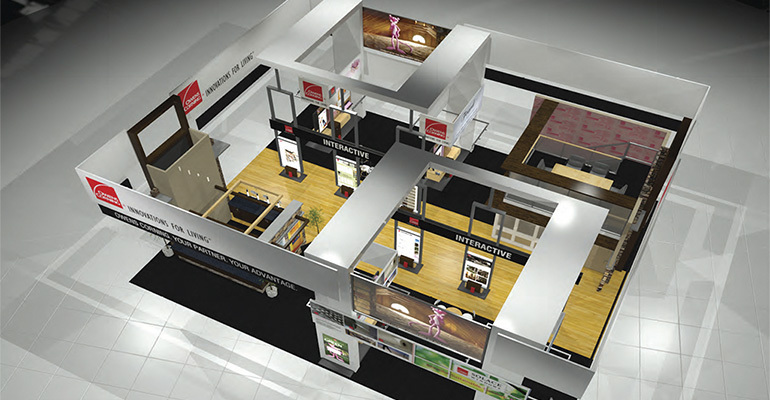 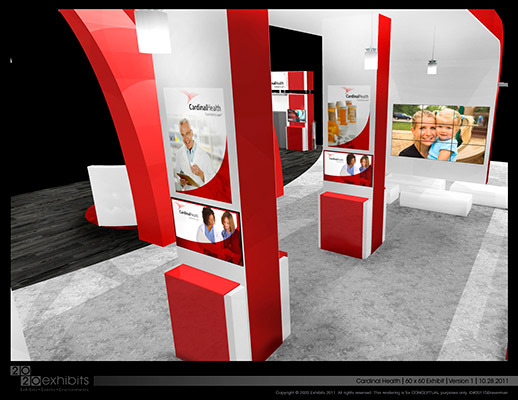 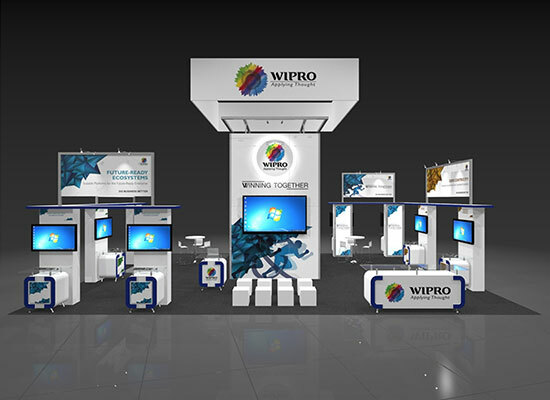 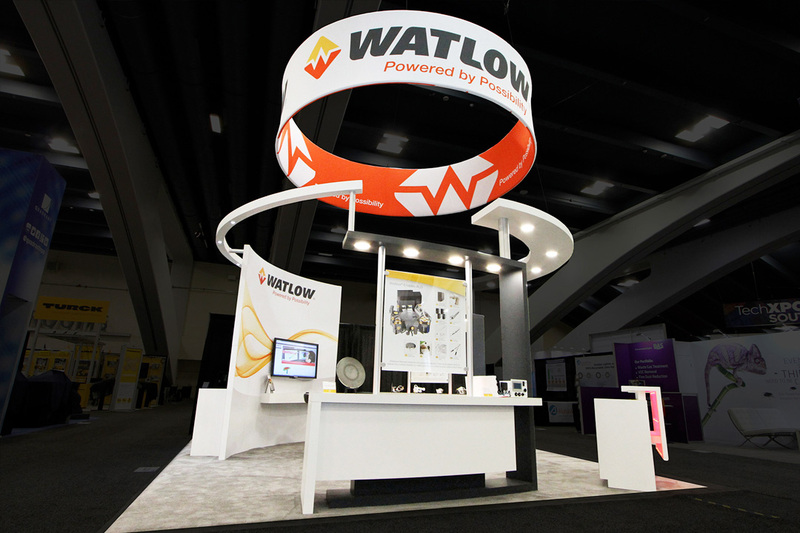 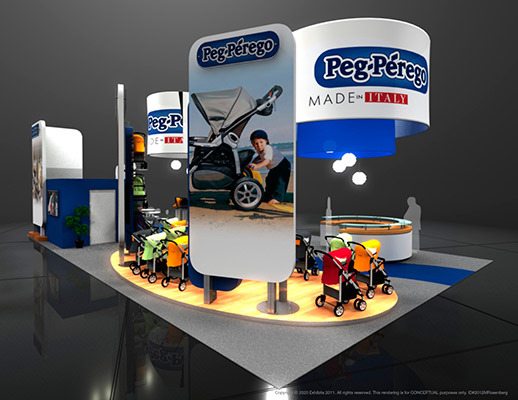 Several product display stations allow users to view and interact with products first-hand. 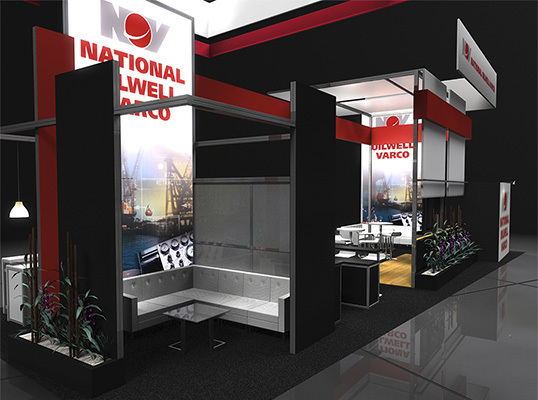 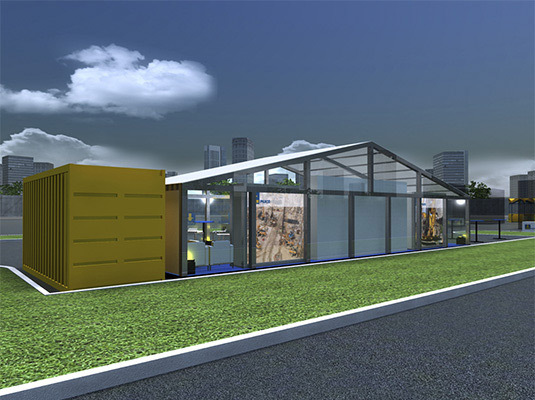 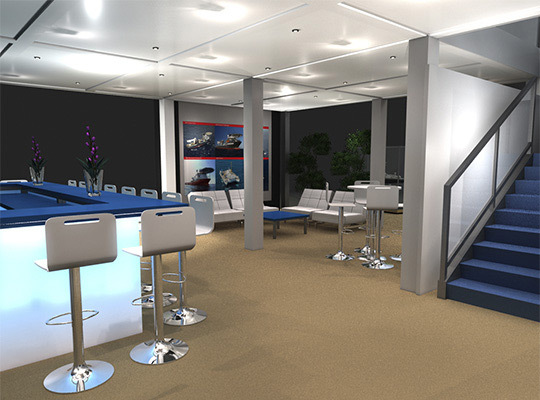 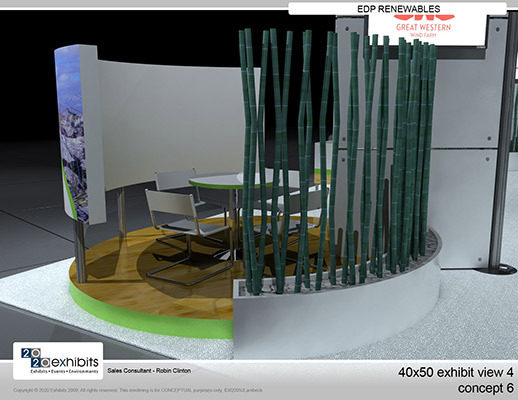 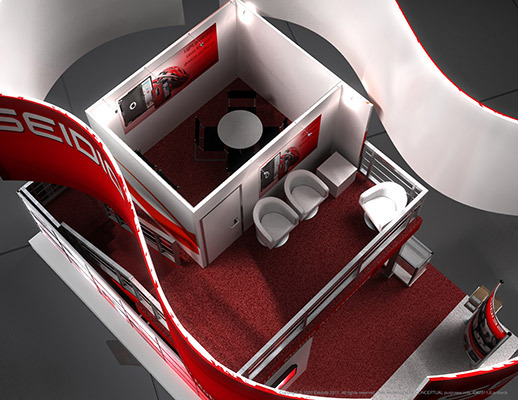 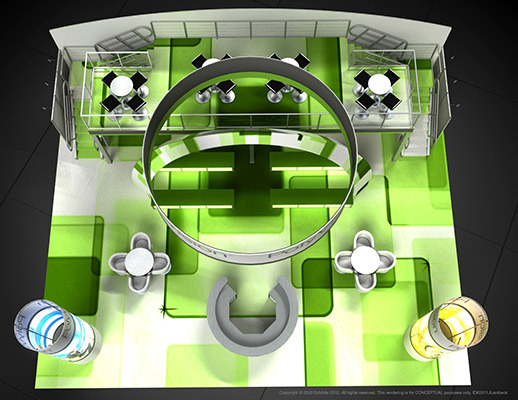 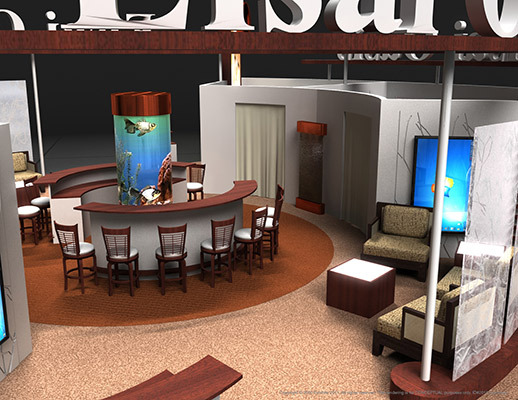 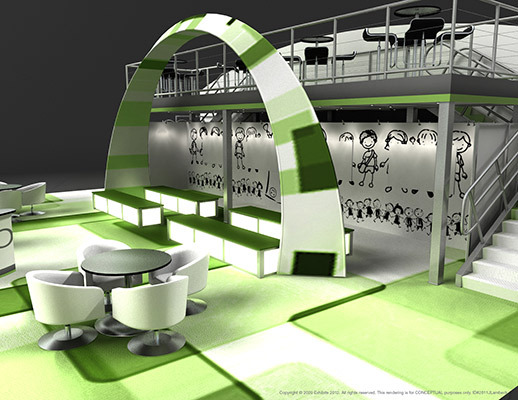 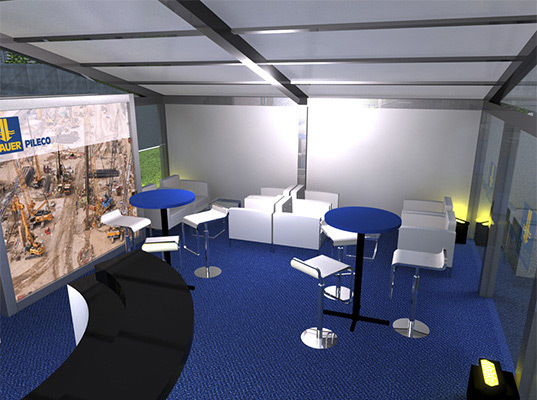 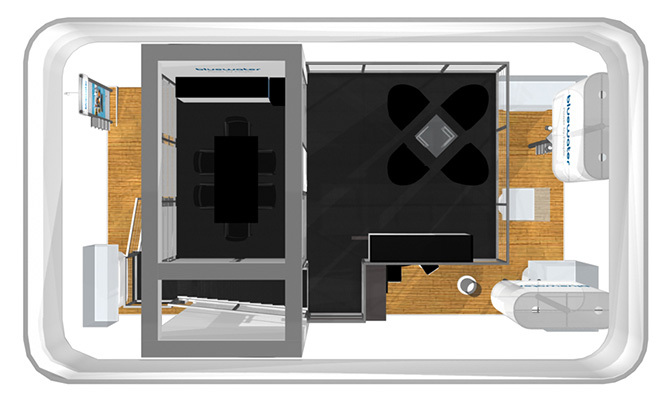 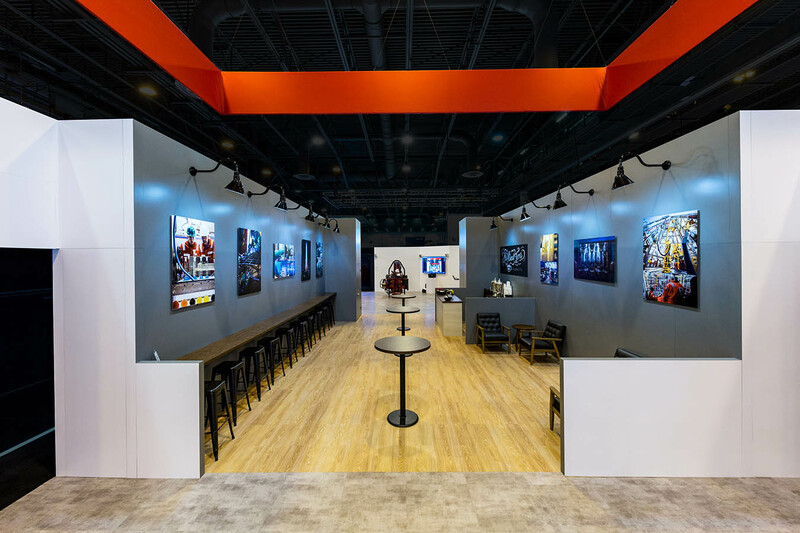 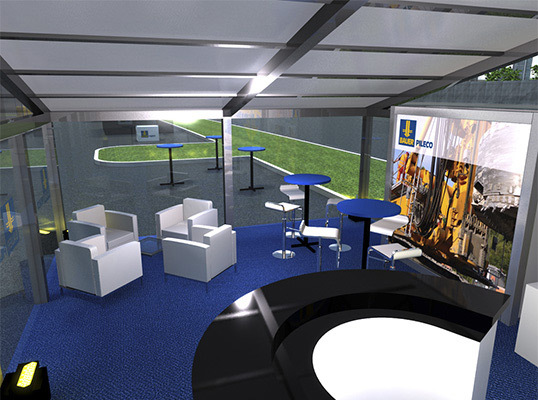 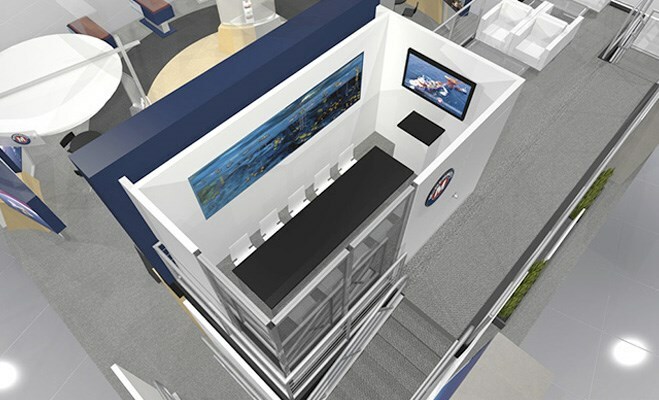 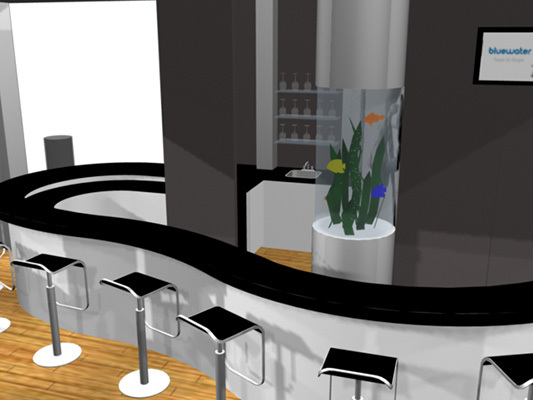 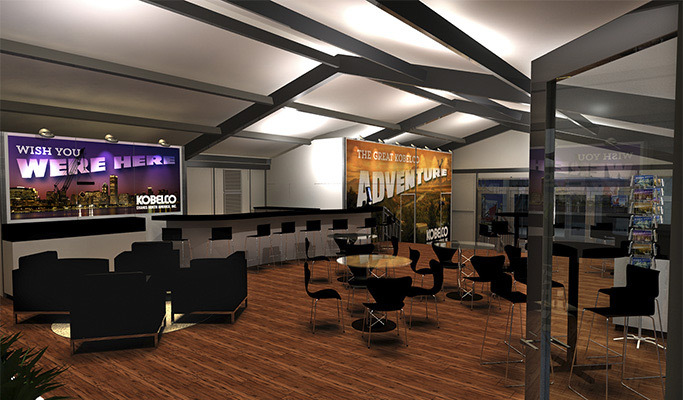 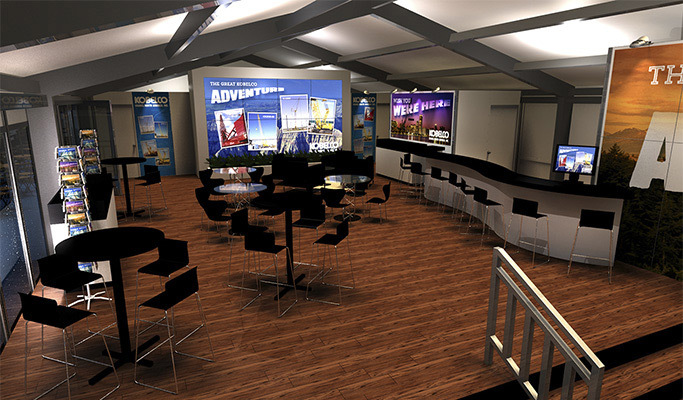 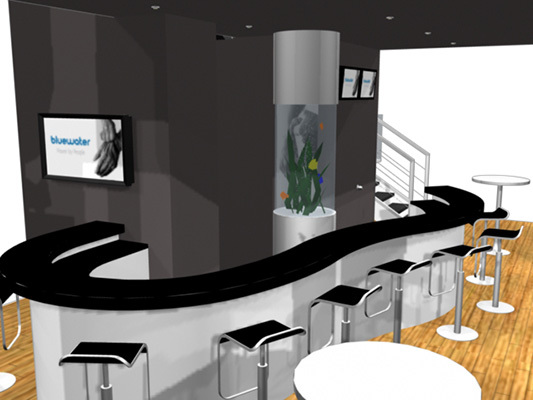 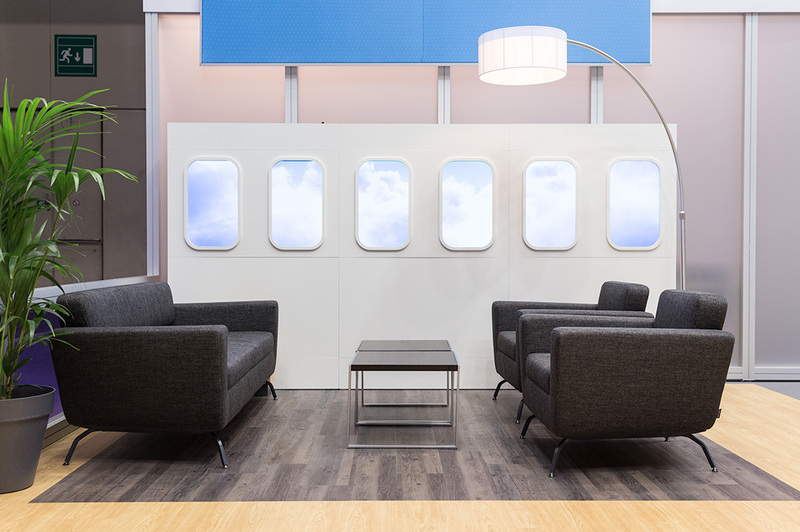 Walled-in private meeting areas are available to cater to potential customers who visit the exhibit. 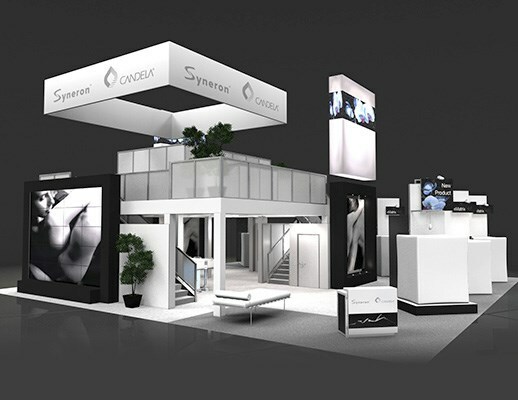 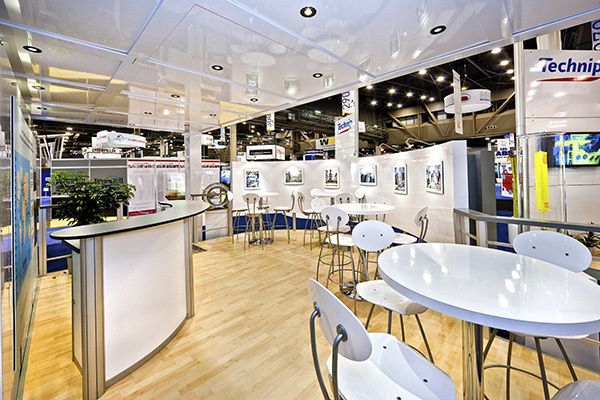 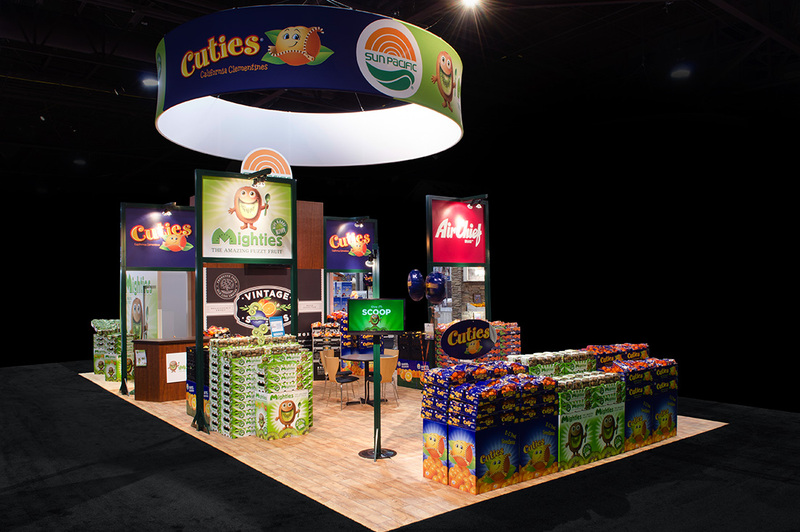 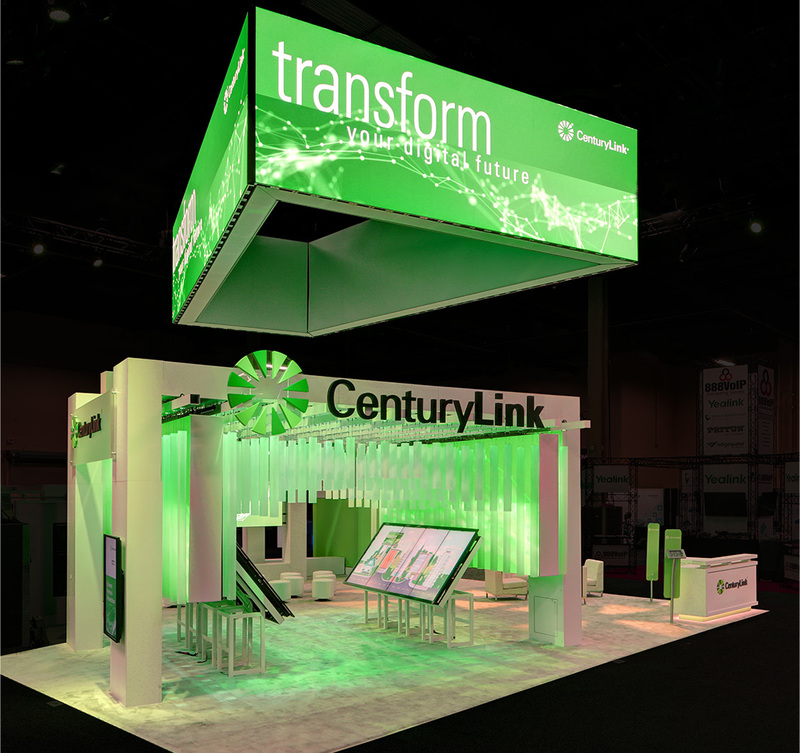 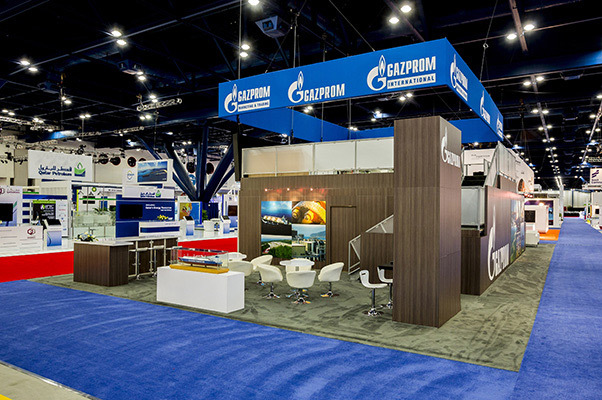 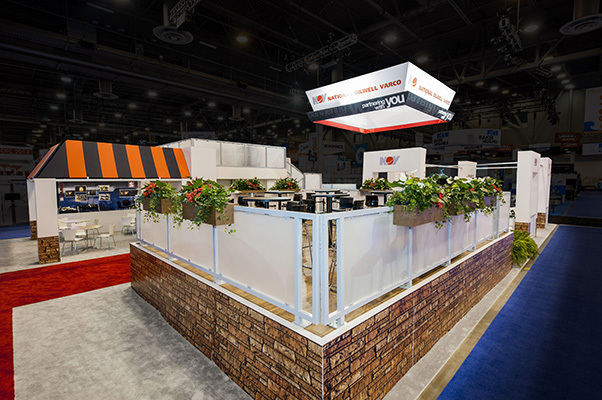 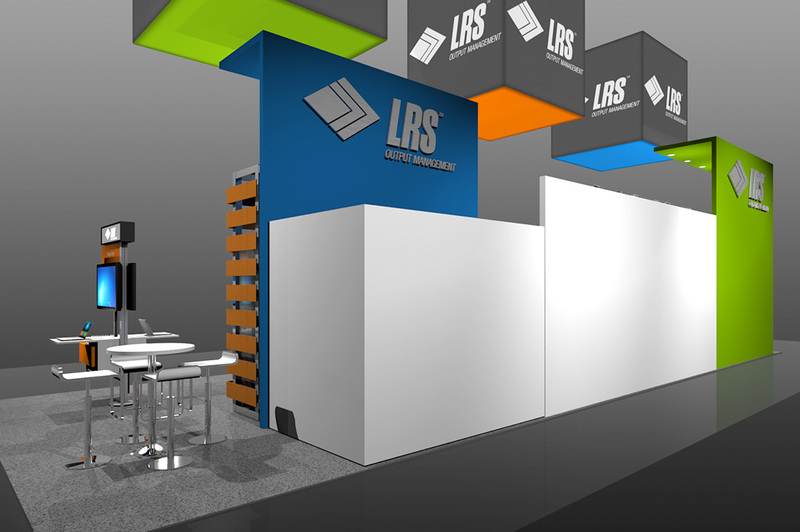 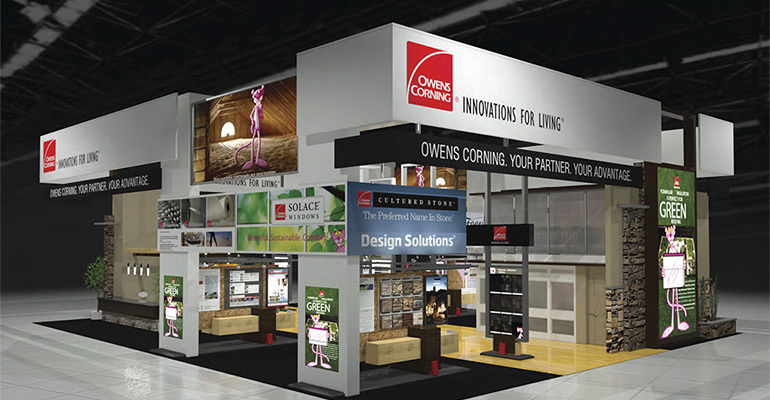 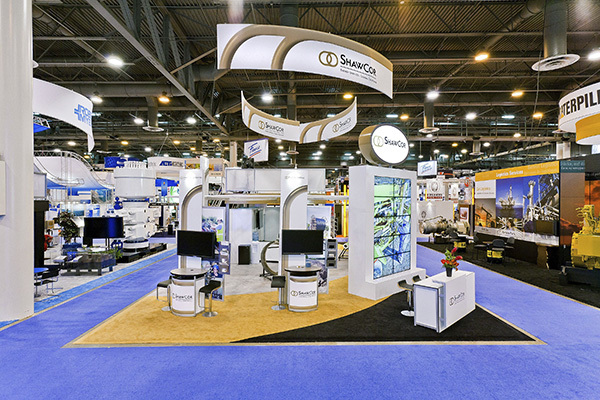 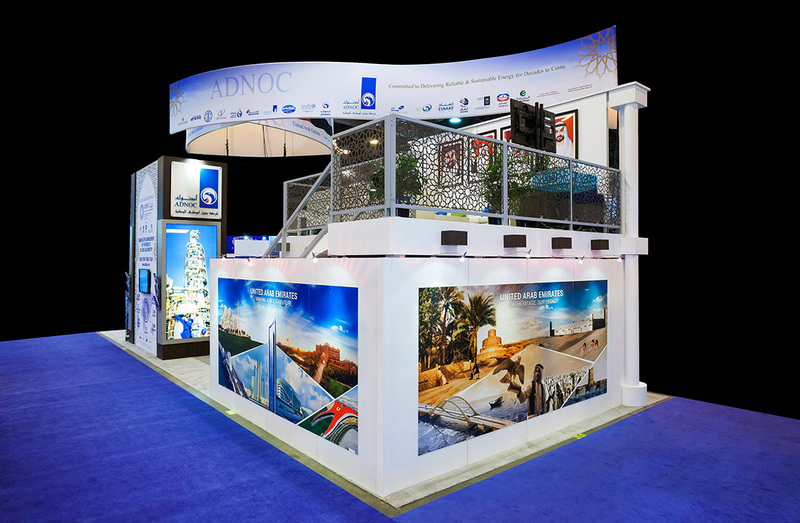 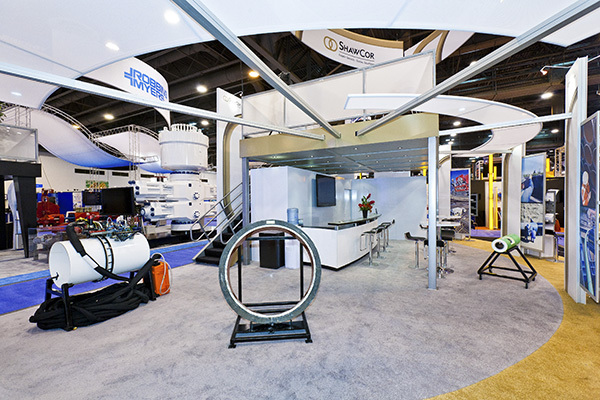 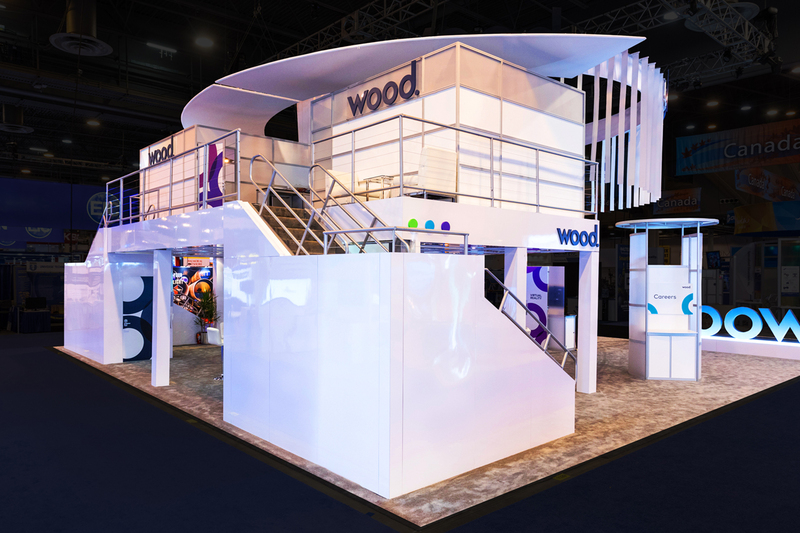 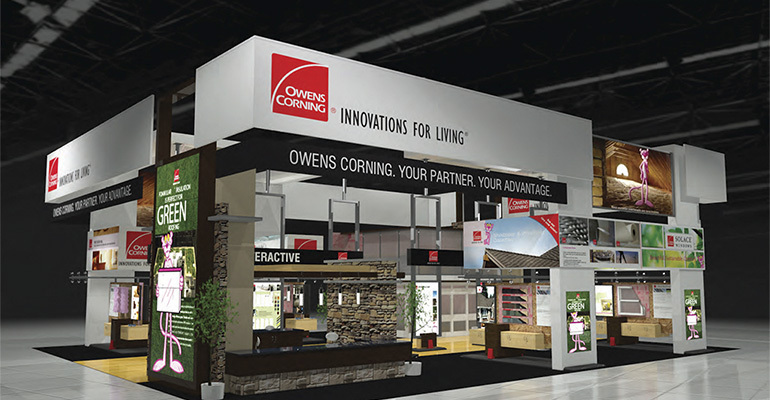 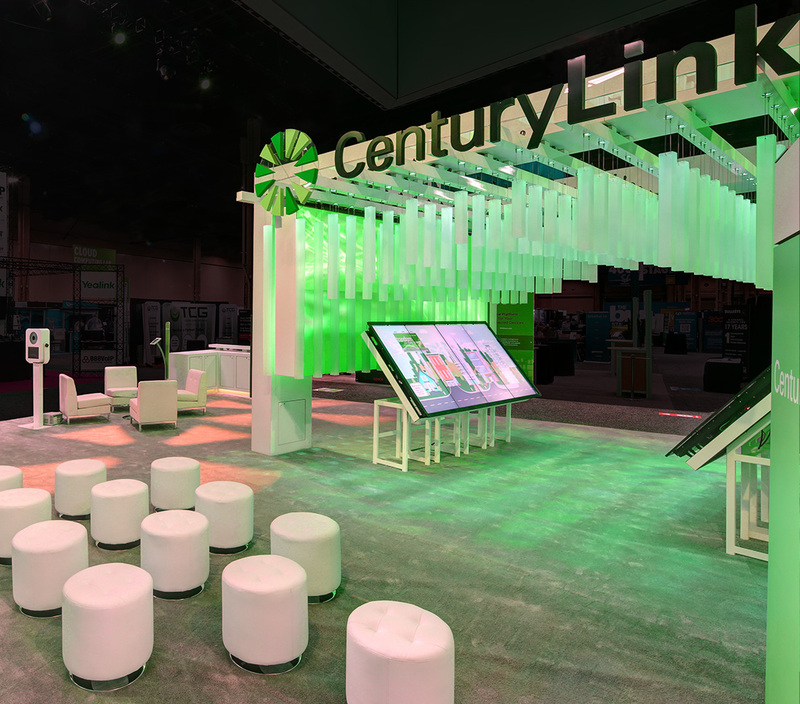 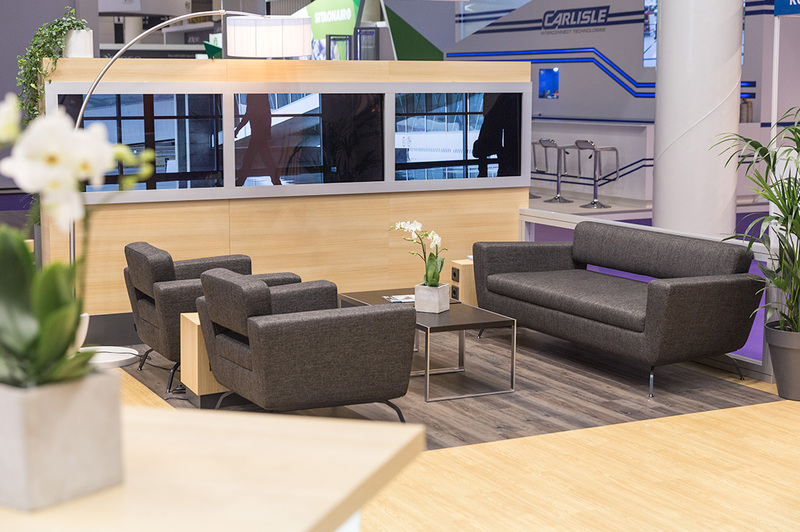 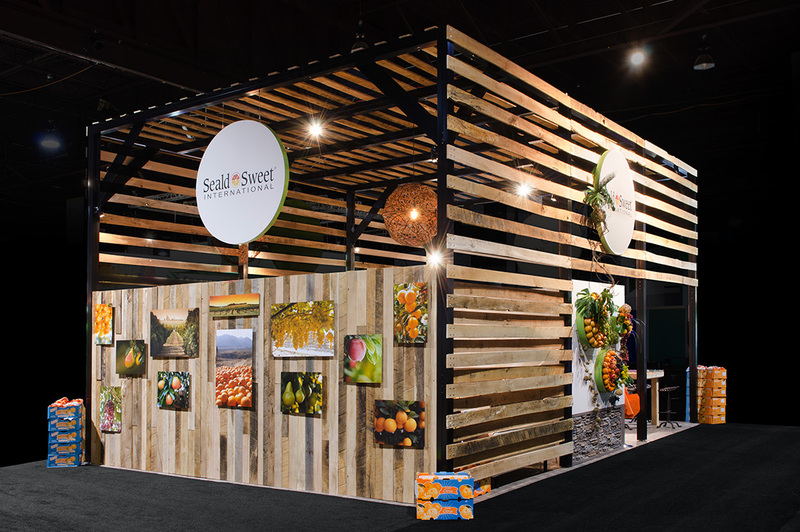 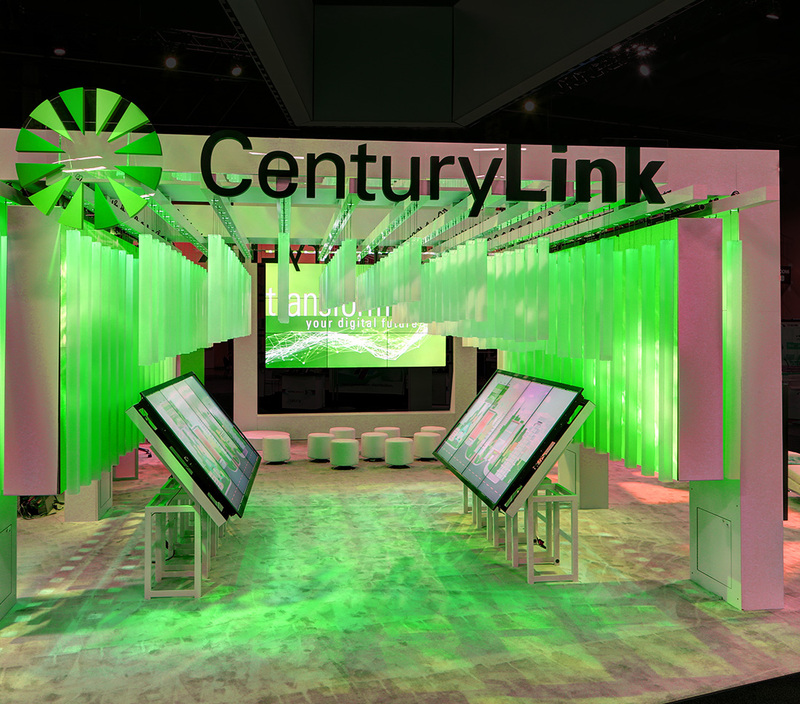 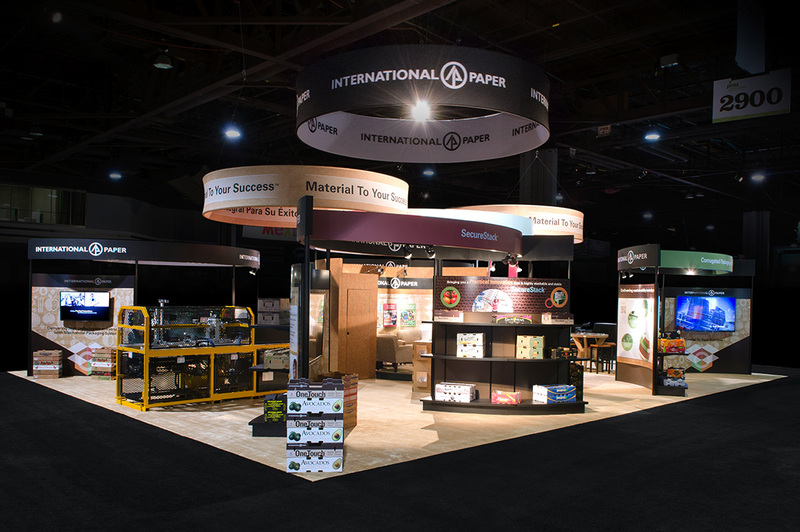 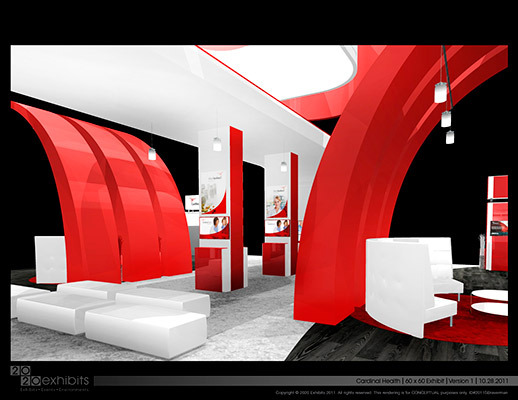 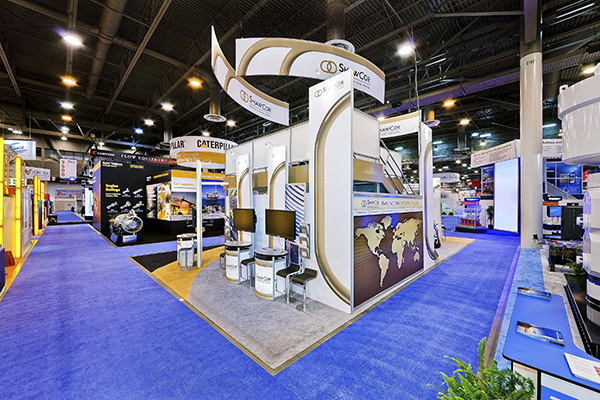 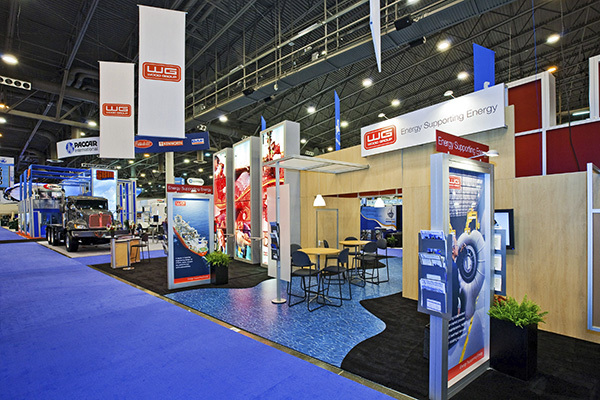 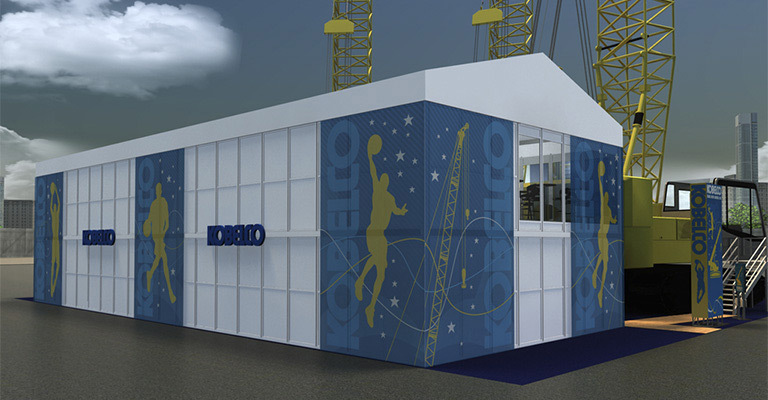 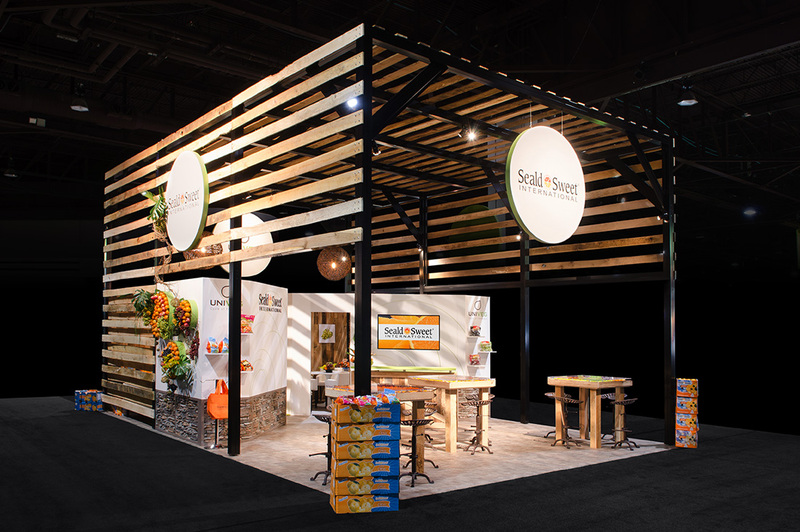 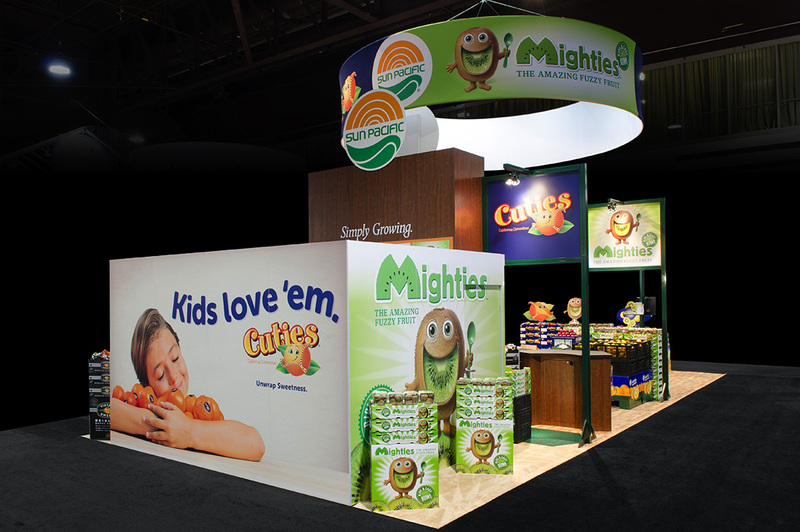 Artistic and modern, this booth allows for creative ways to display products. 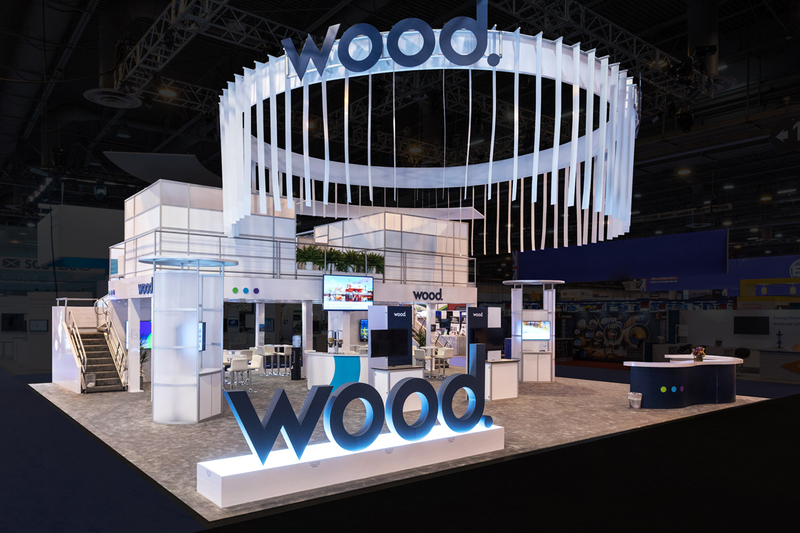 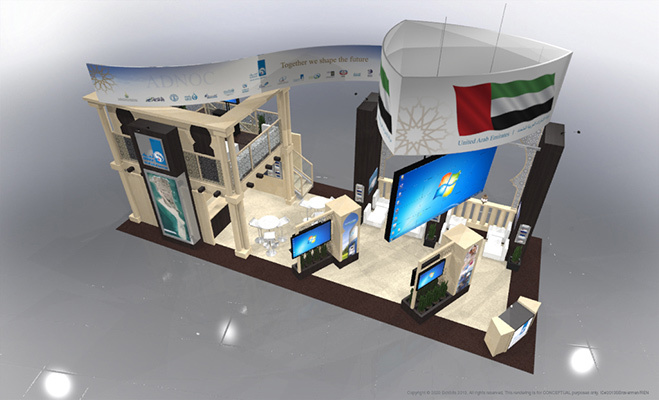 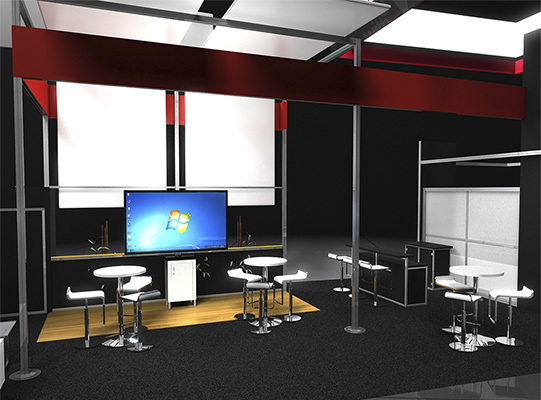 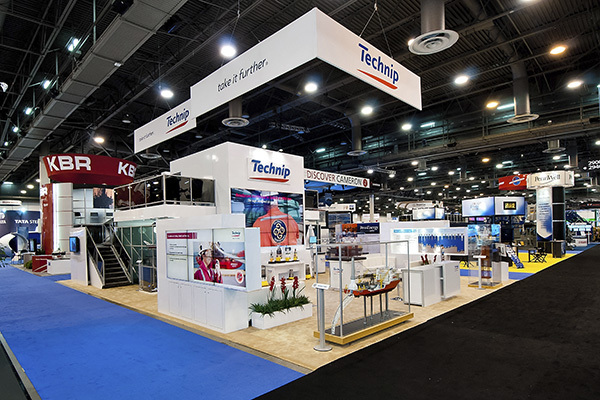 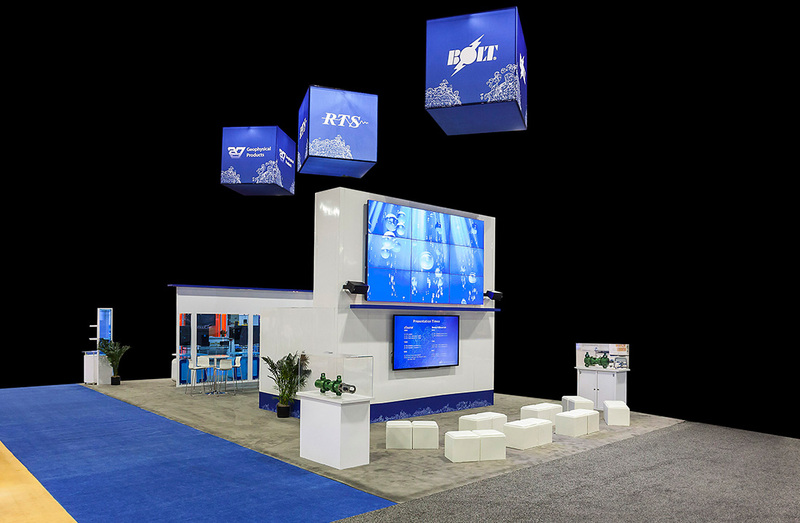 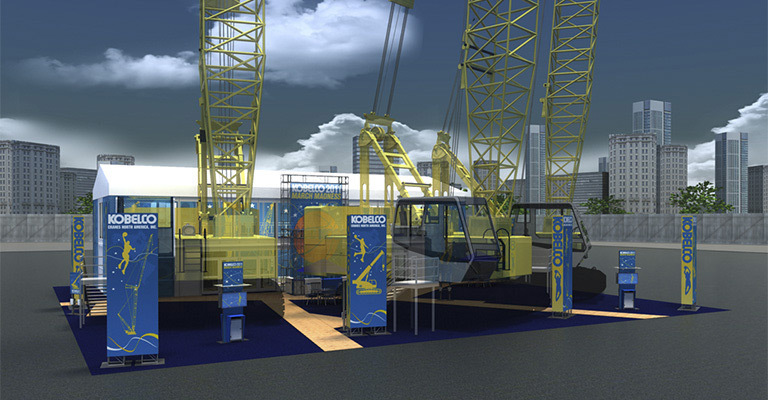 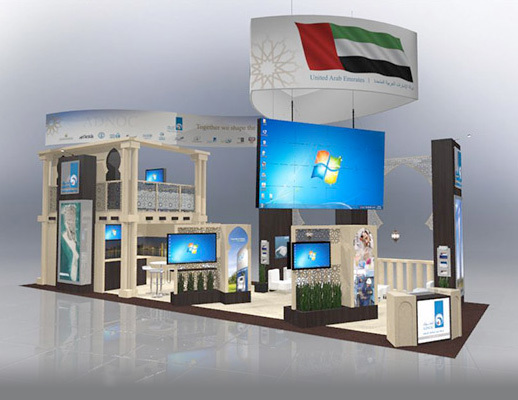 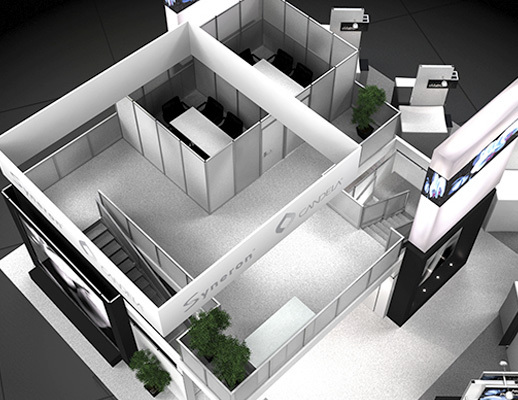 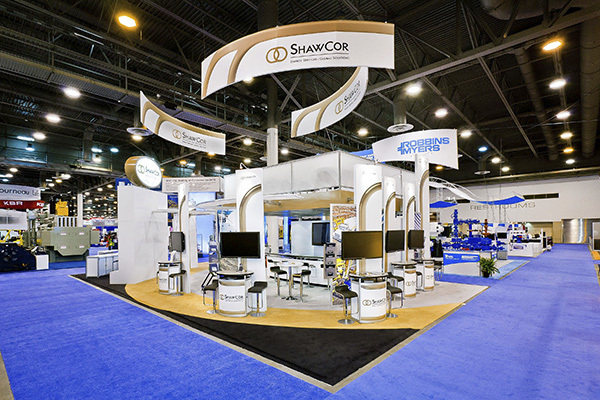 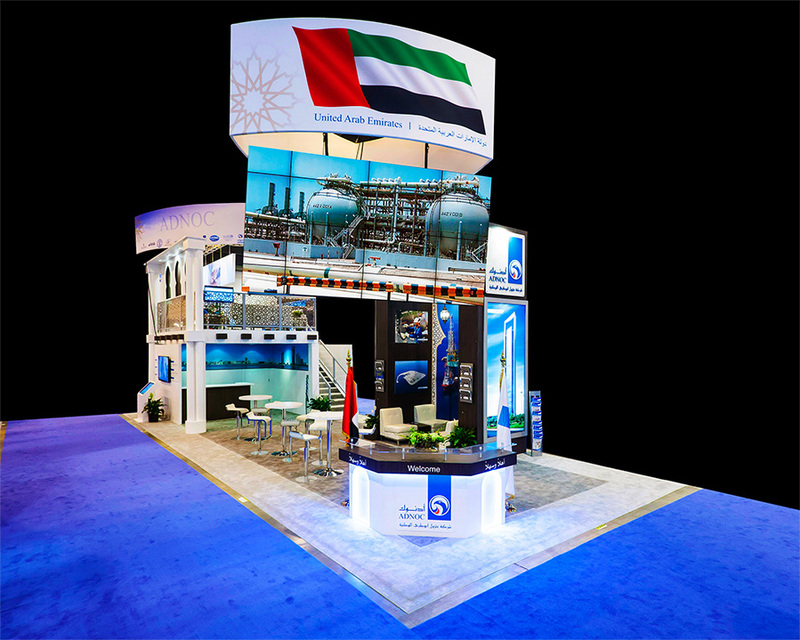 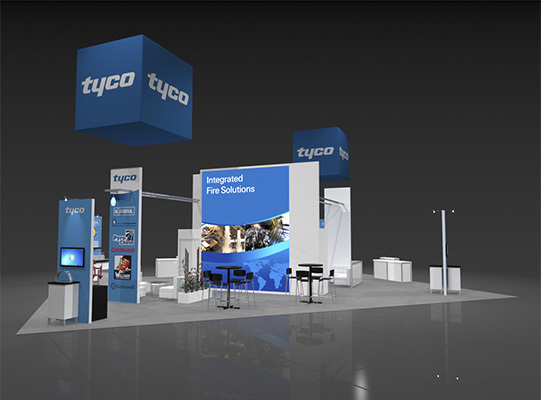 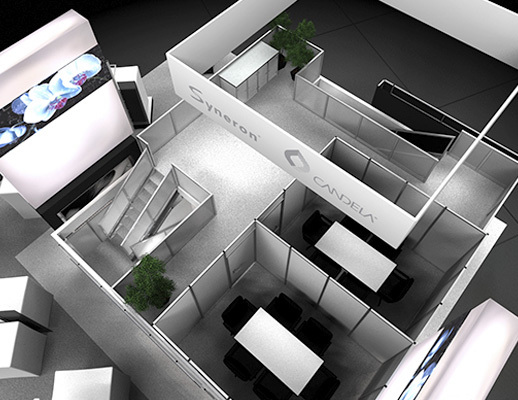 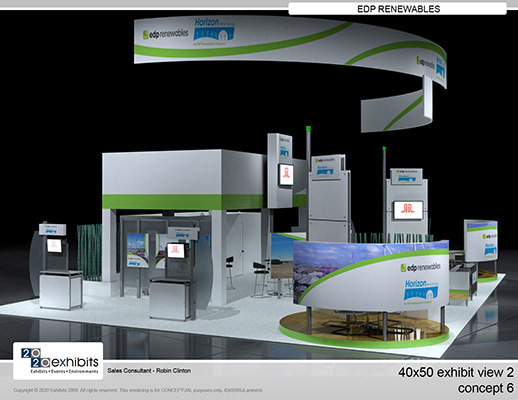 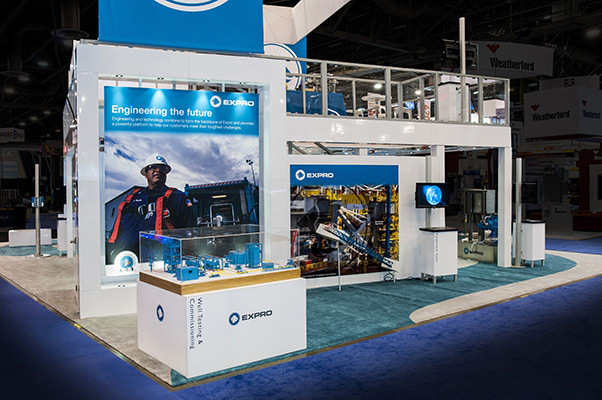 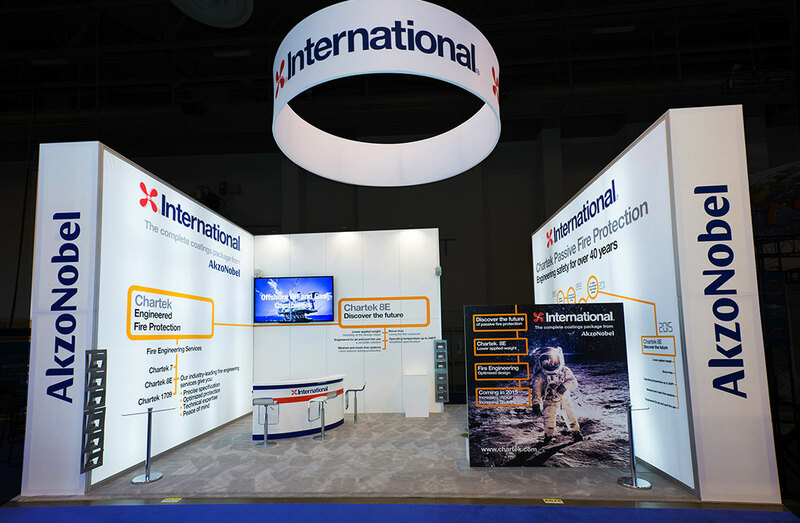 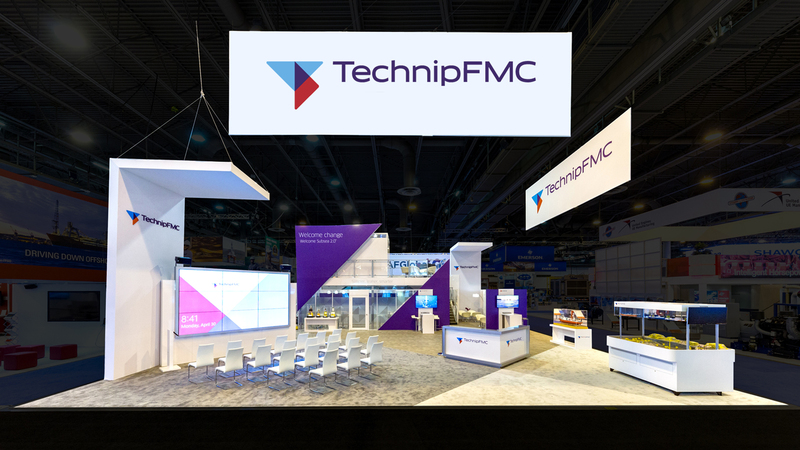 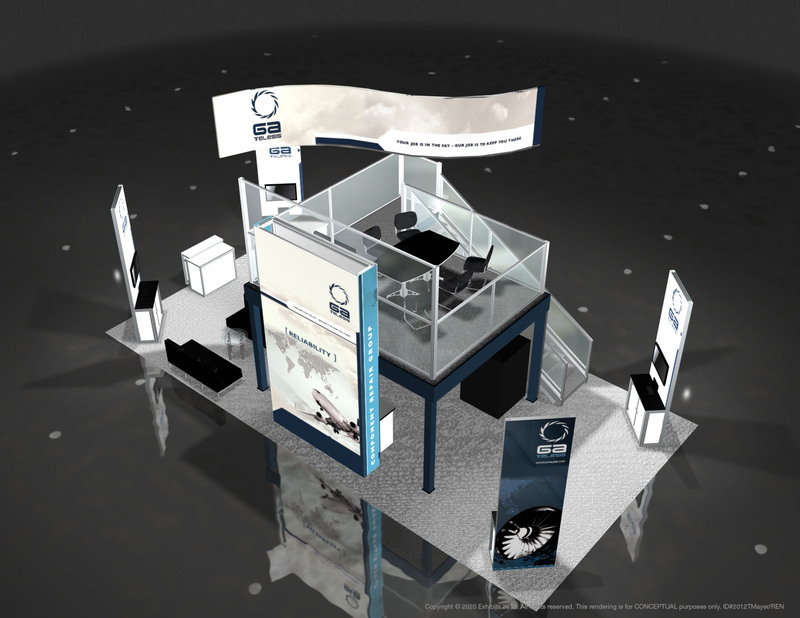 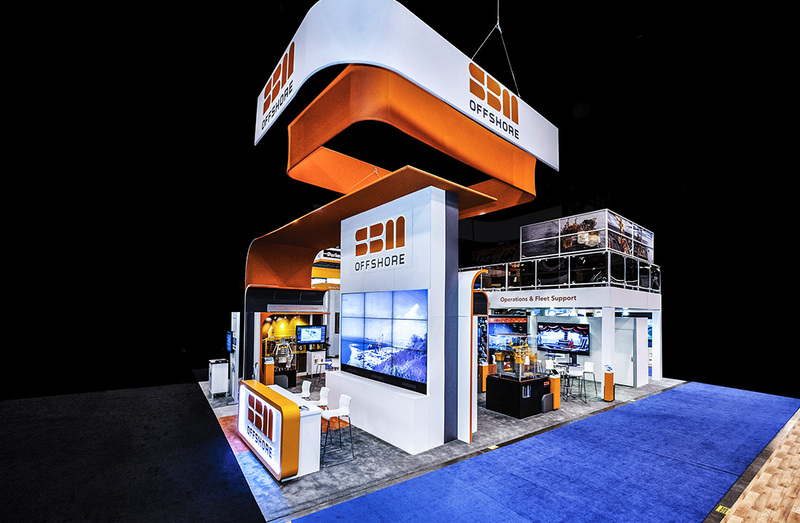 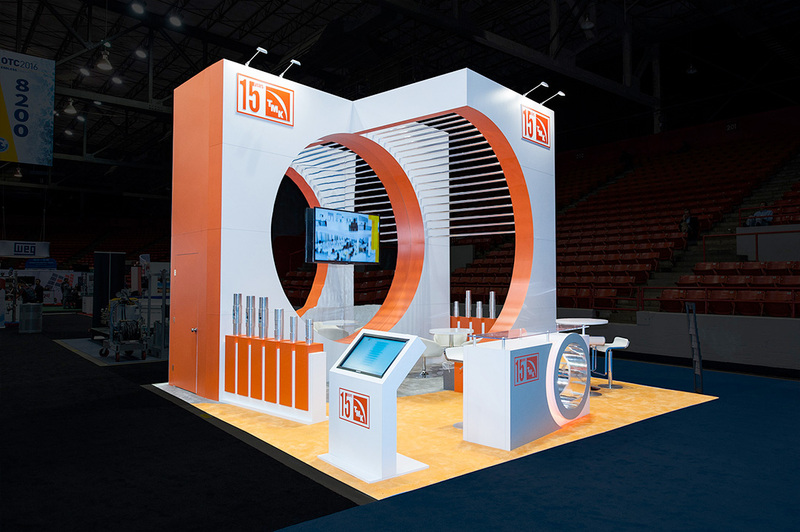 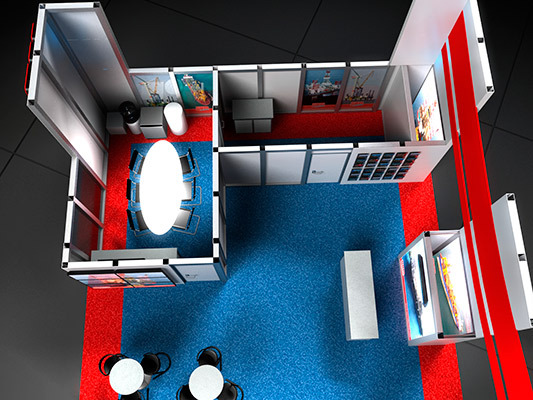 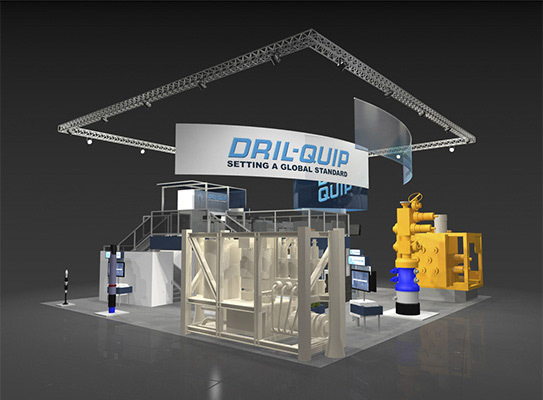 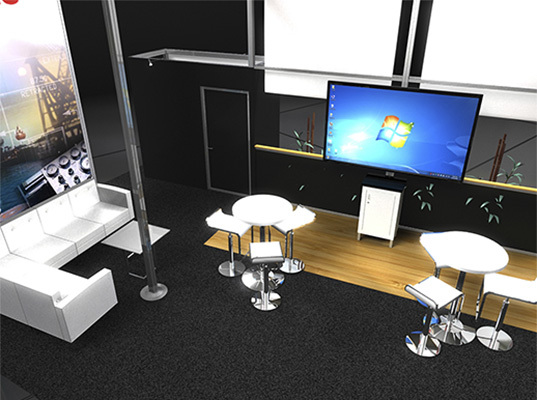 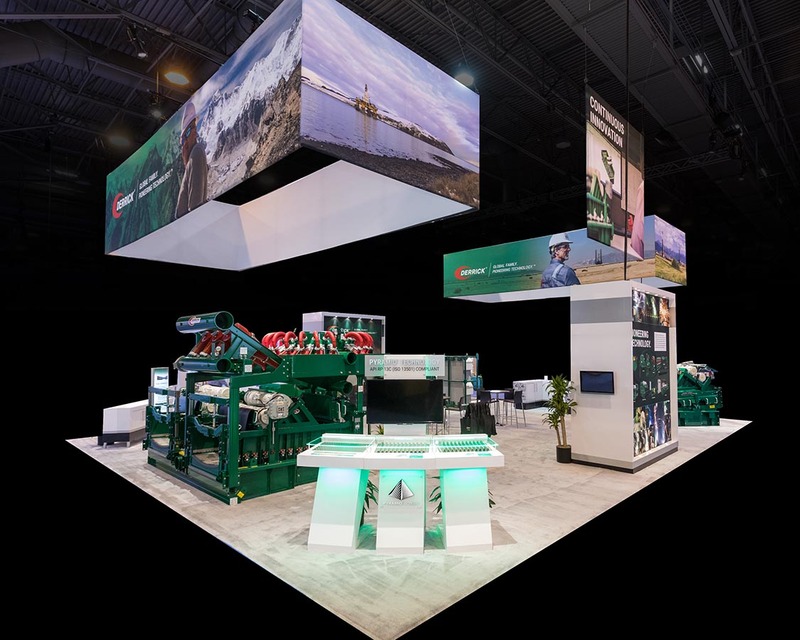 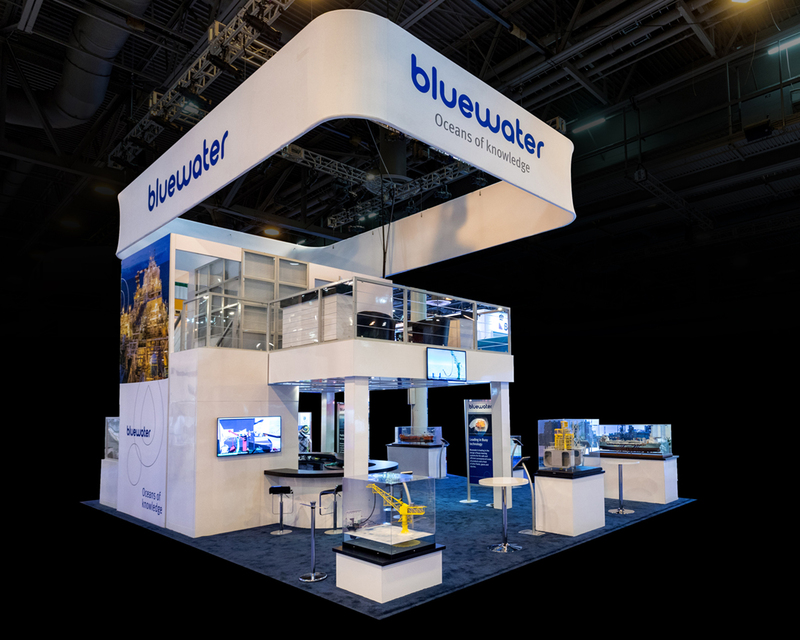 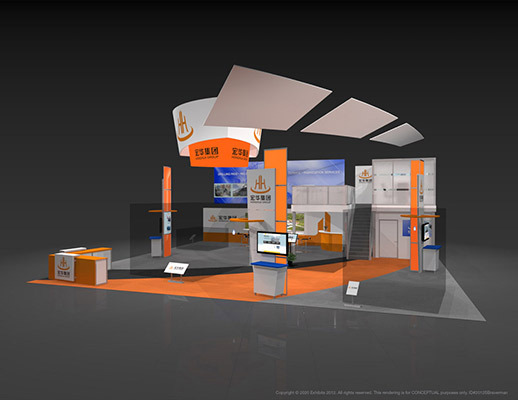 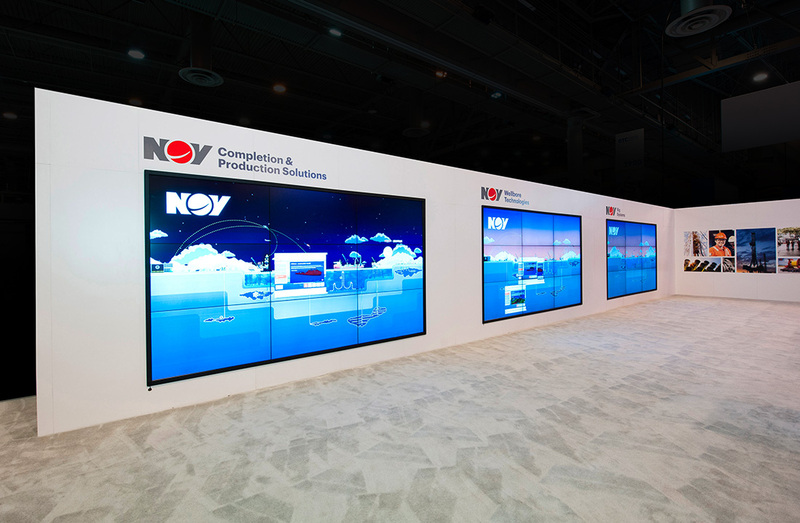 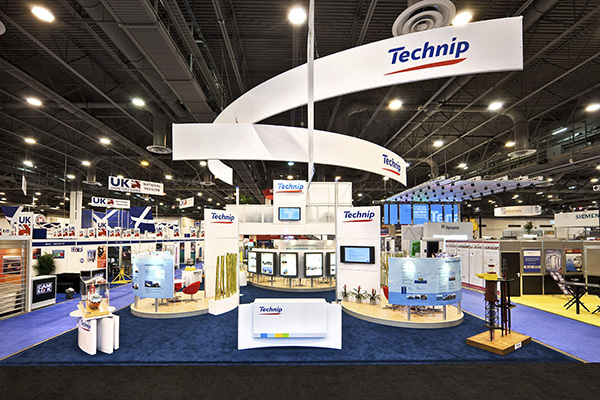 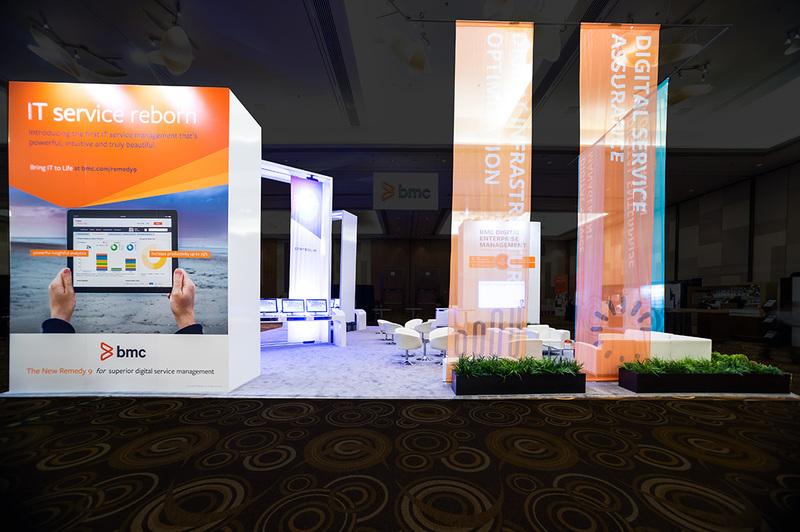 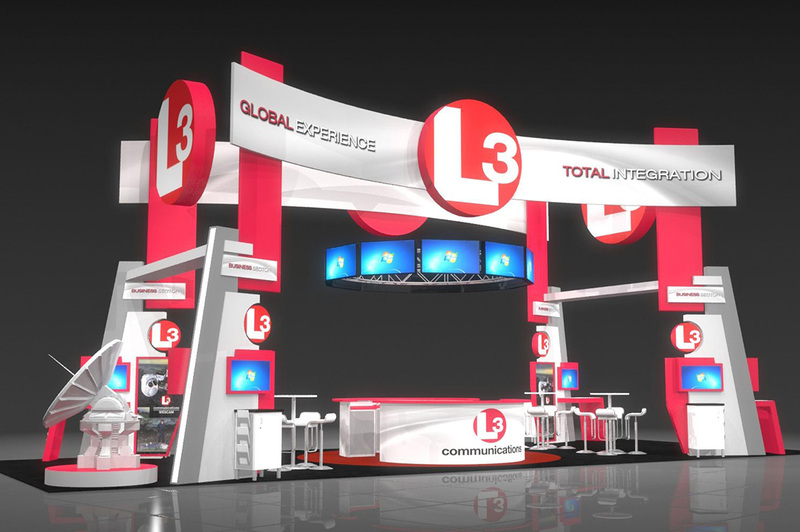 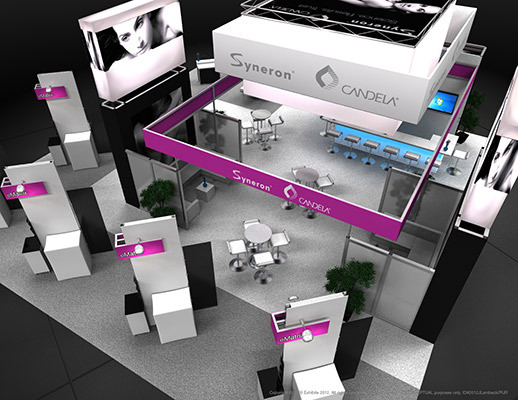 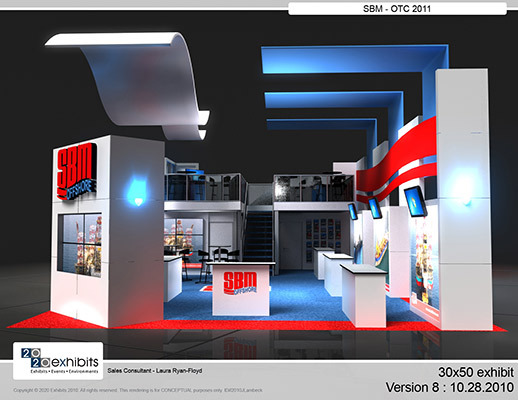 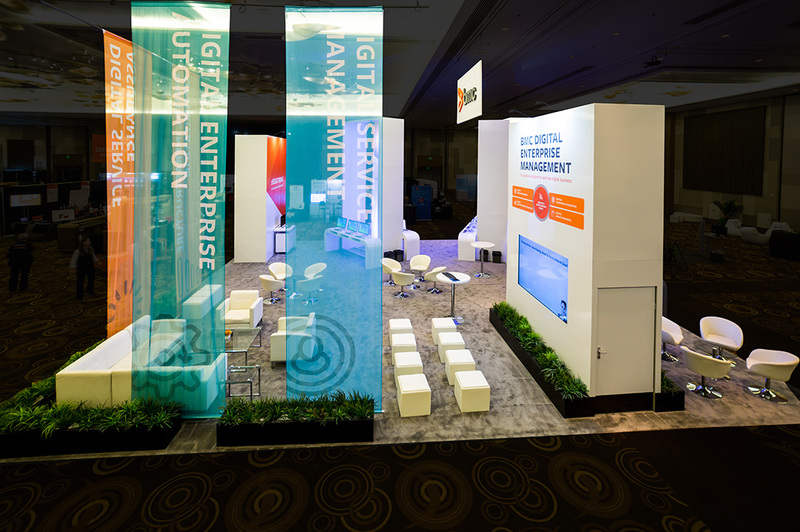 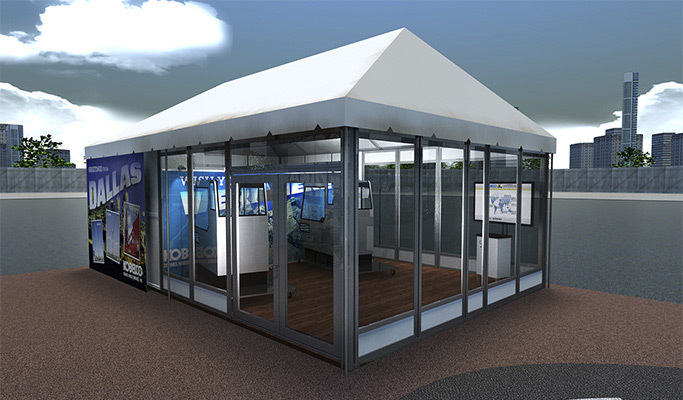 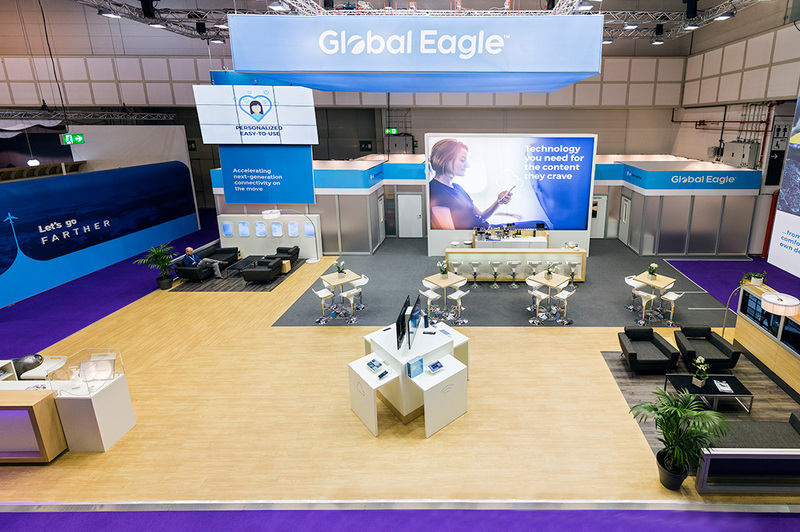 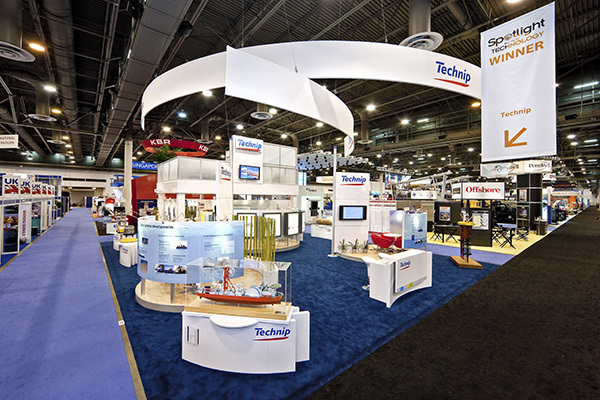 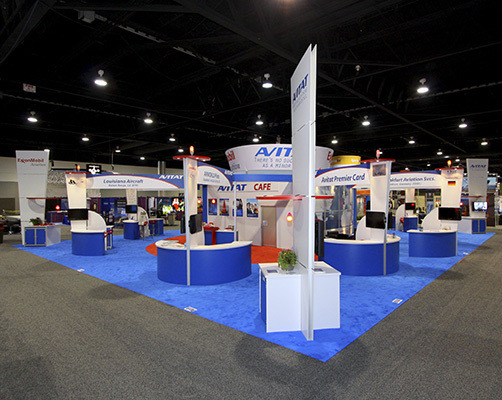 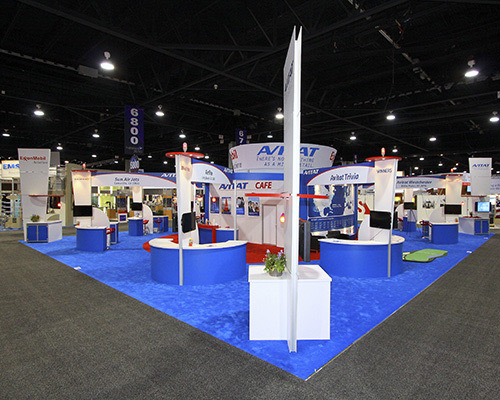 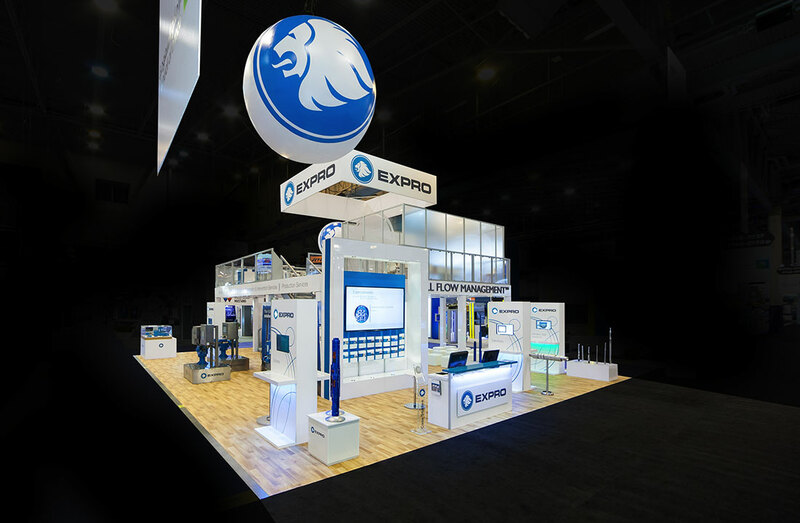 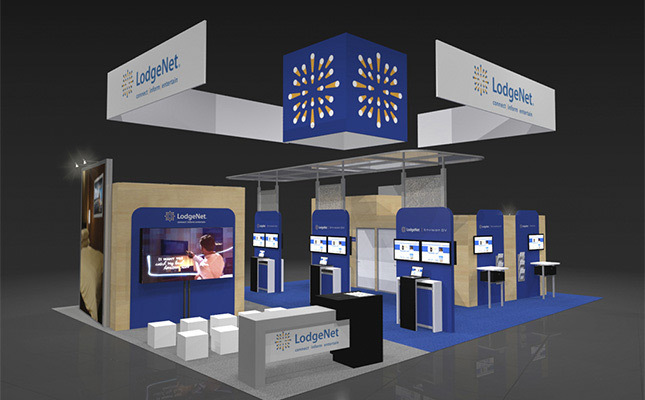 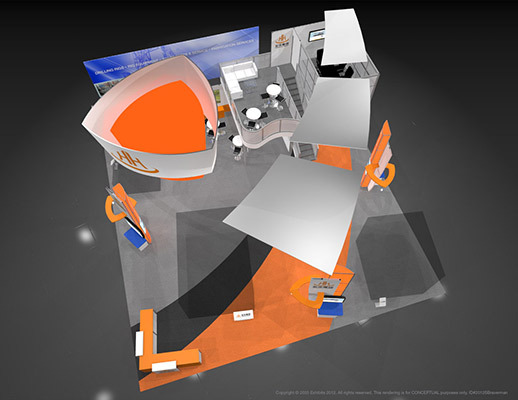 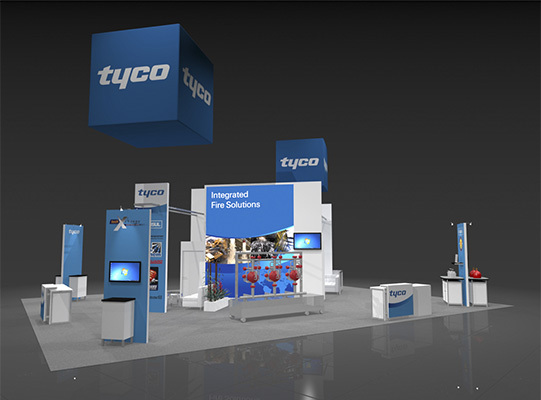 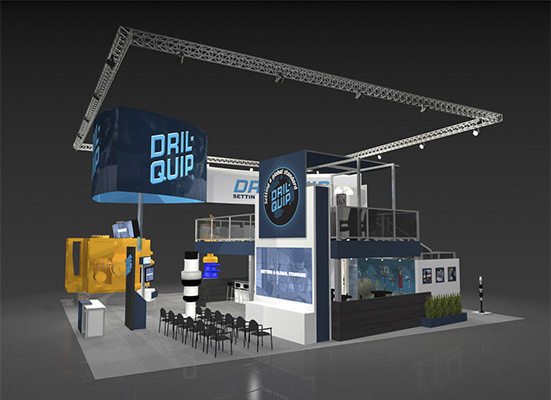 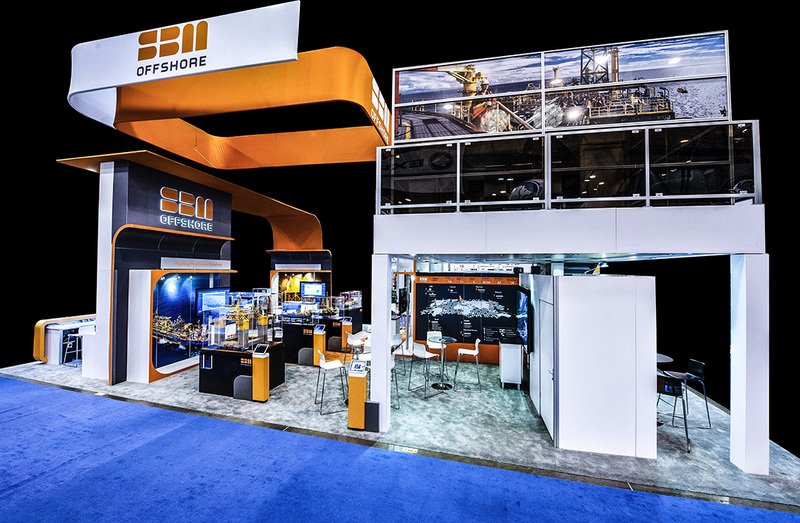 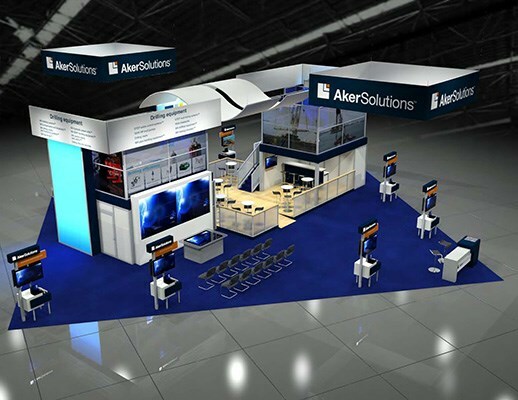 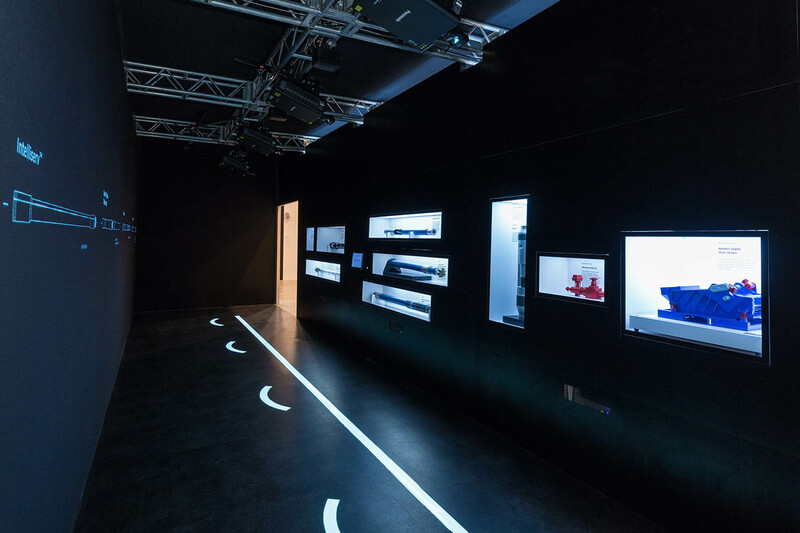 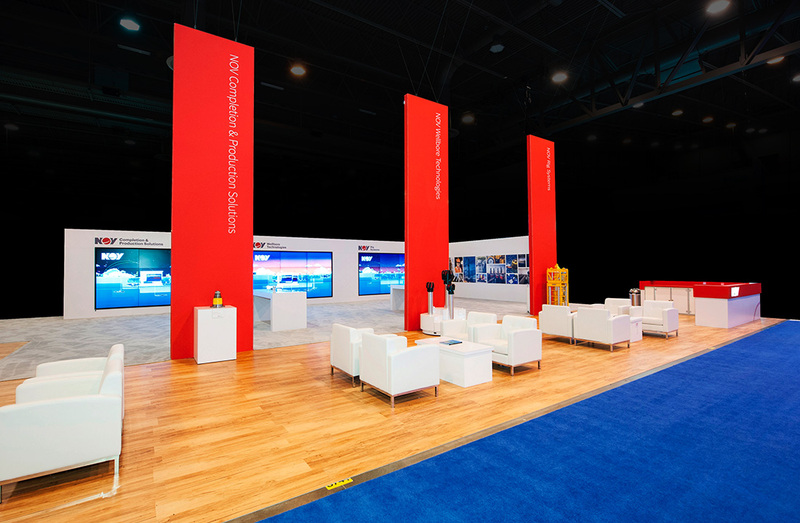 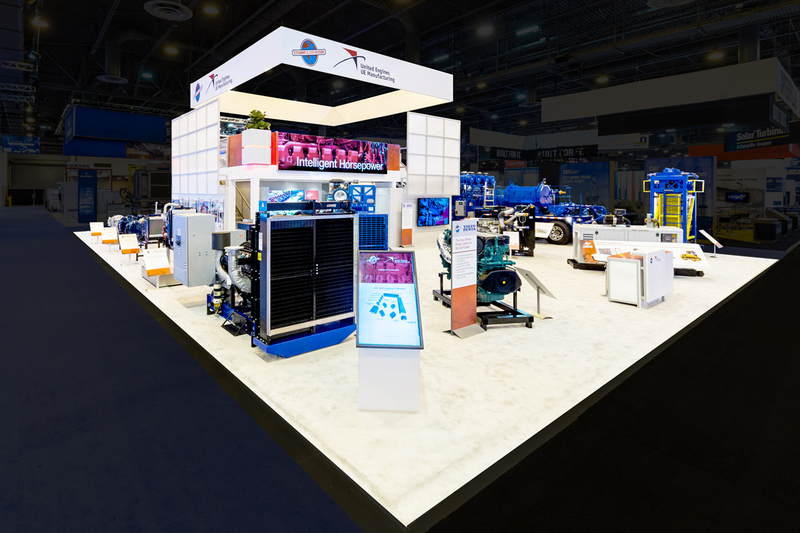 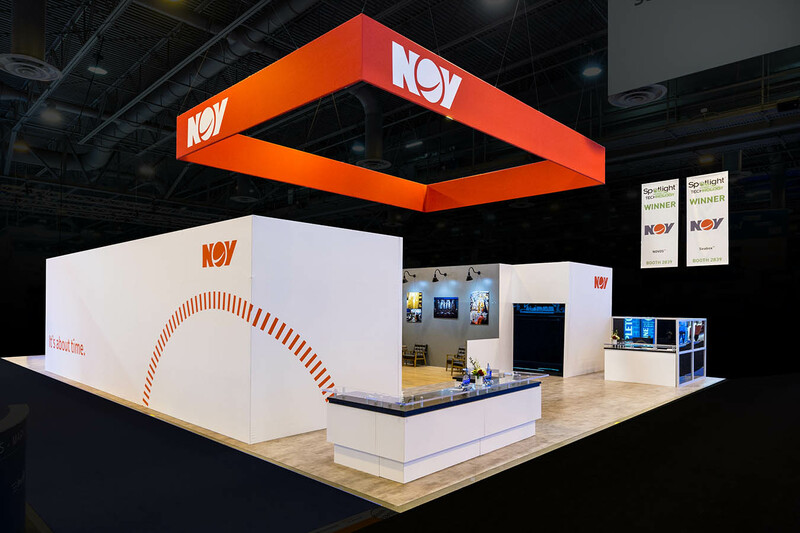 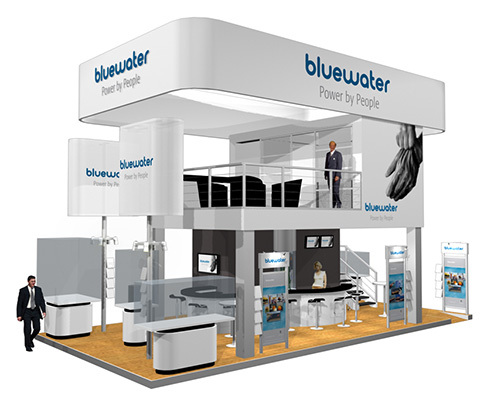 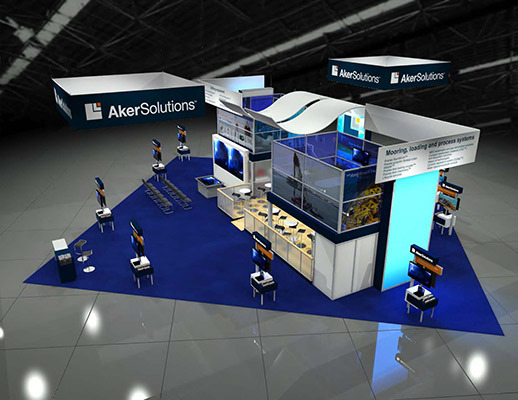 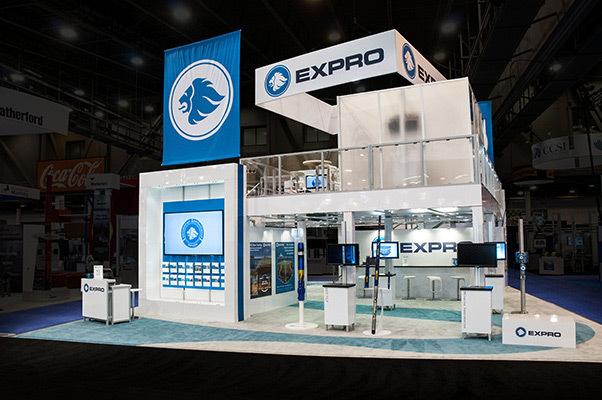 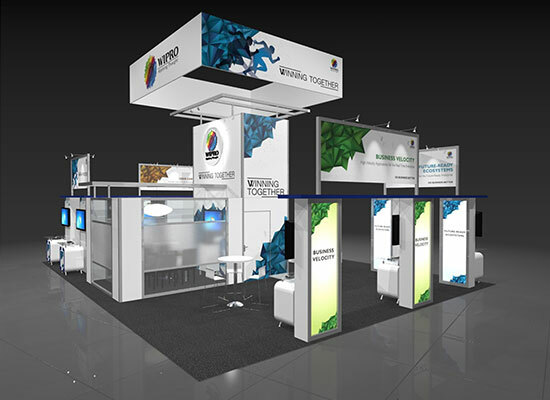 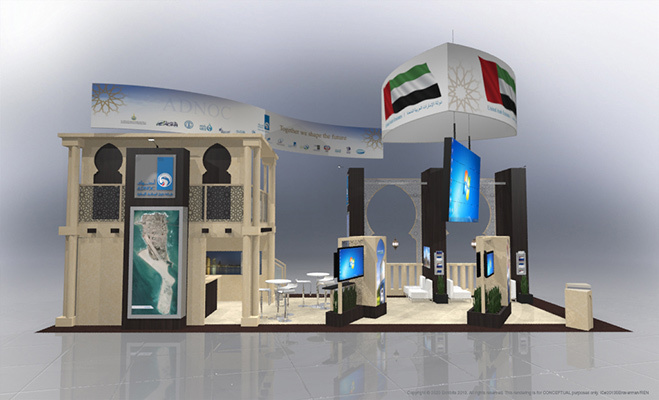 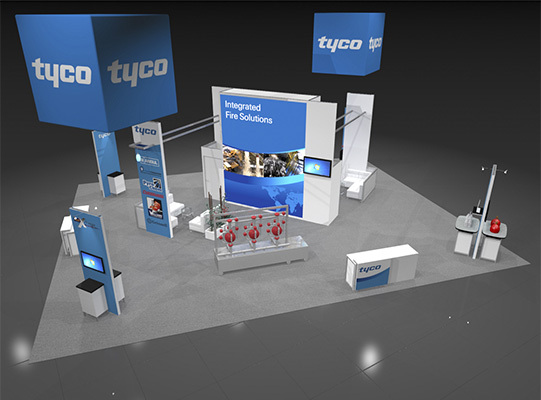 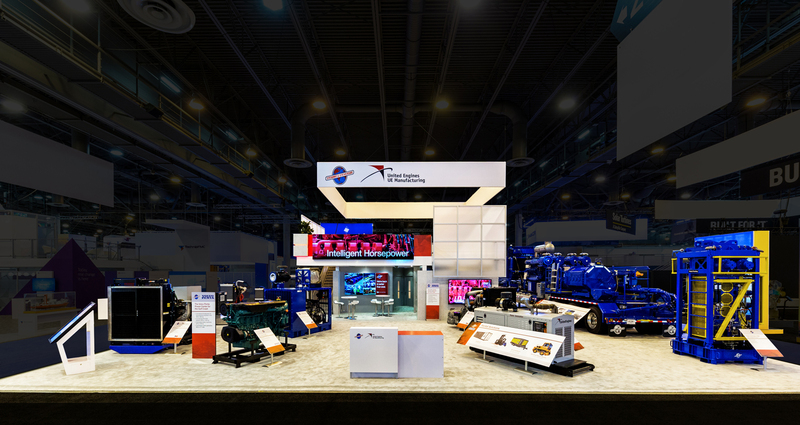 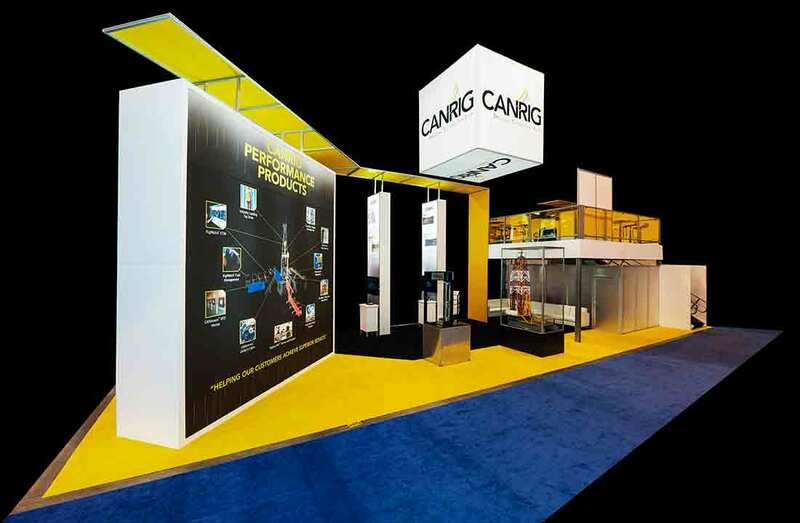 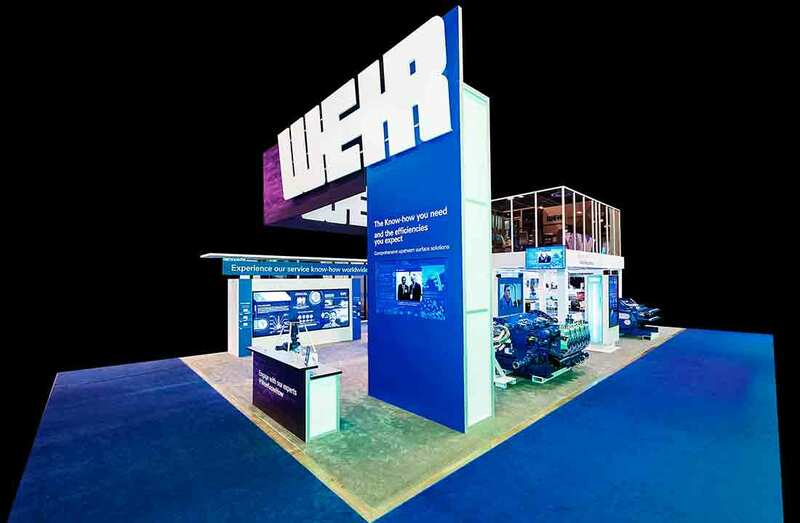 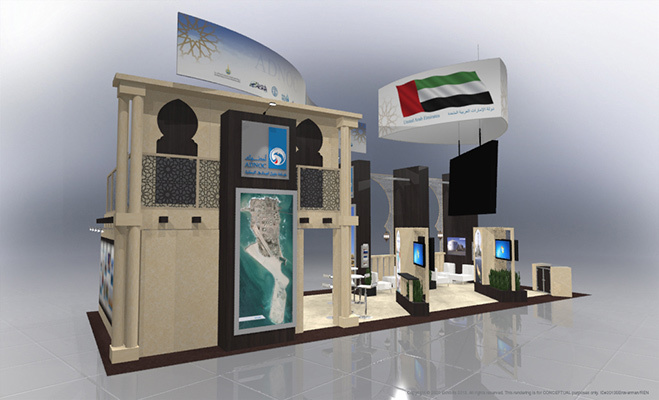 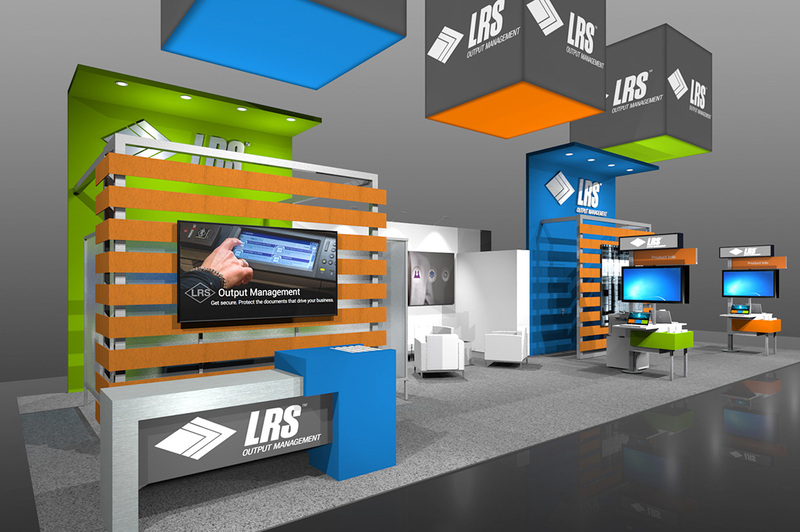 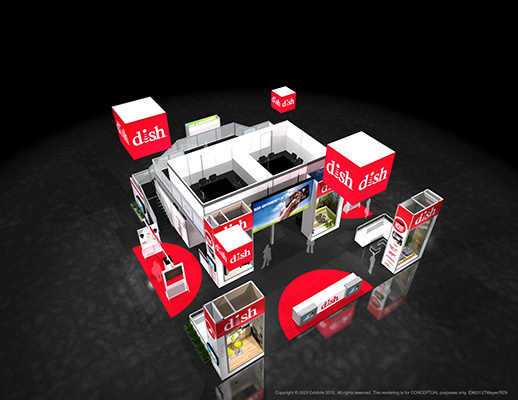 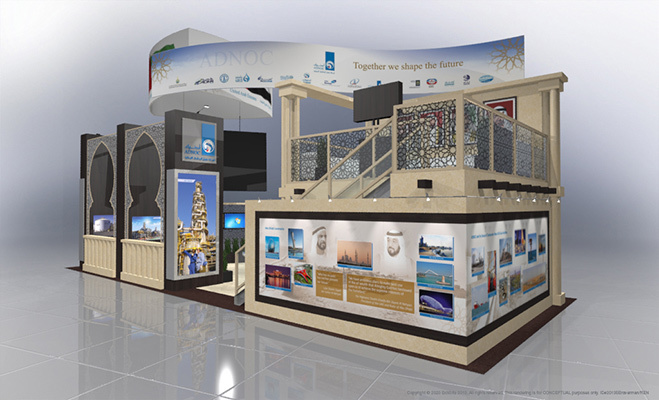 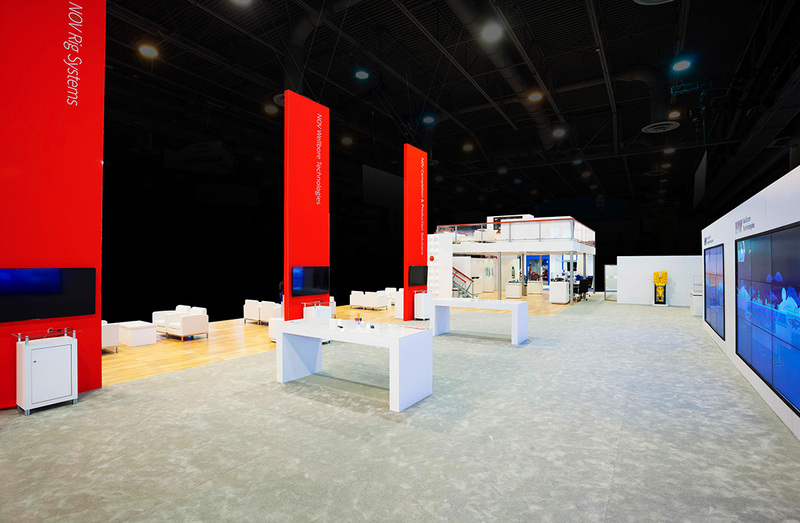 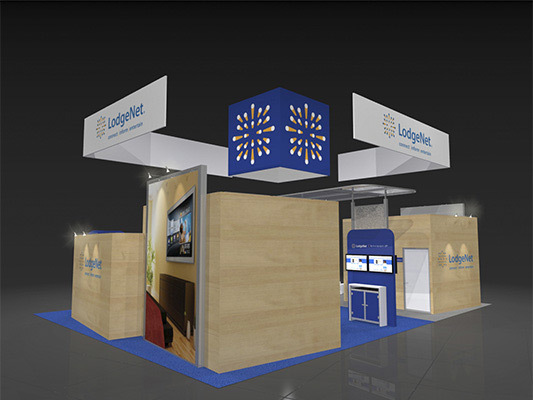 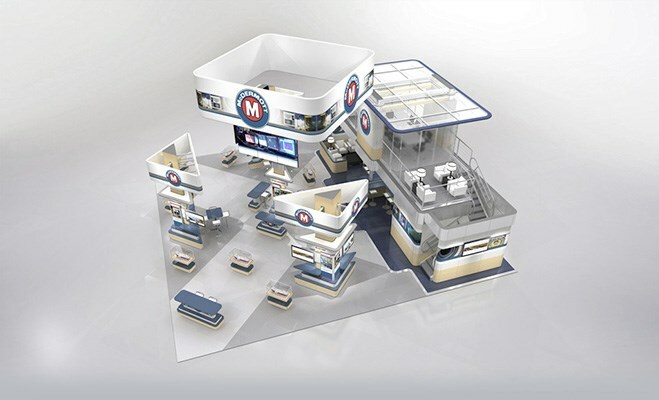 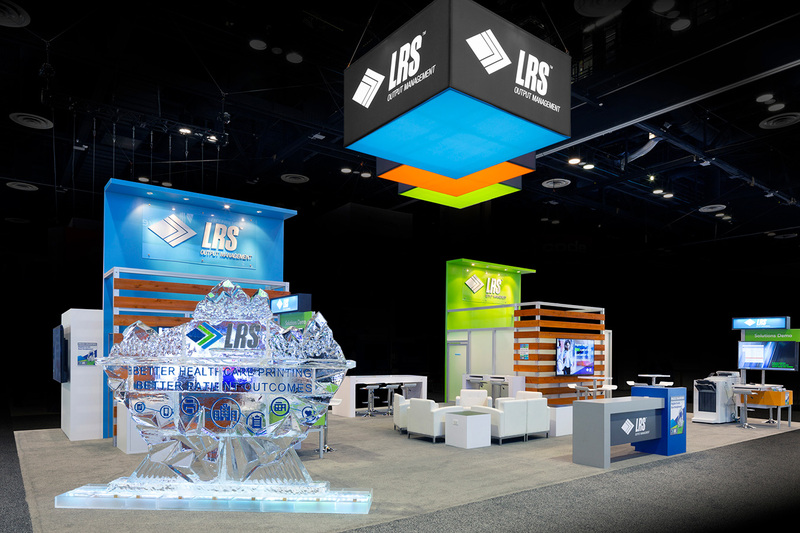 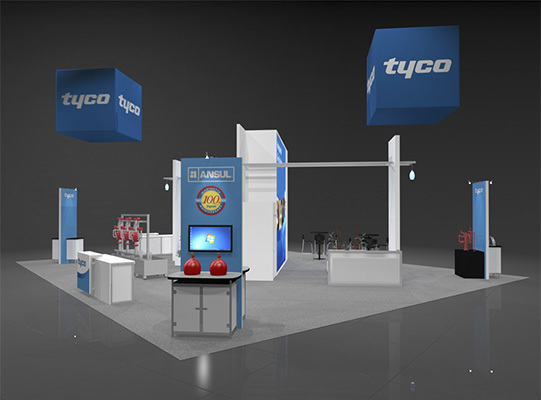 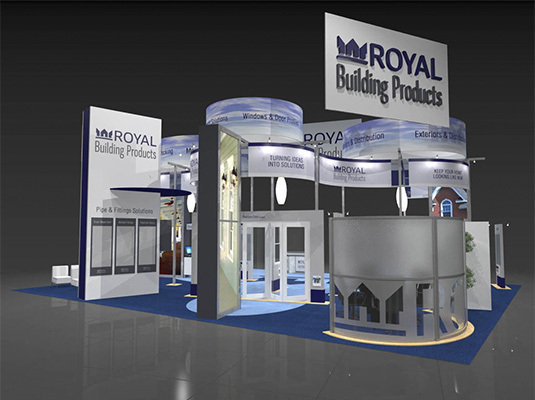 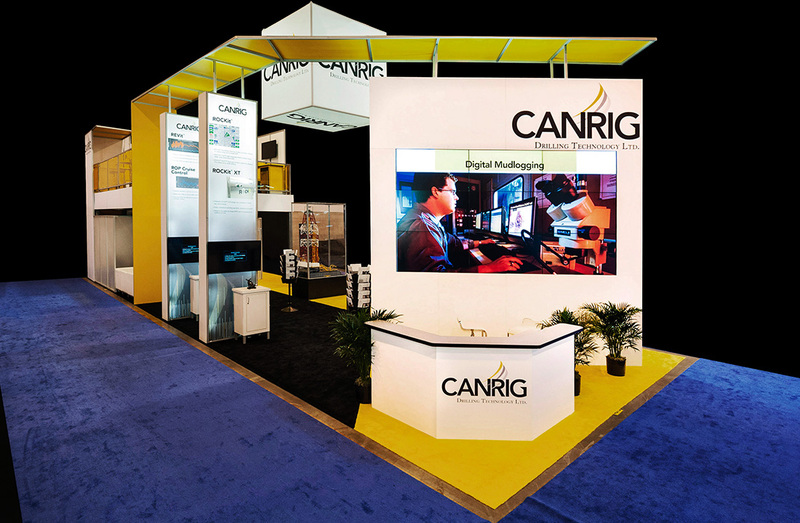 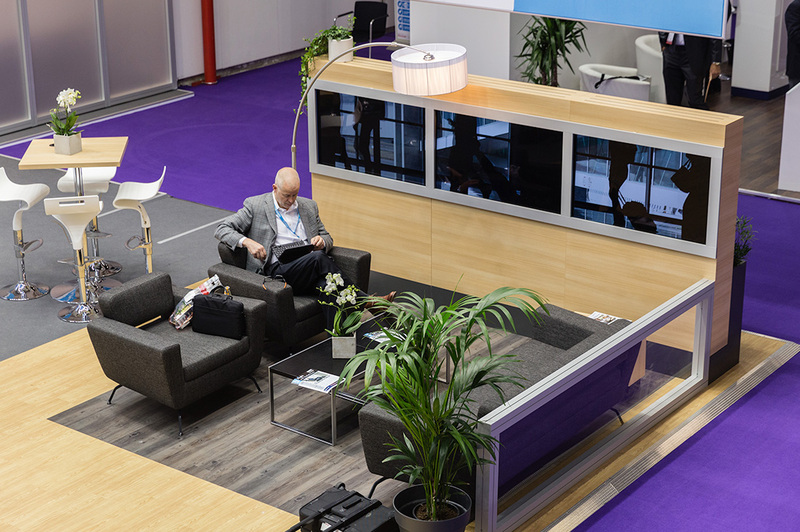 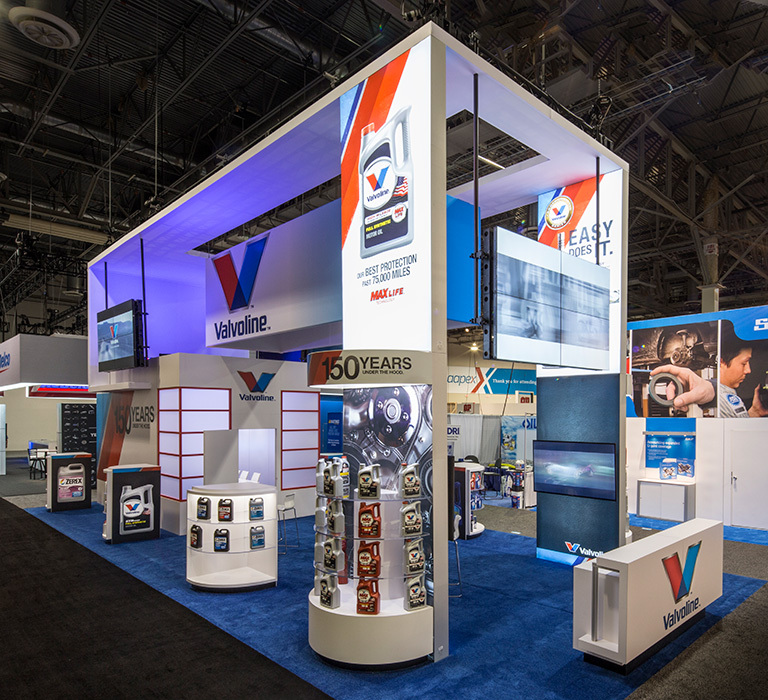 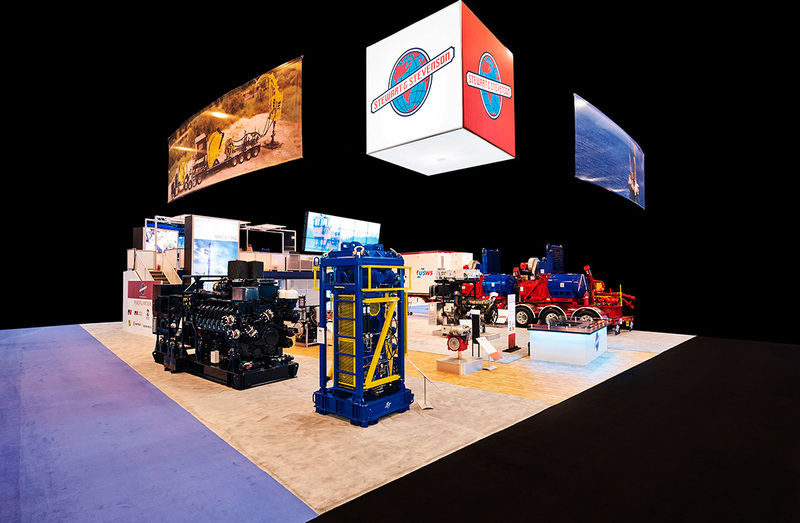 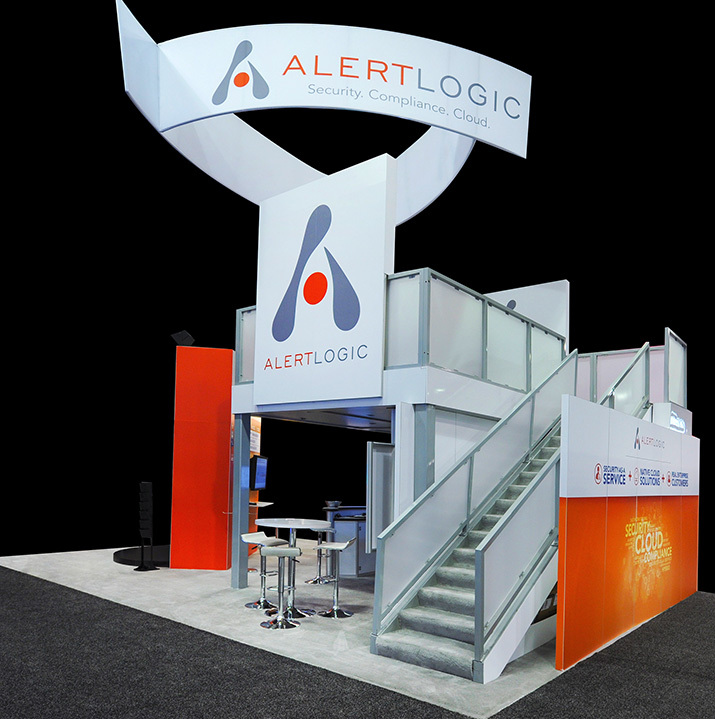 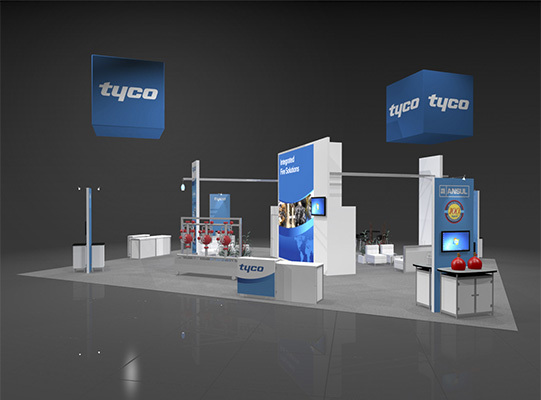 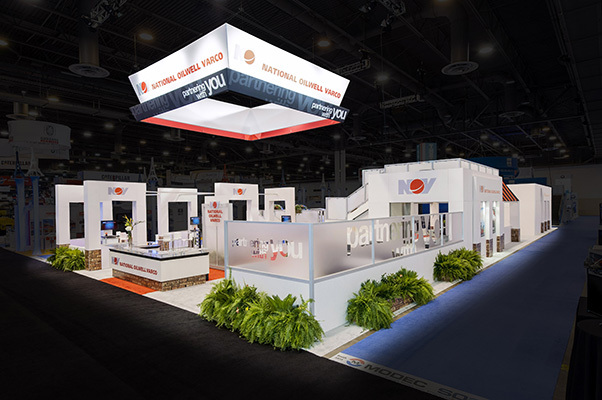 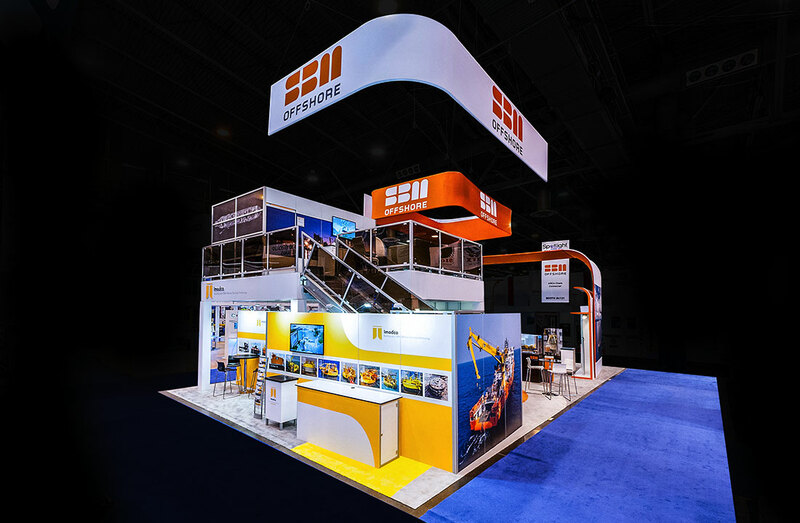 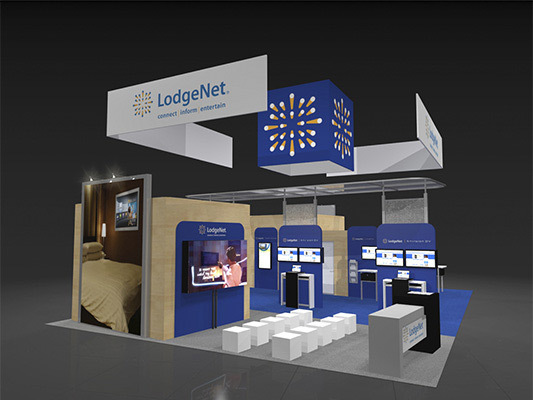 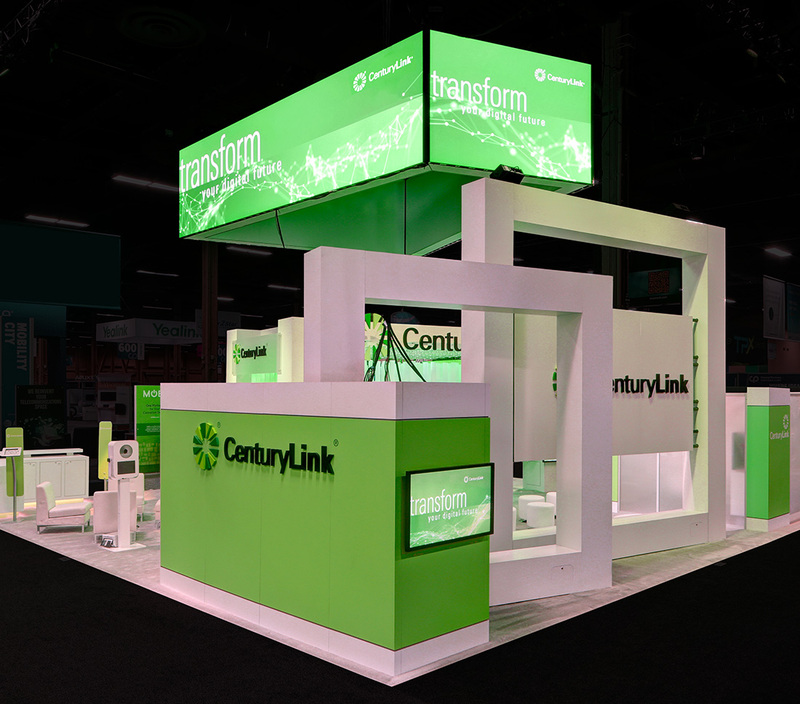 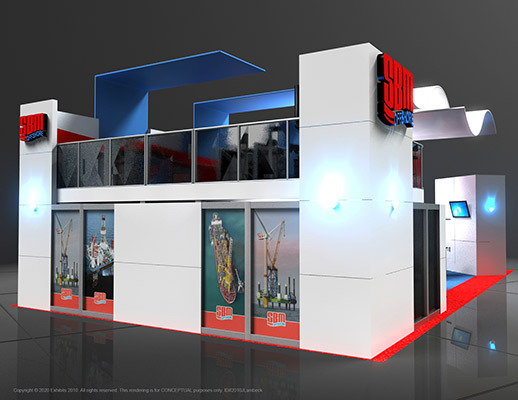 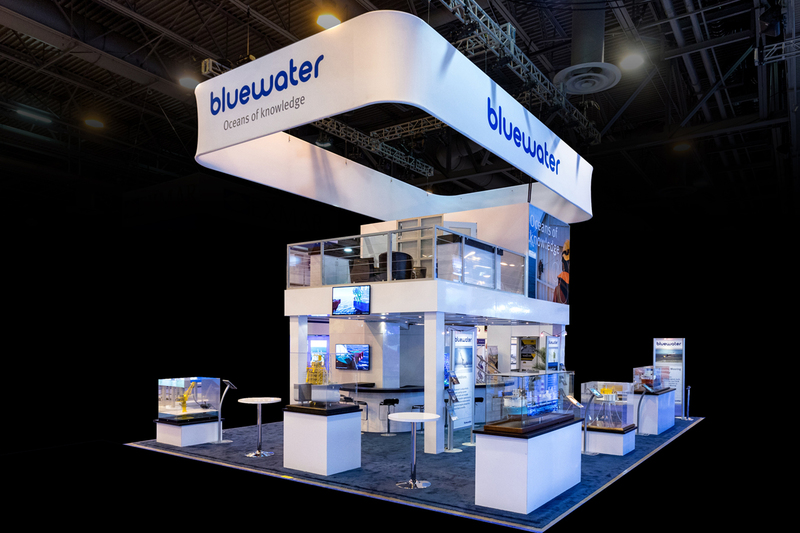 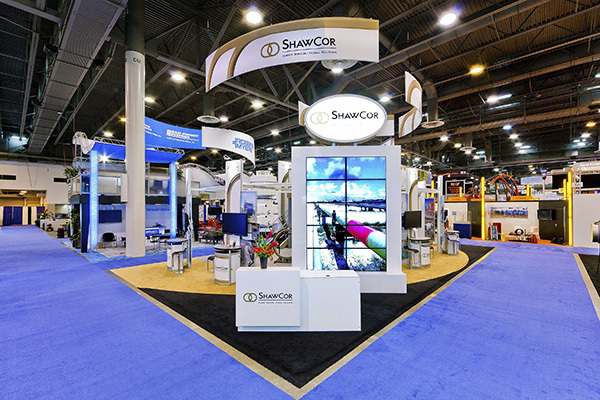 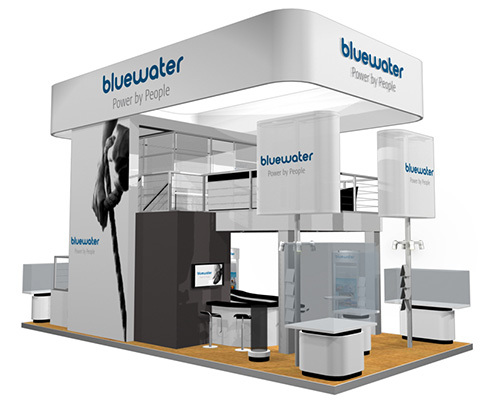 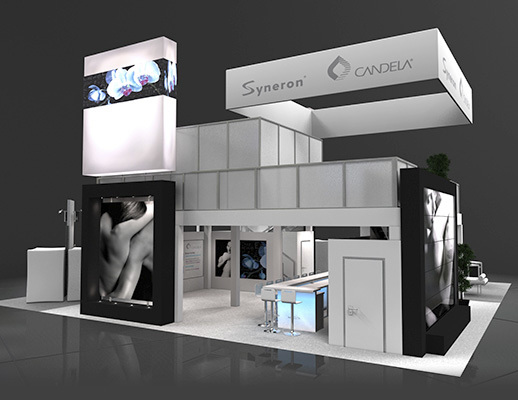 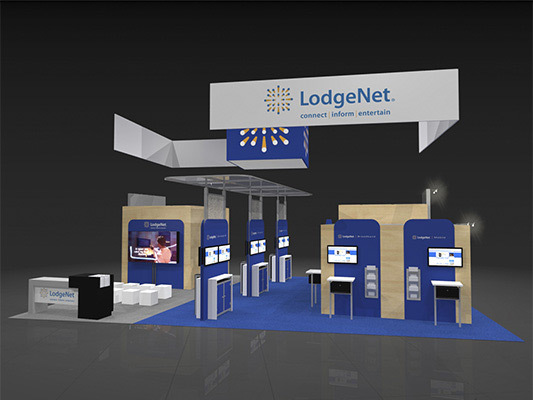 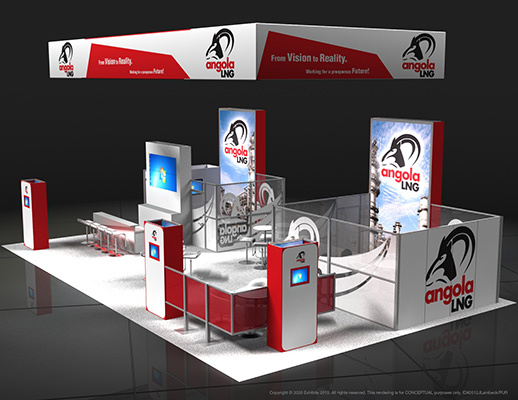 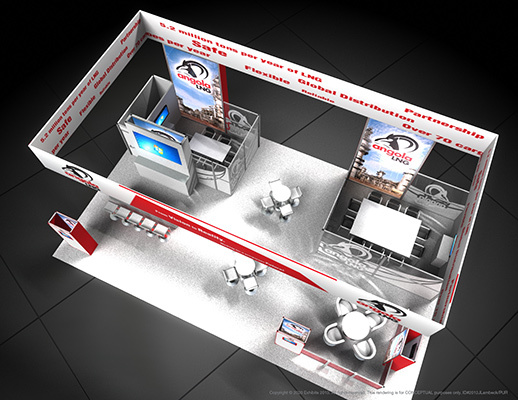 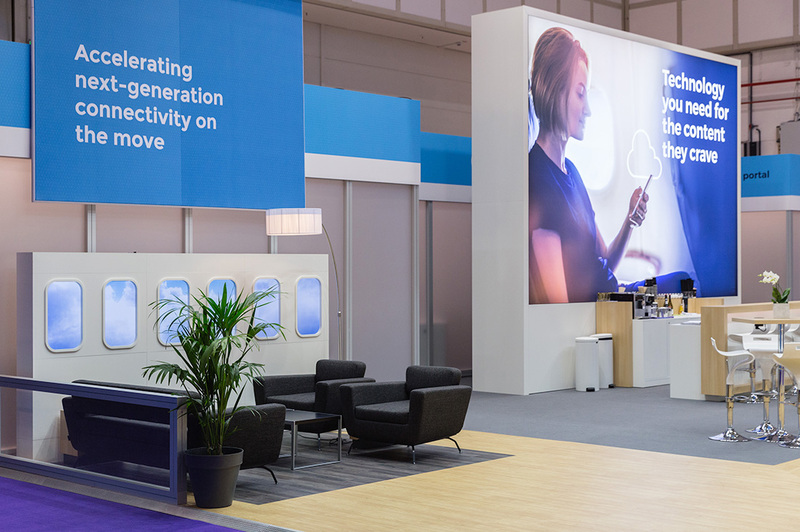 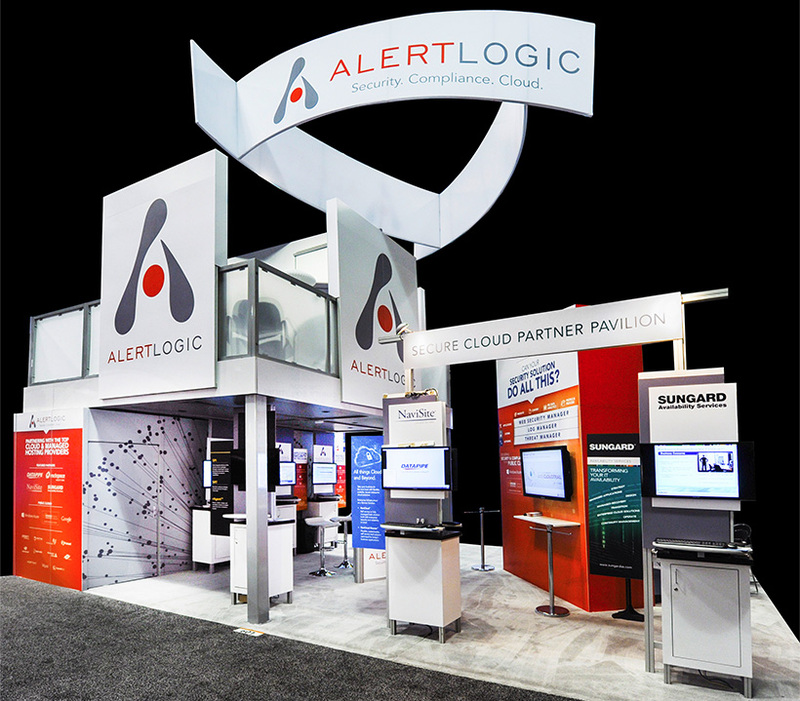 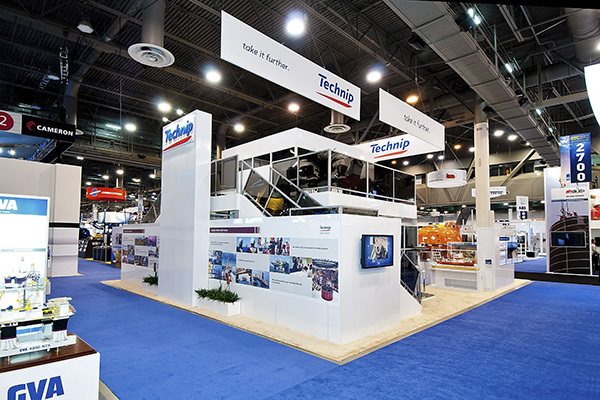 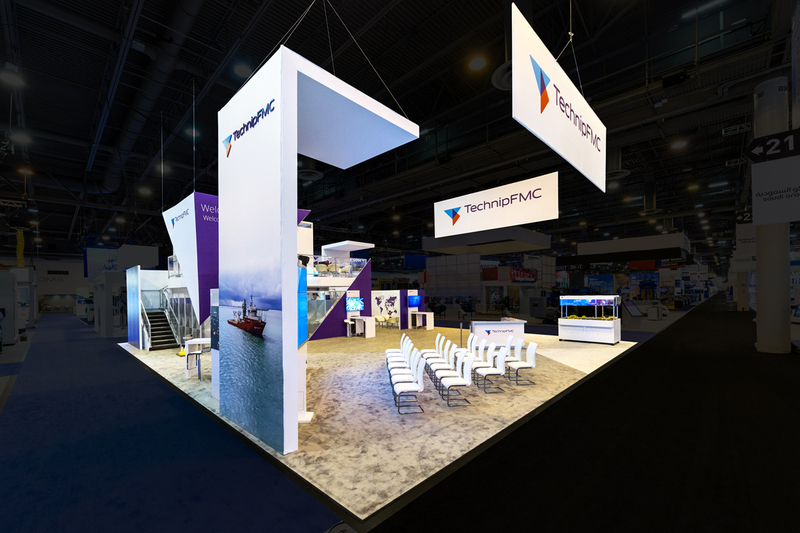 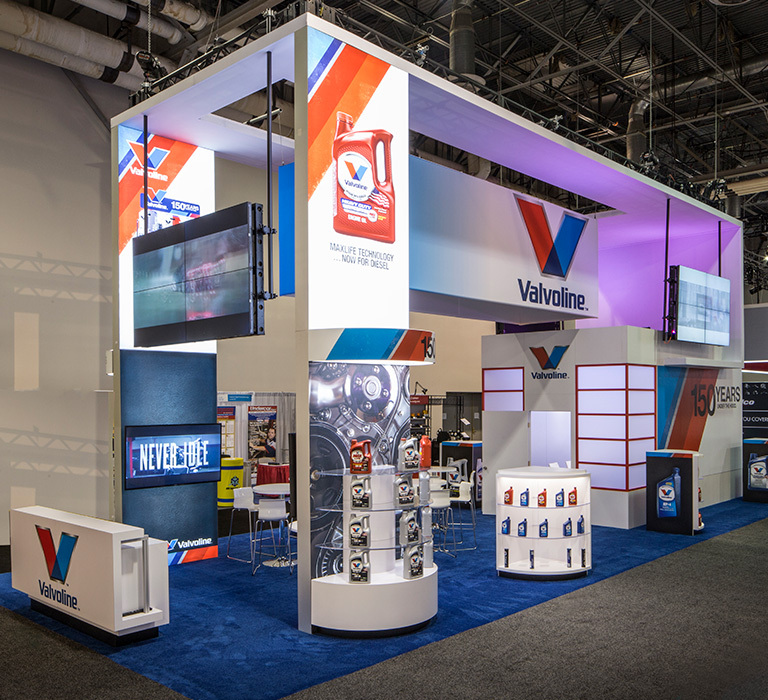 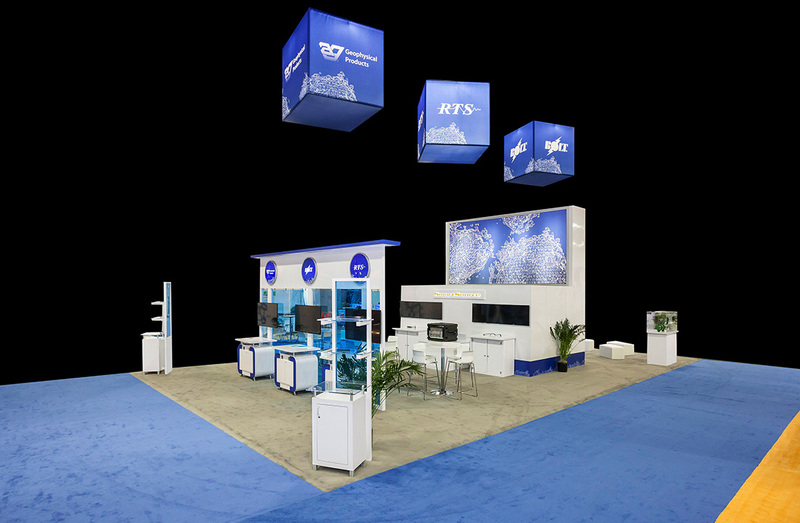 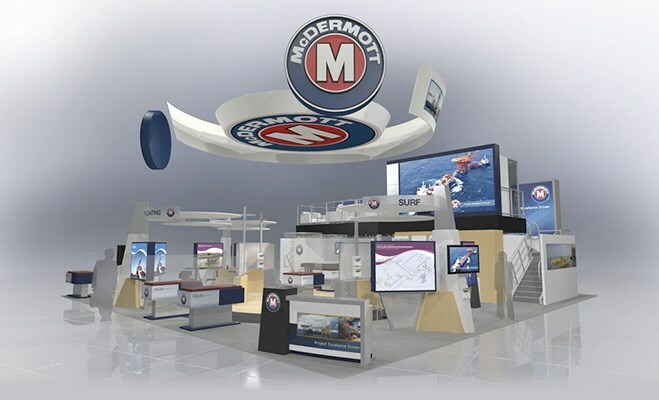 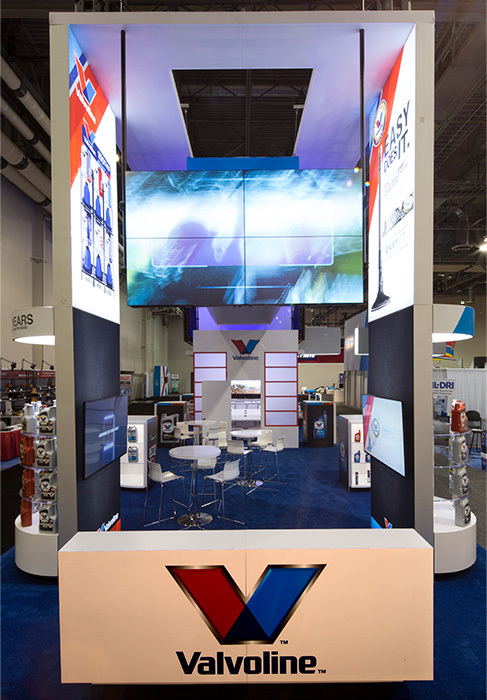 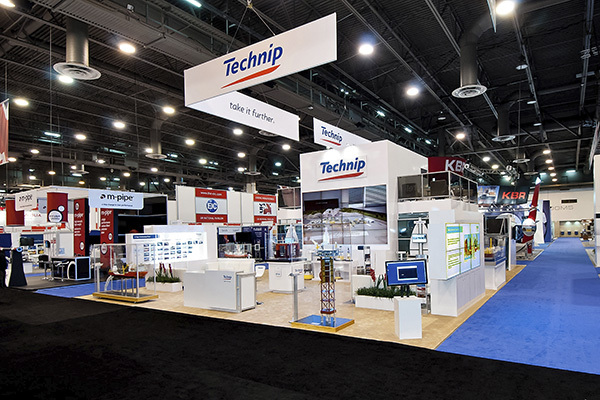 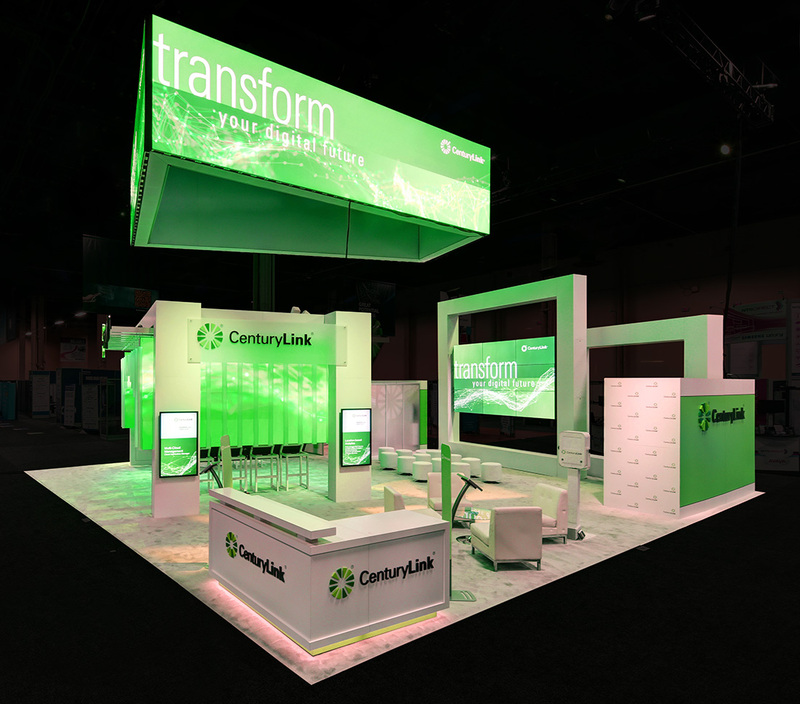 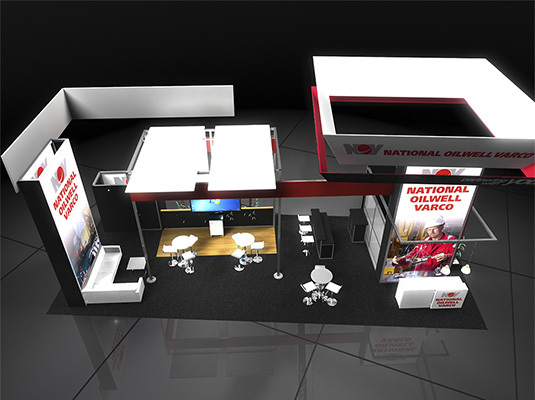 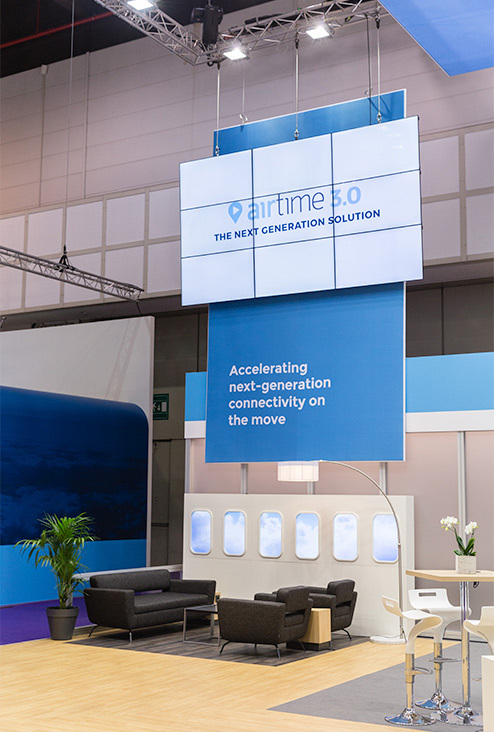 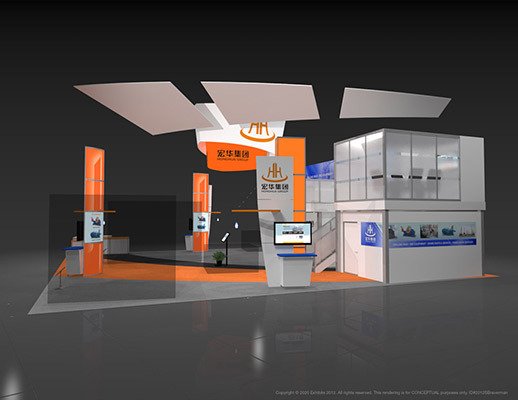 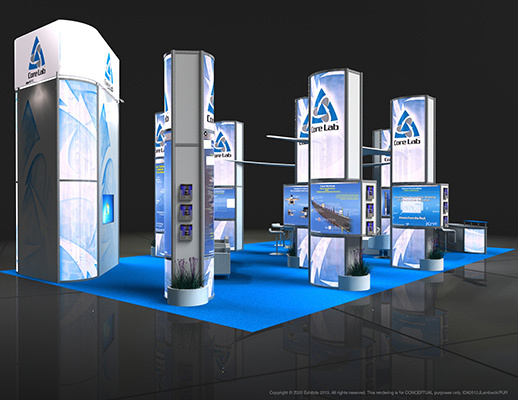 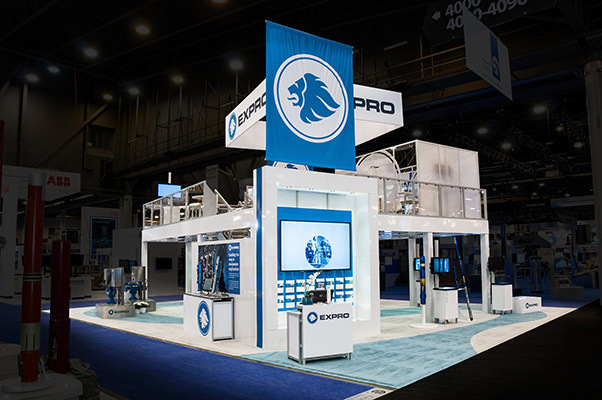 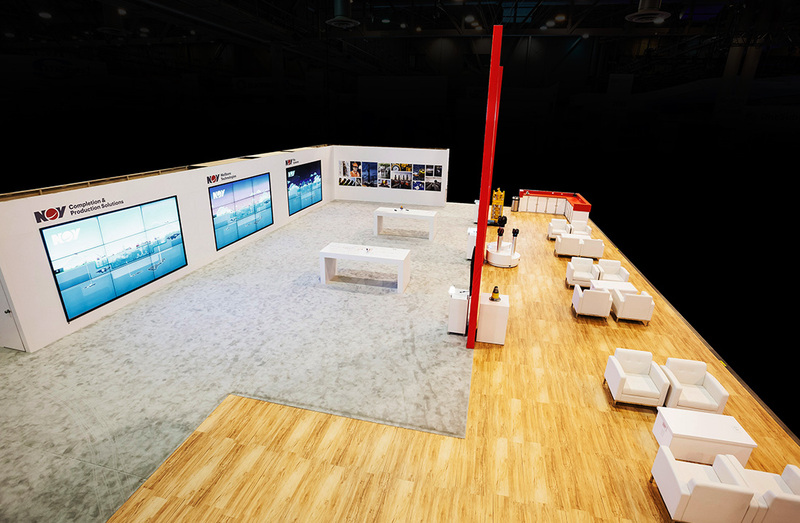 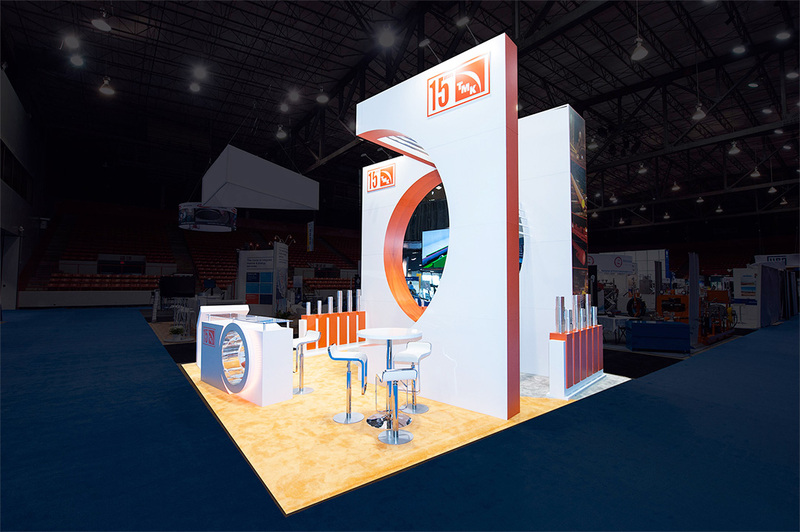 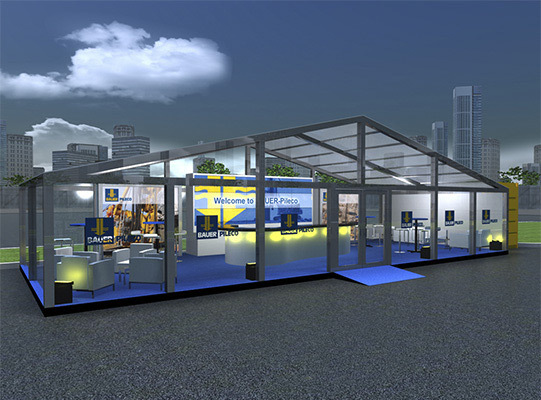 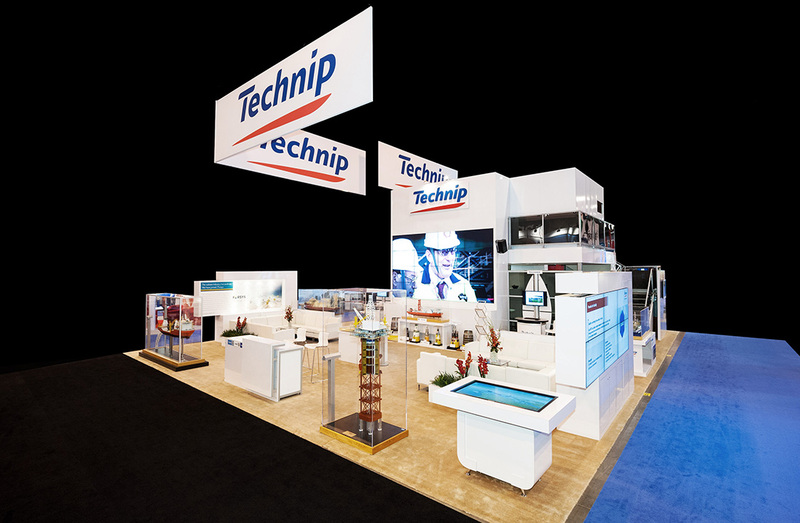 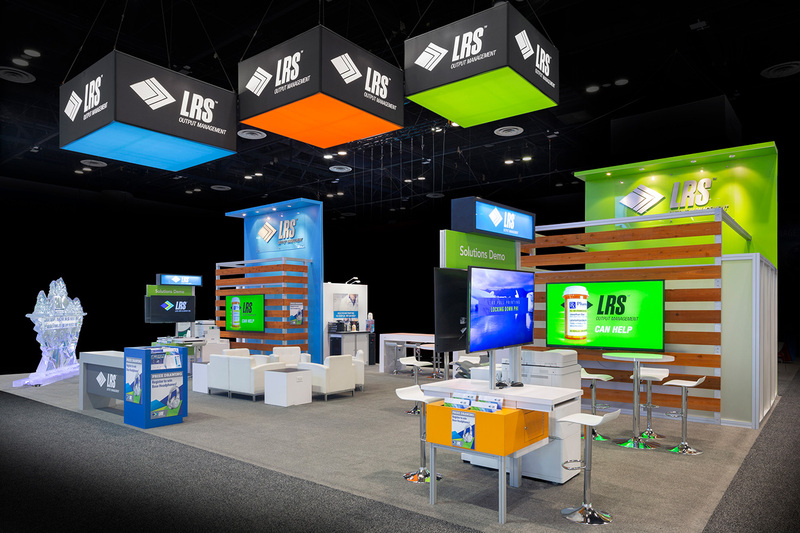 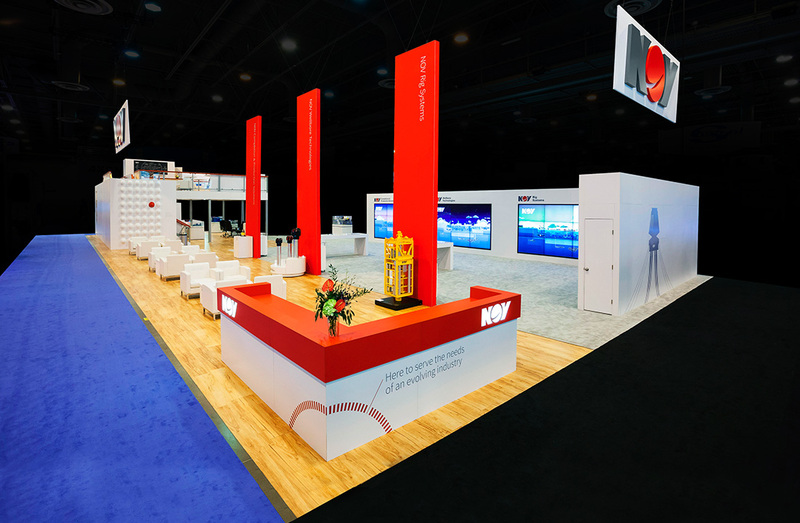 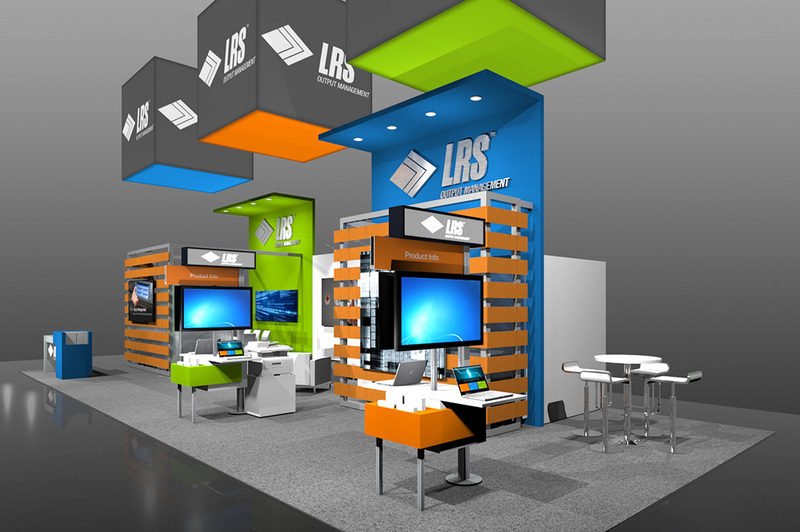 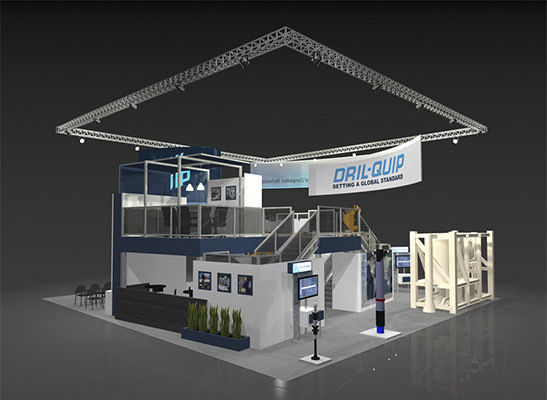 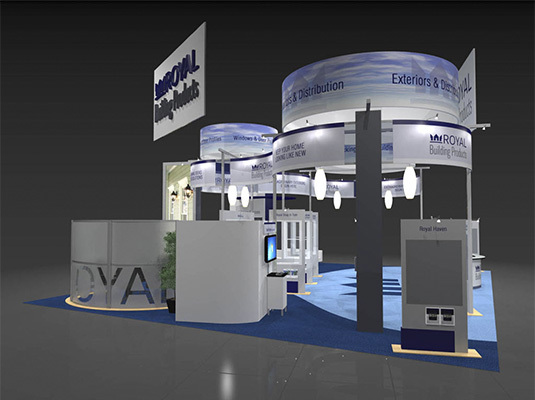 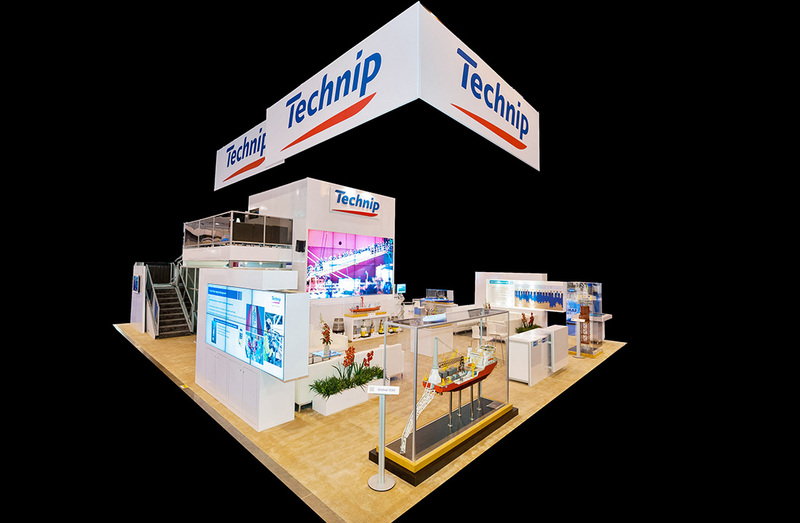 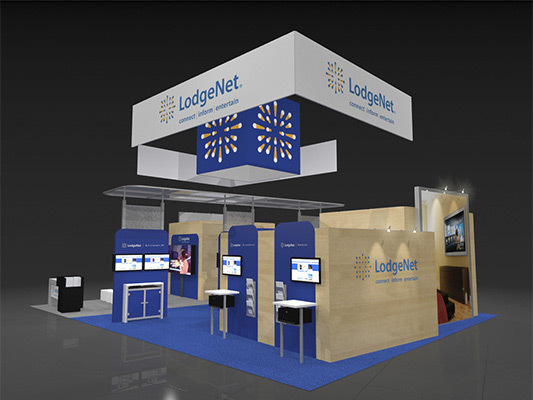 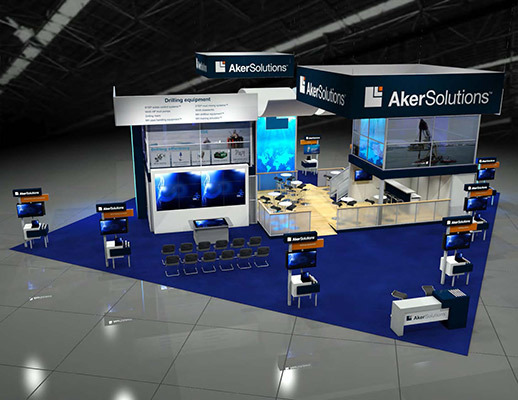 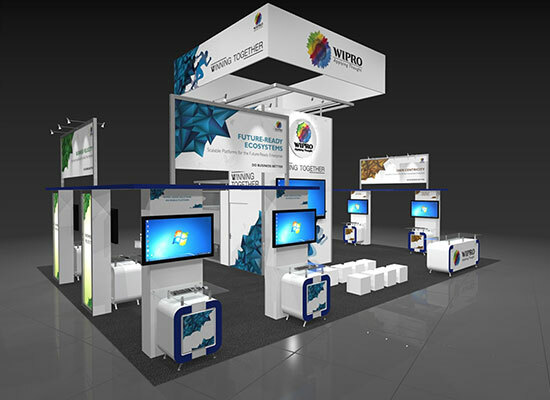 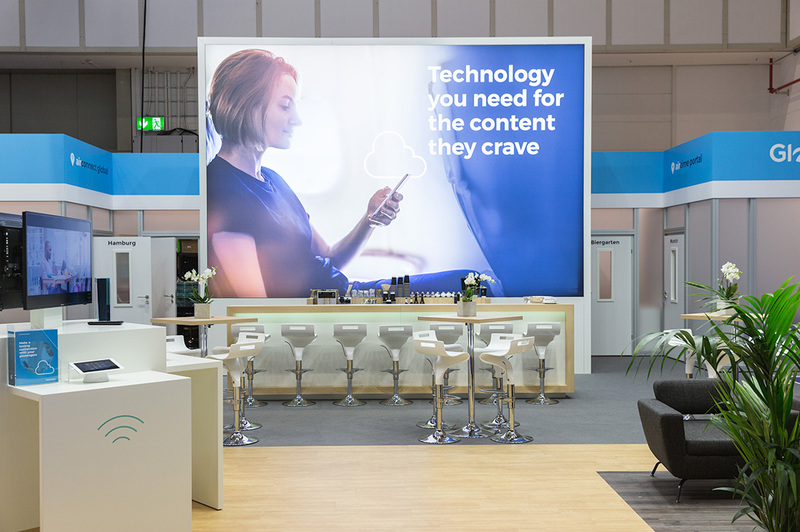 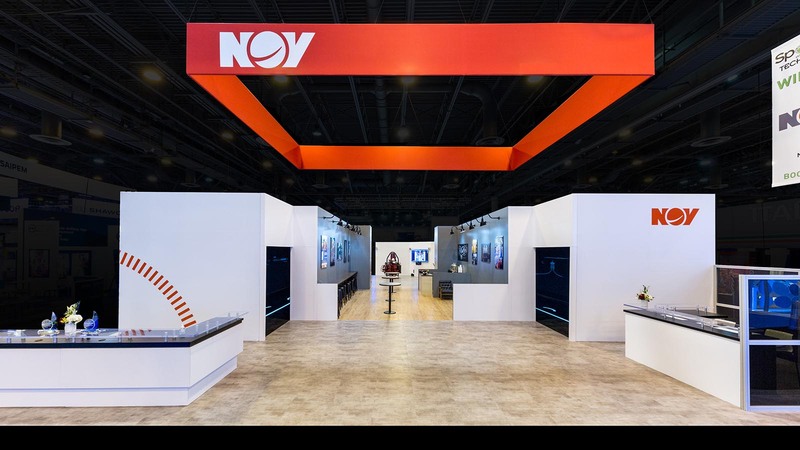 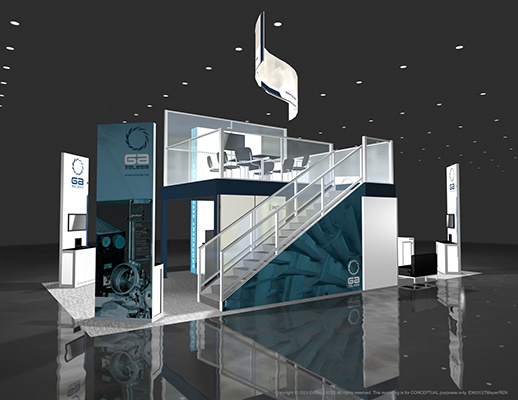 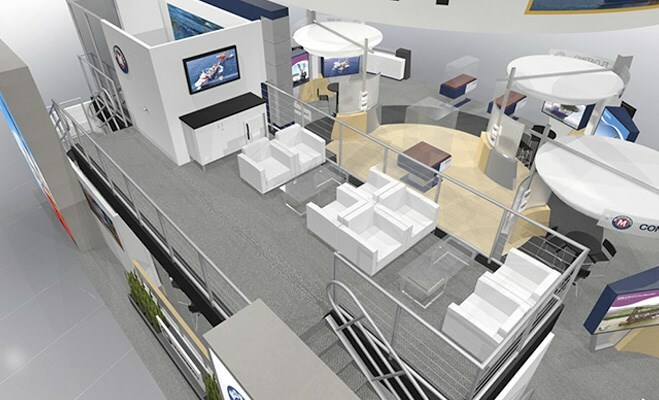 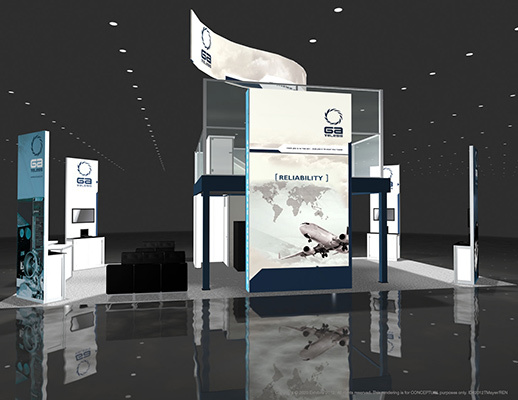 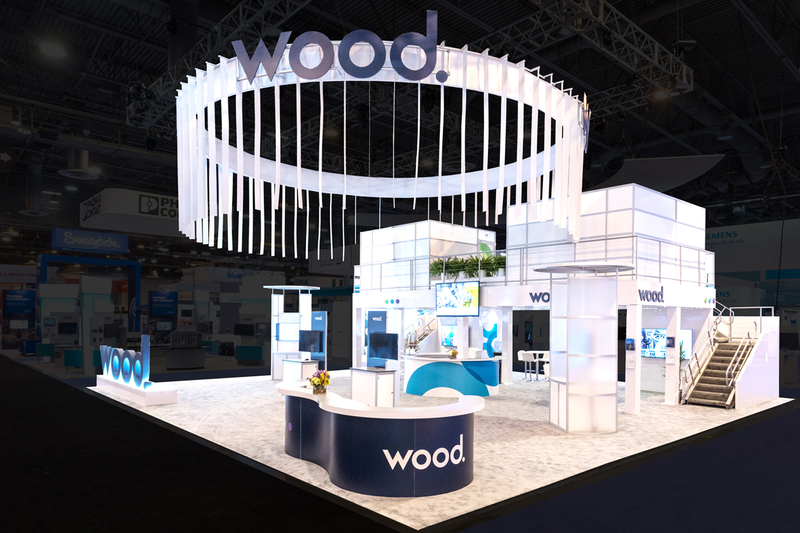 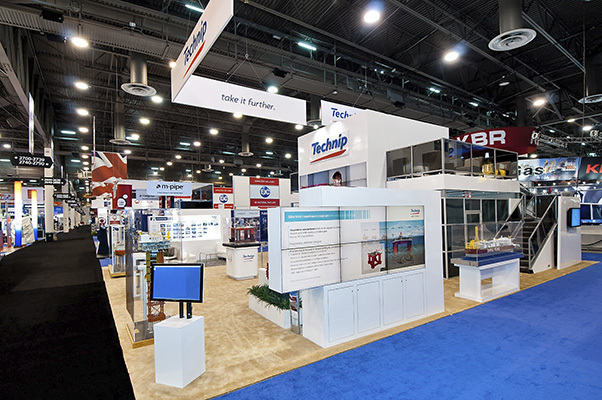 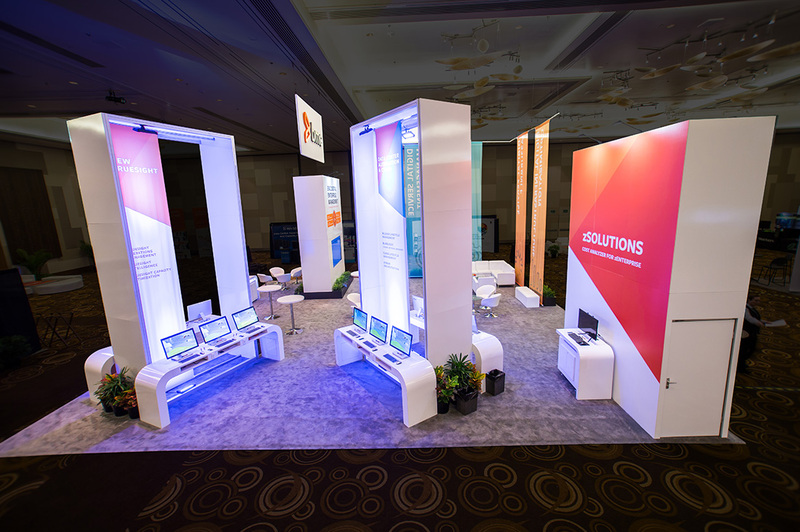 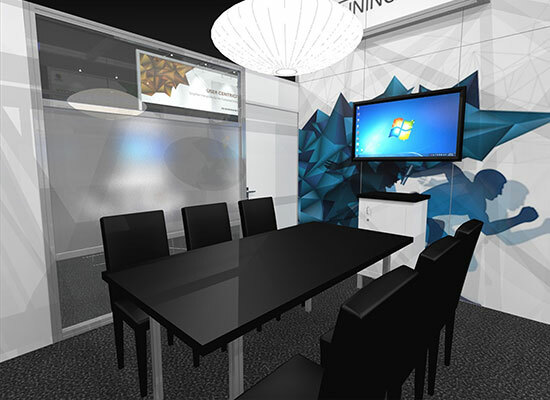 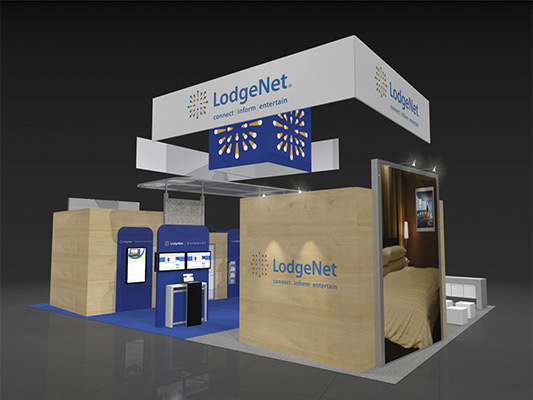 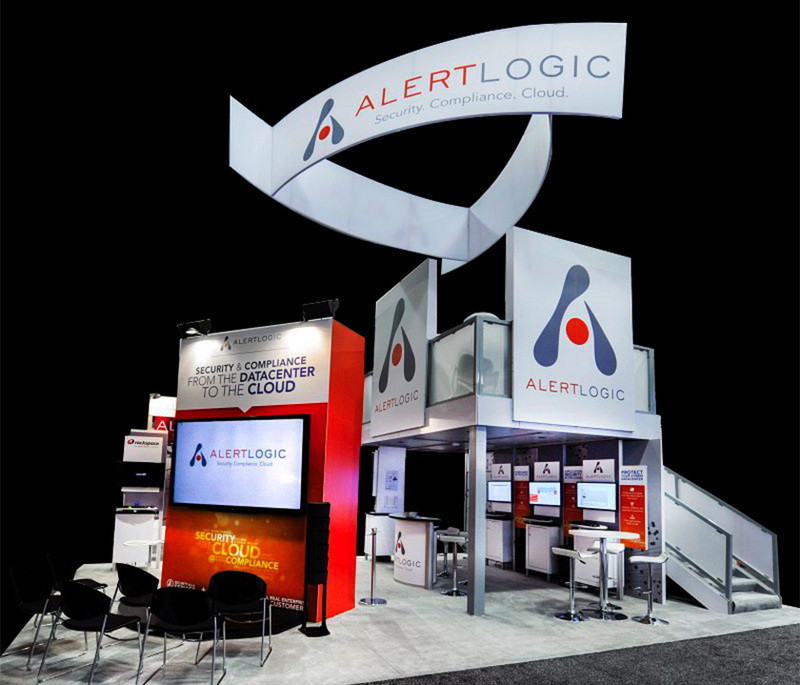 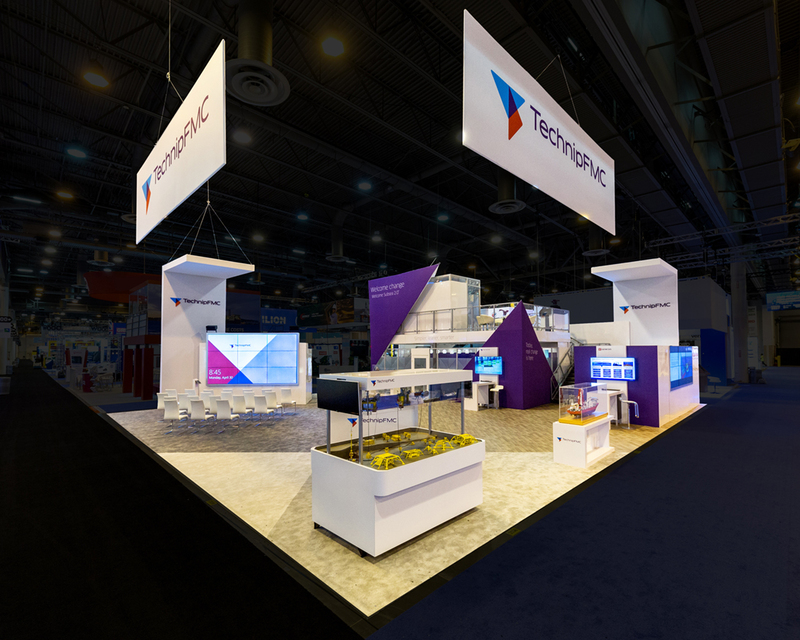 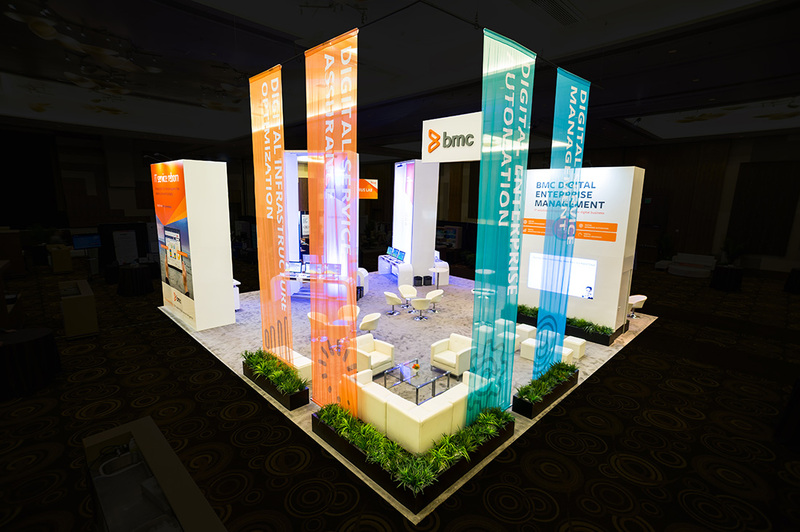 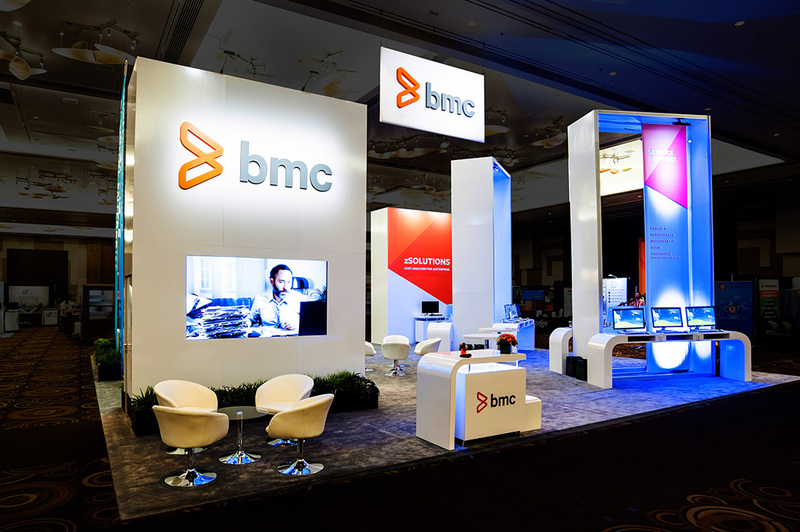 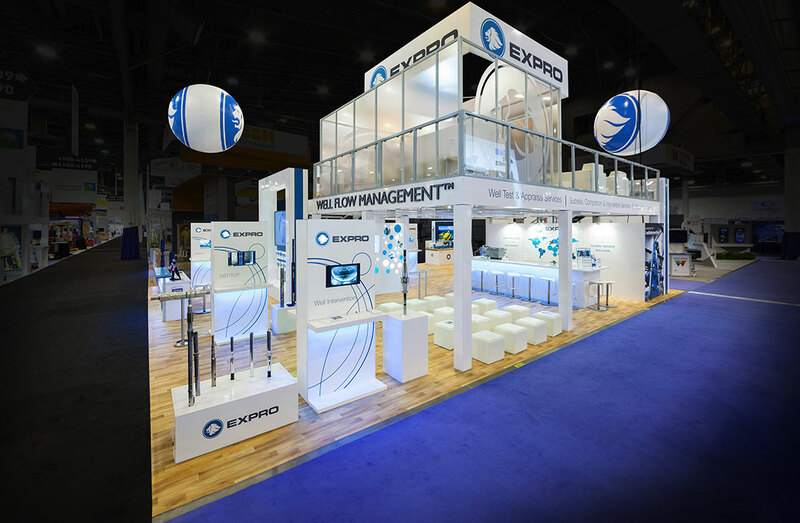 The basic layout allows for either a showcase from a presenter, or operates as a standalone for attendees to view the information independently. 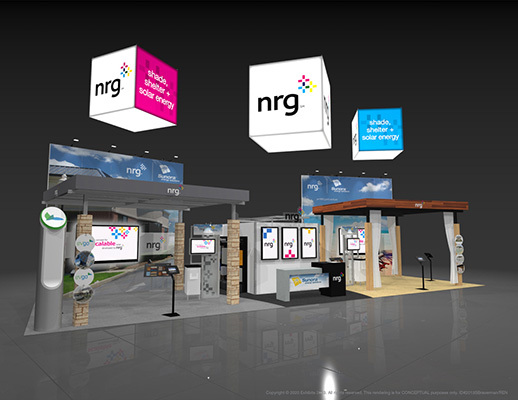 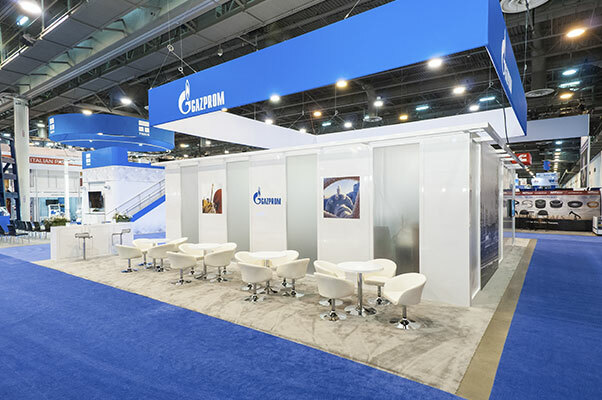 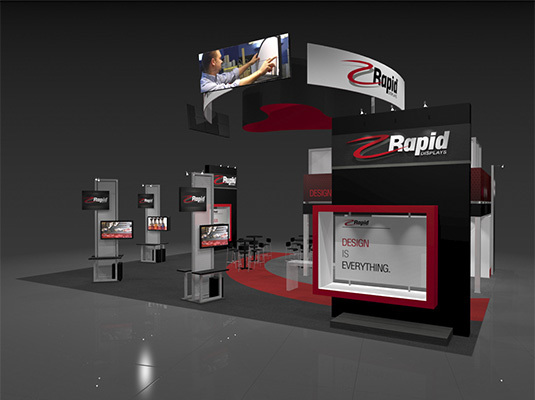 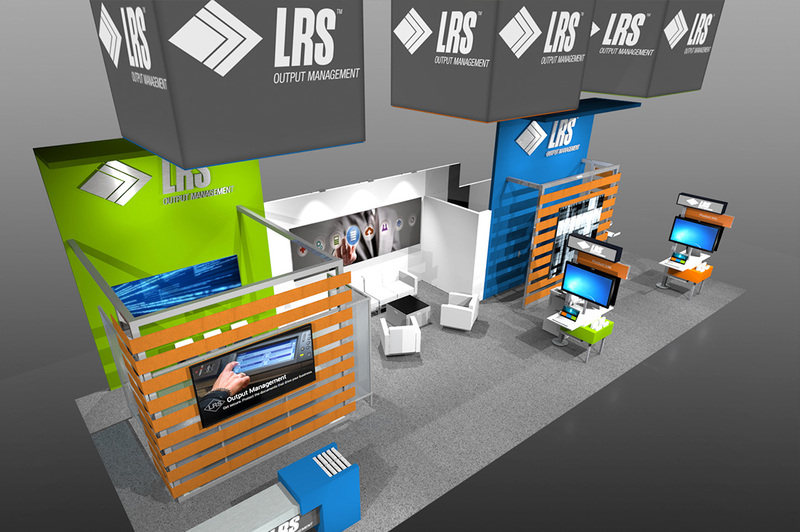 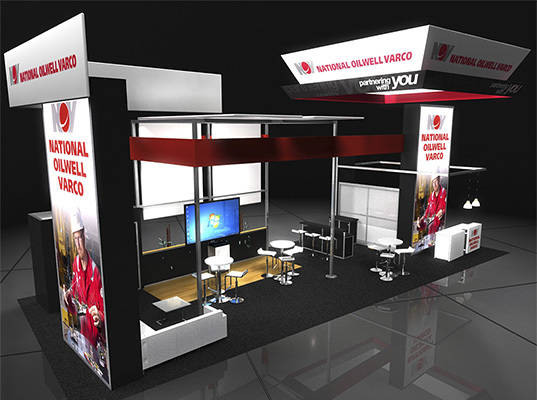 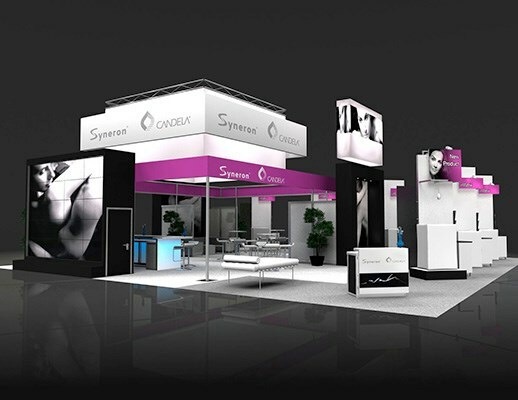 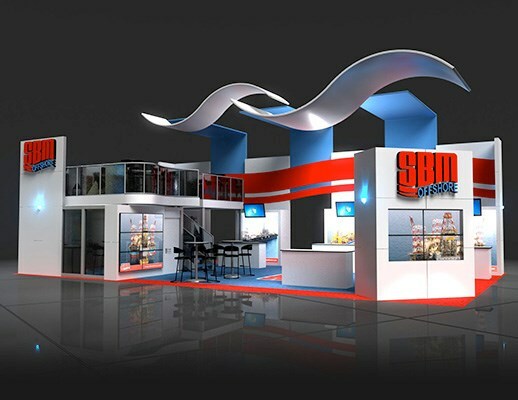 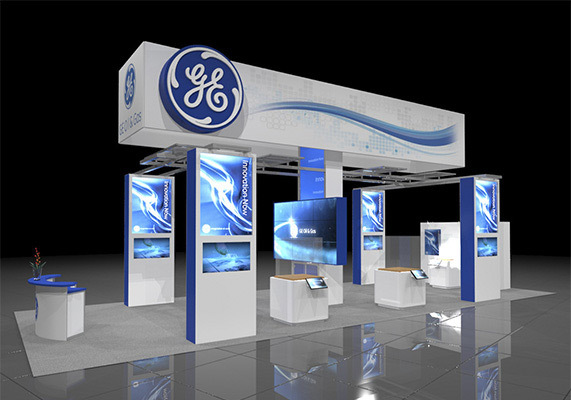 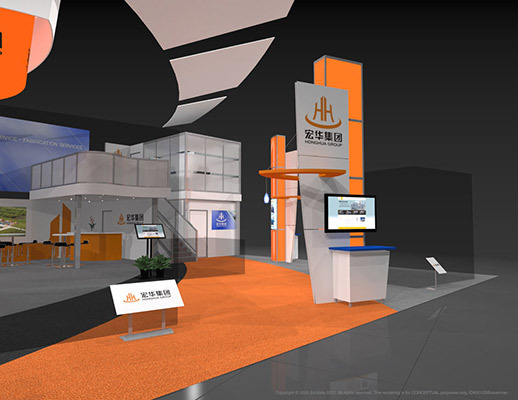 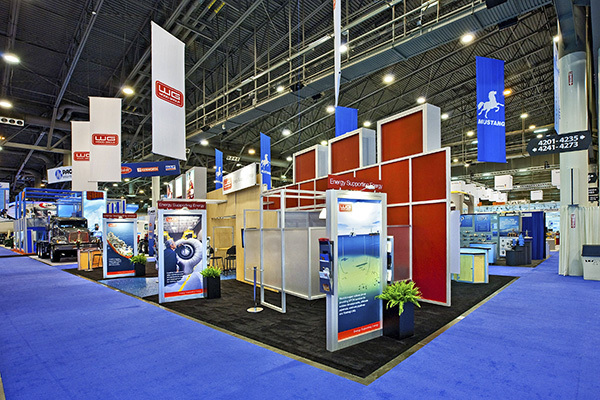 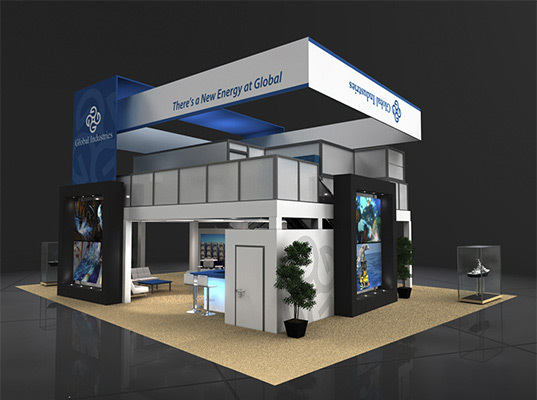 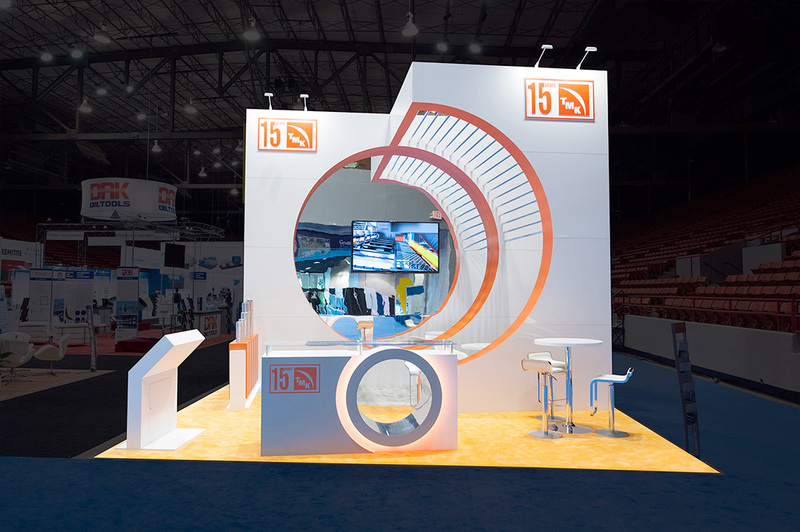 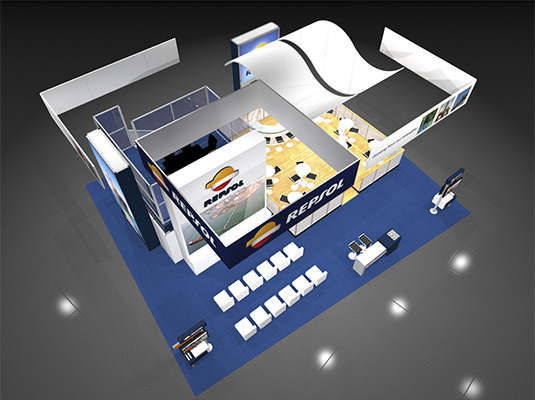 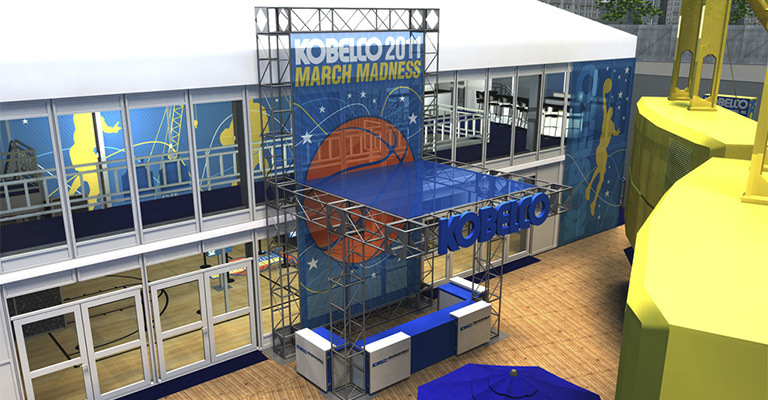 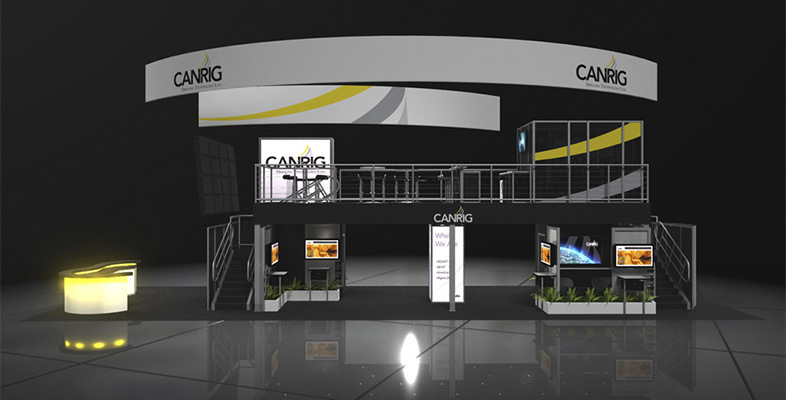 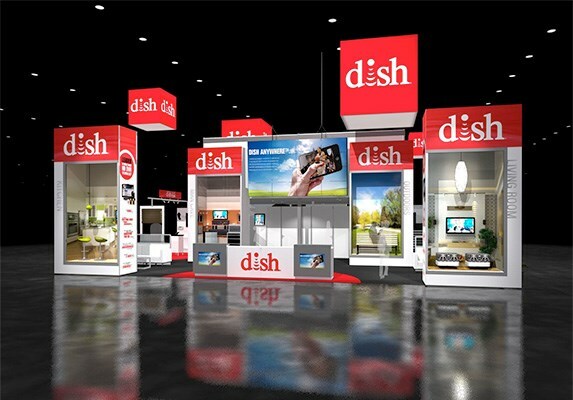 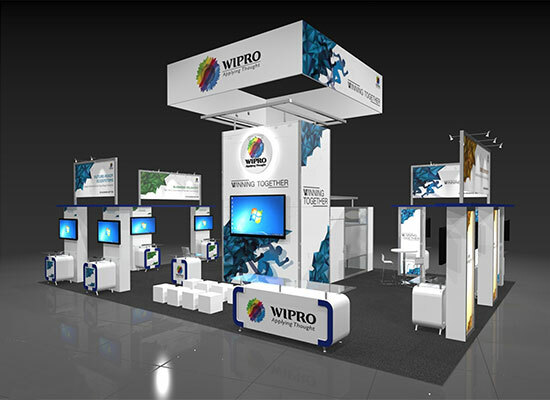 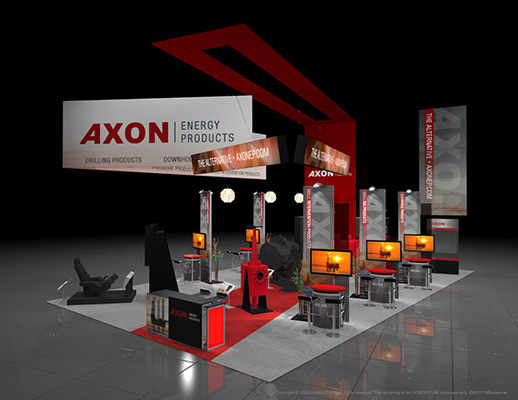 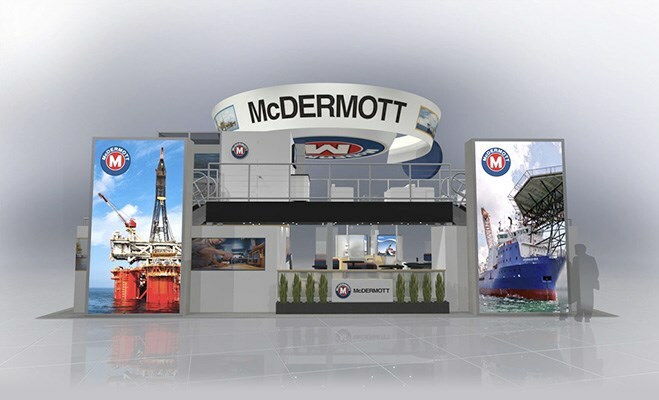 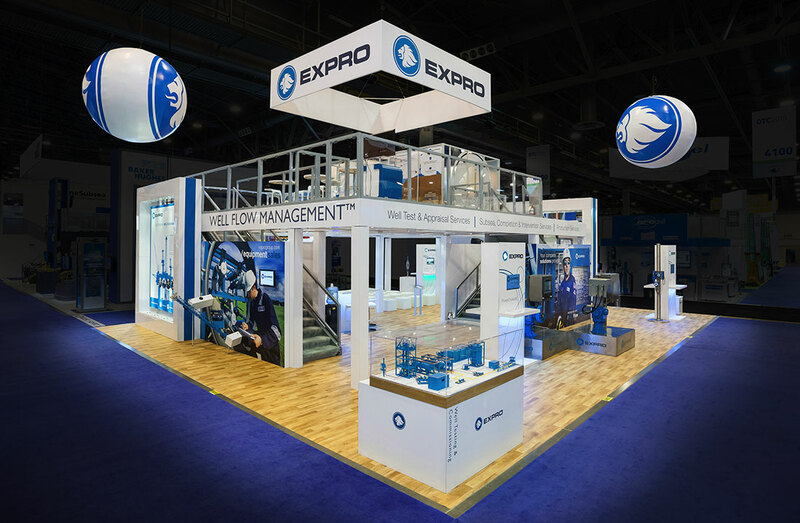 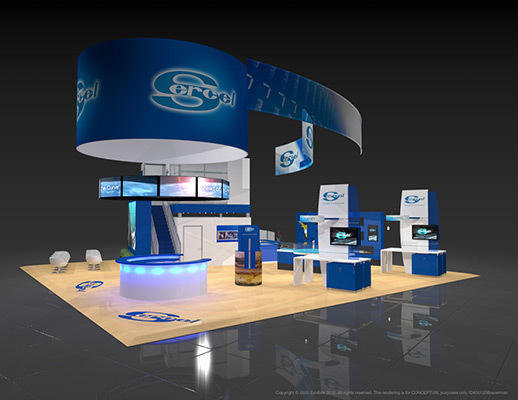 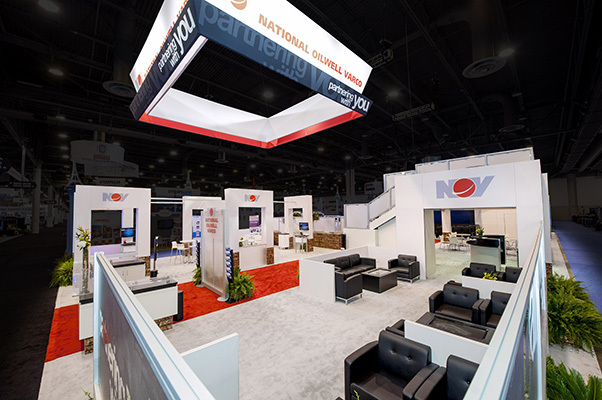 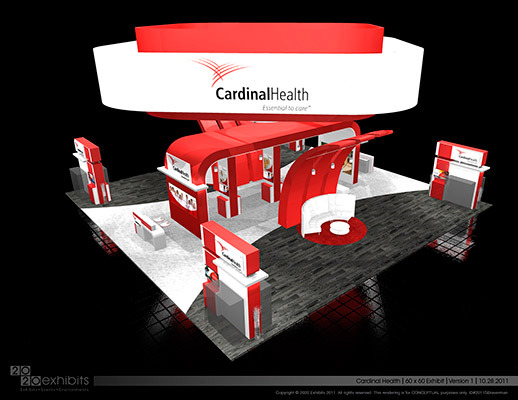 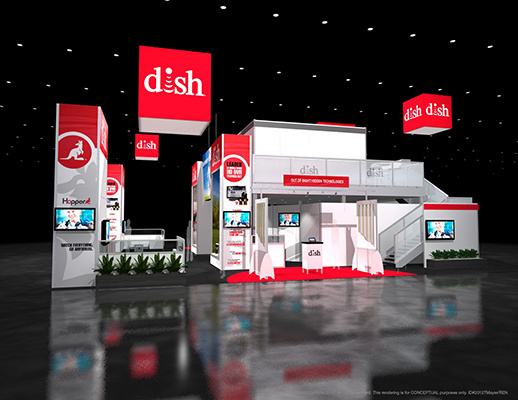 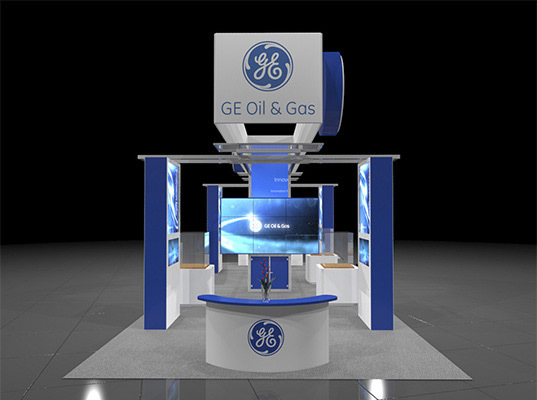 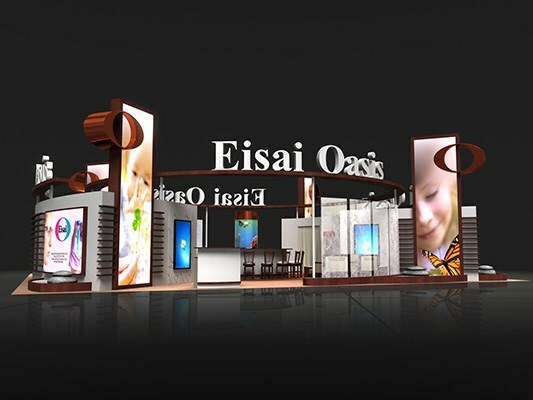 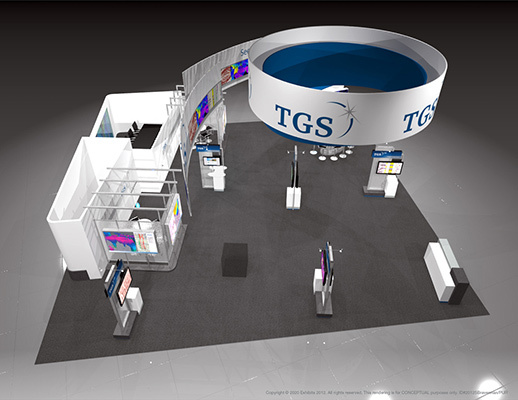 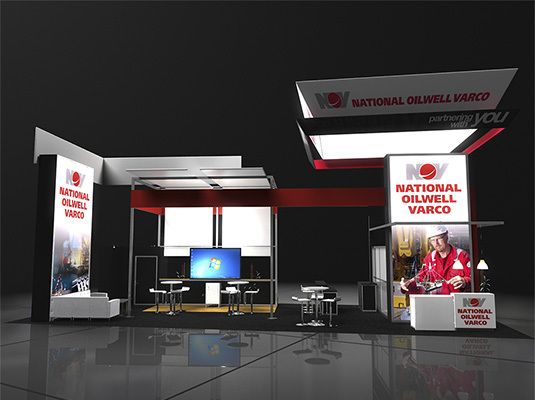 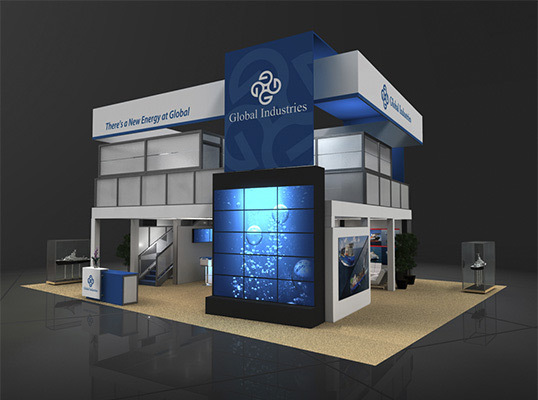 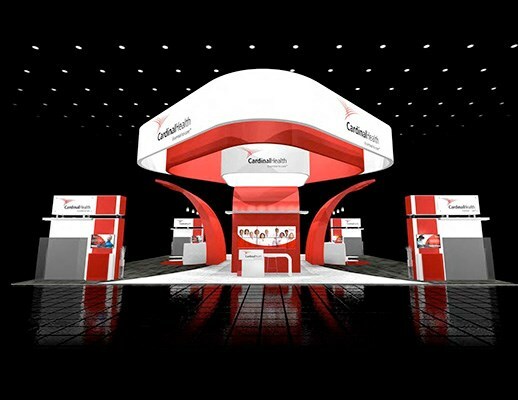 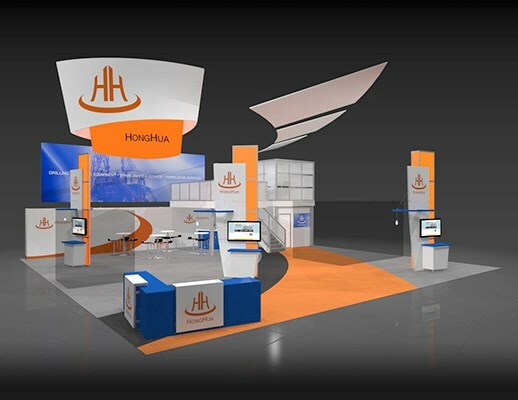 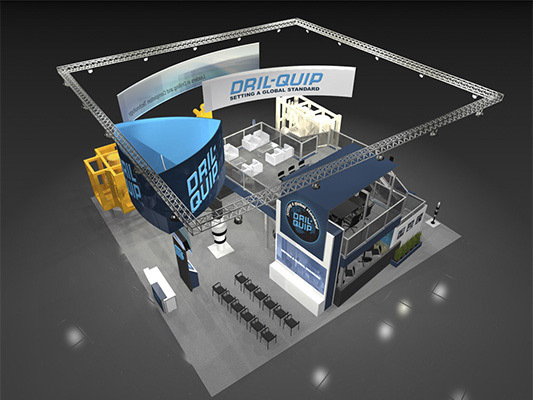 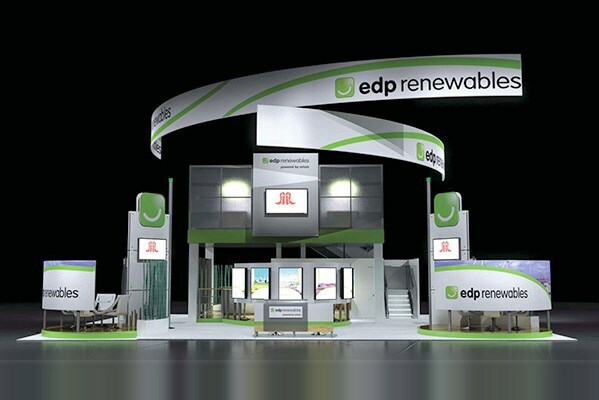 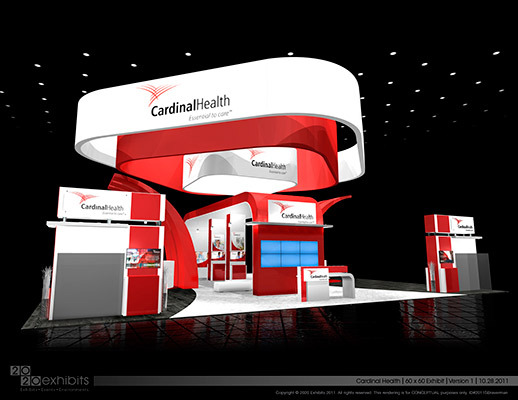 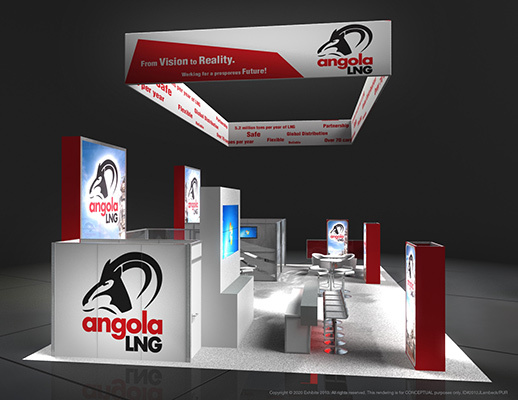 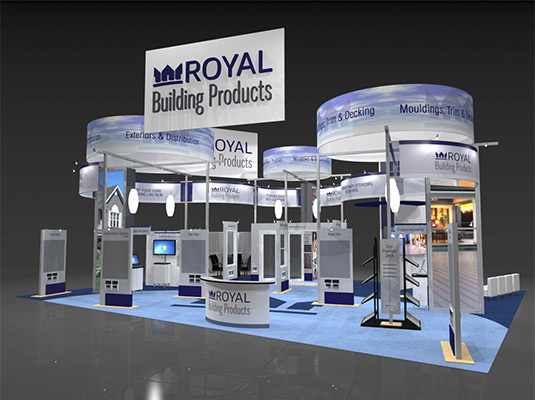 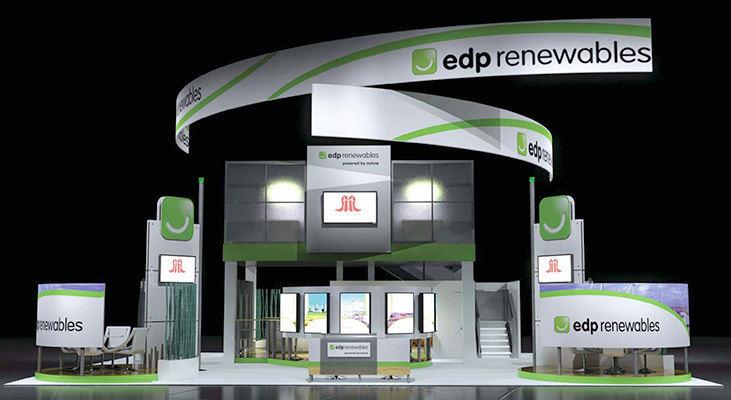 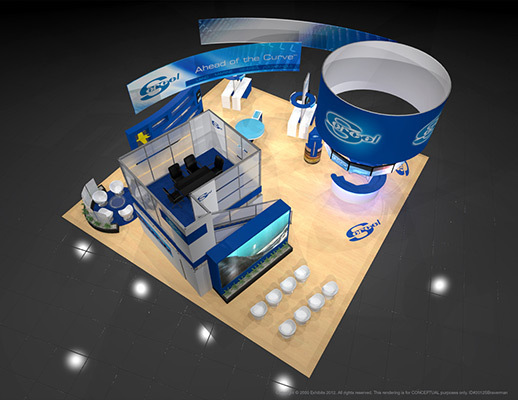 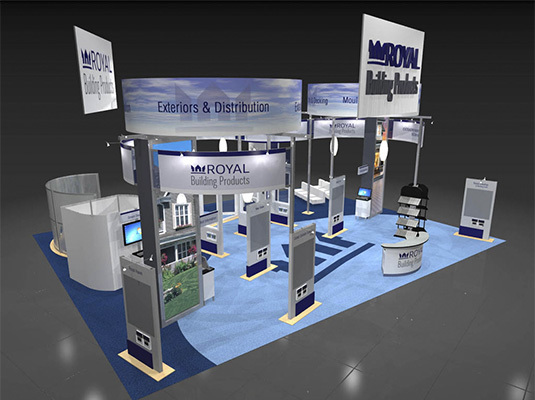 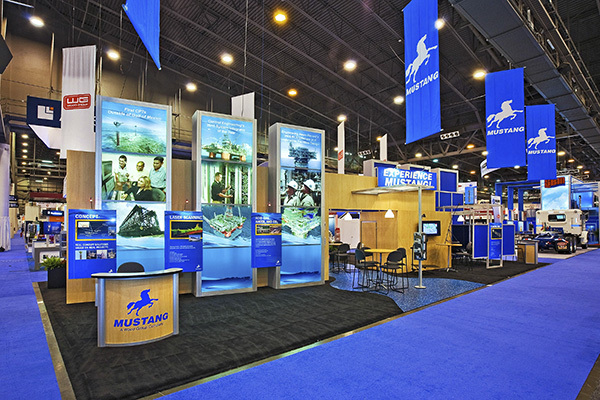 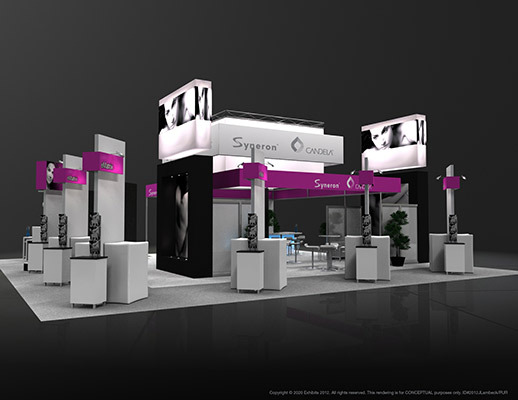 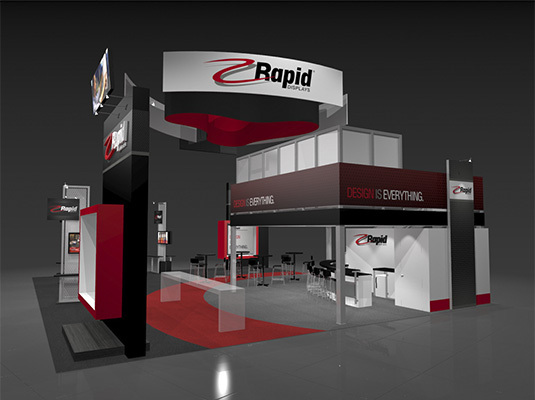 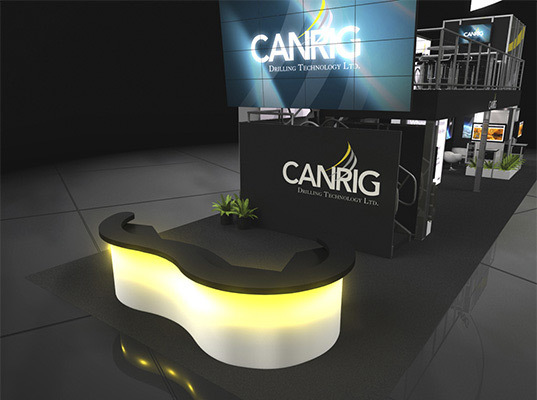 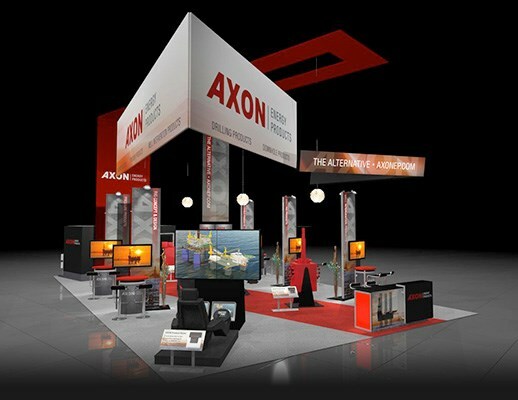 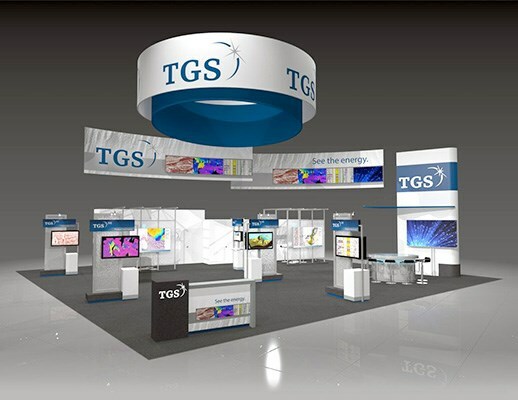 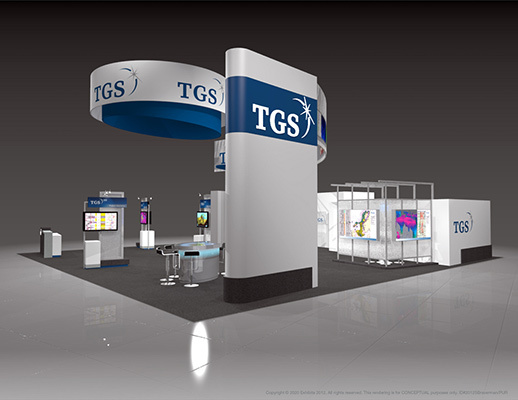 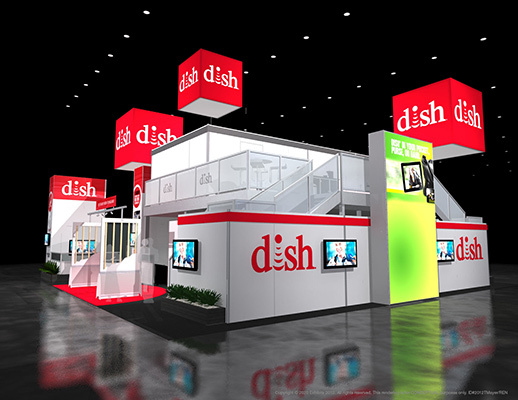 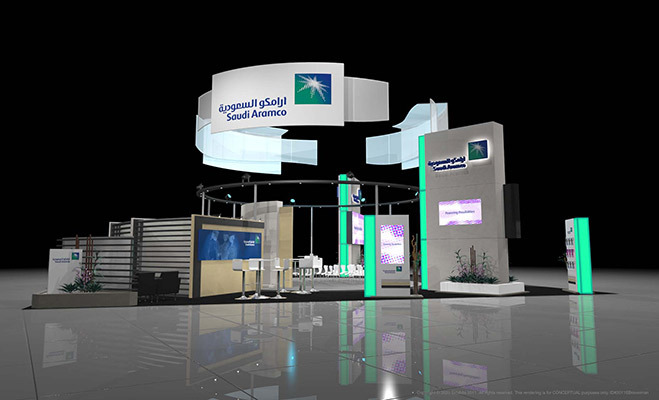 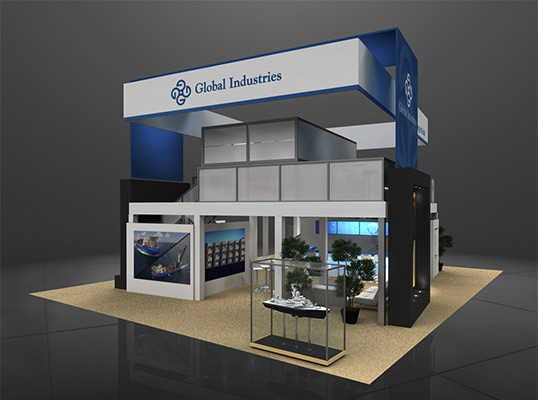 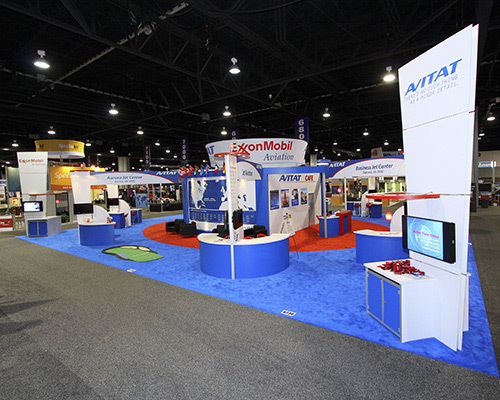 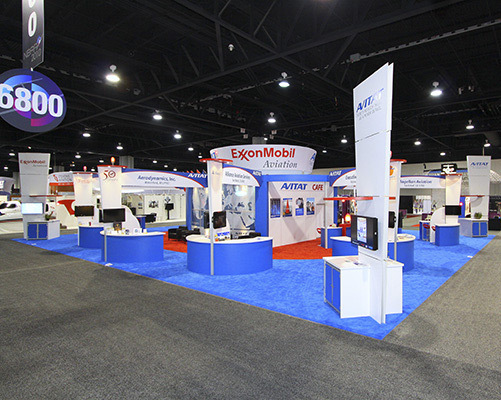 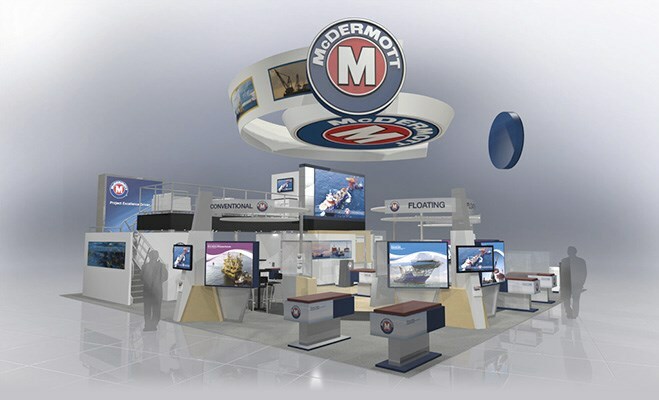 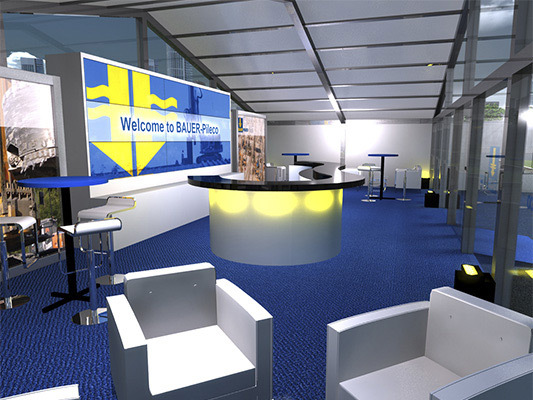 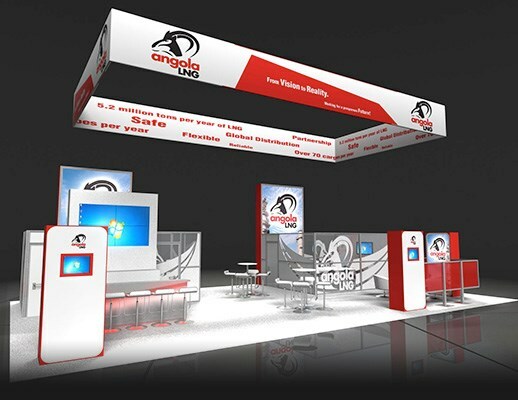 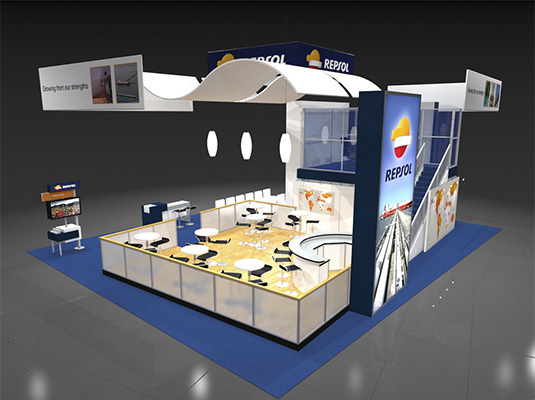 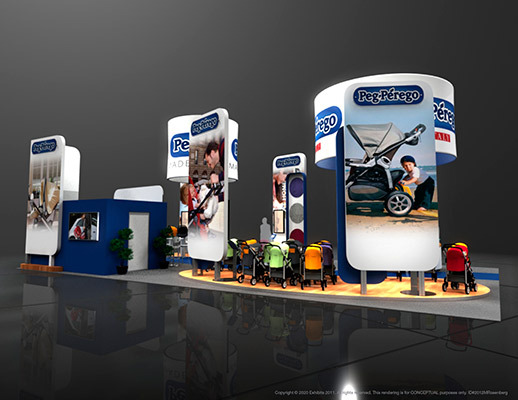 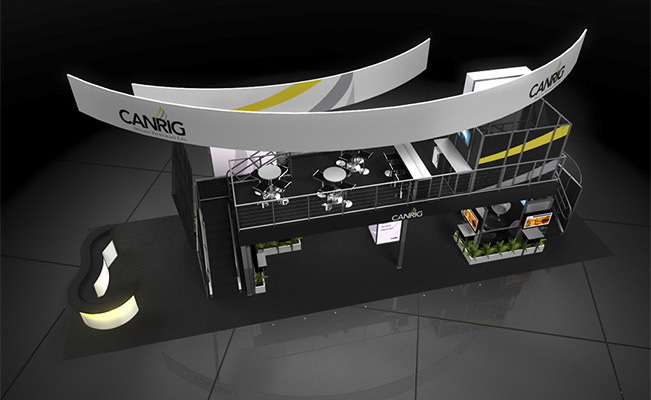 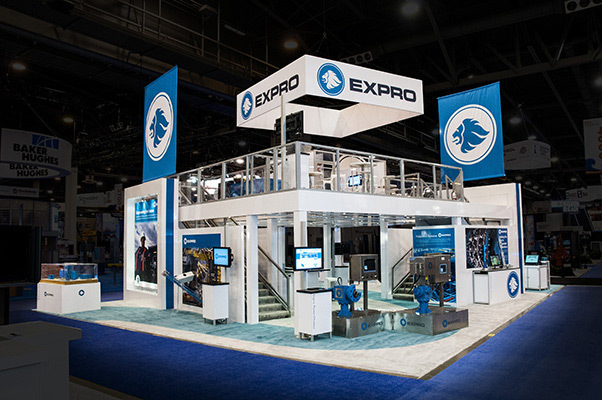 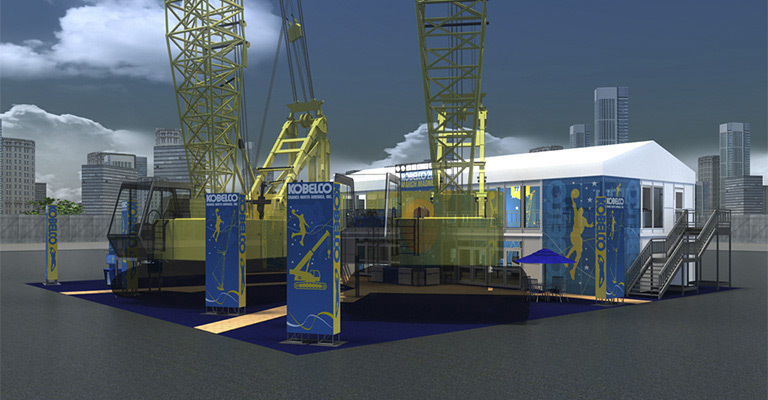 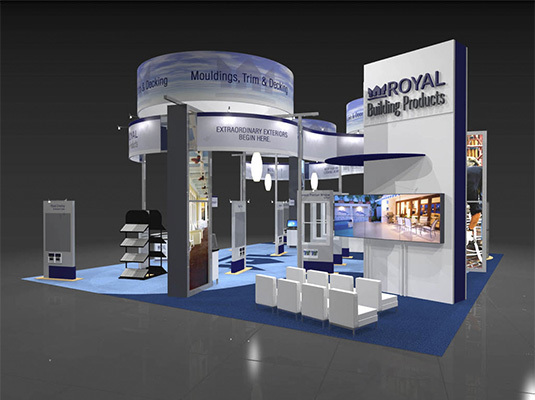 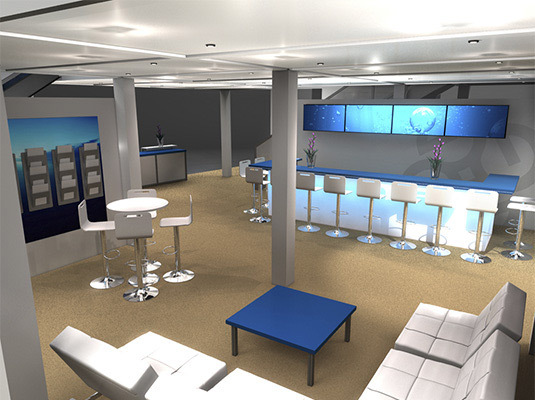 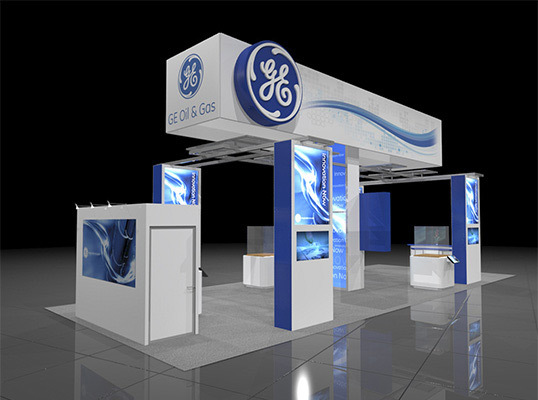 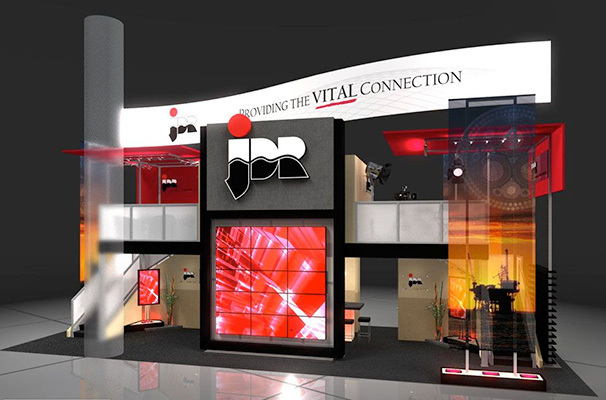 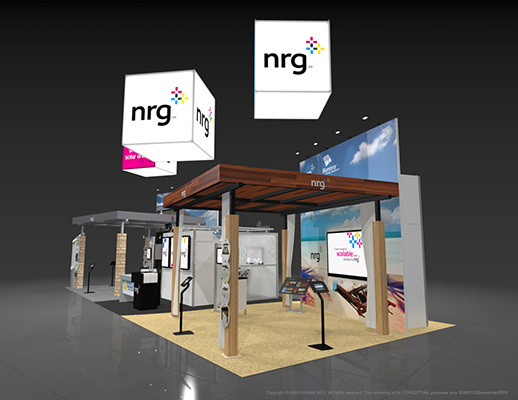 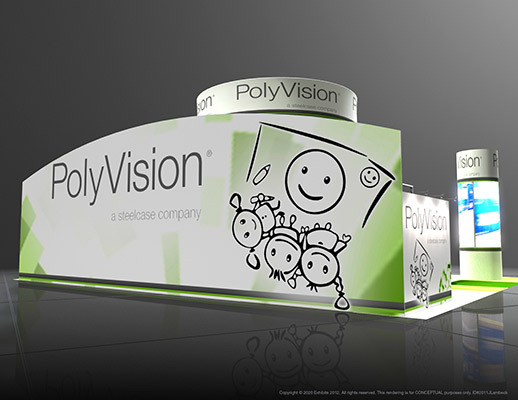 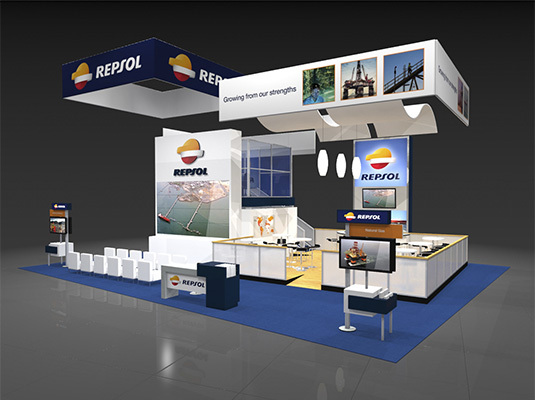 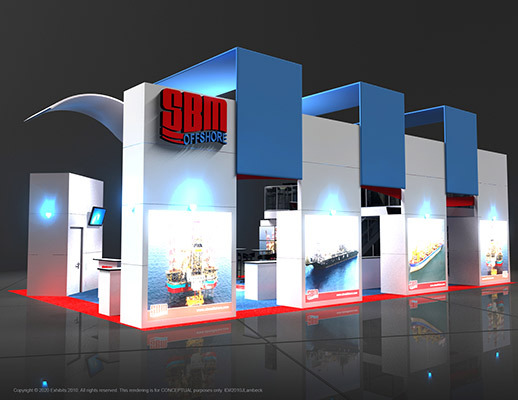 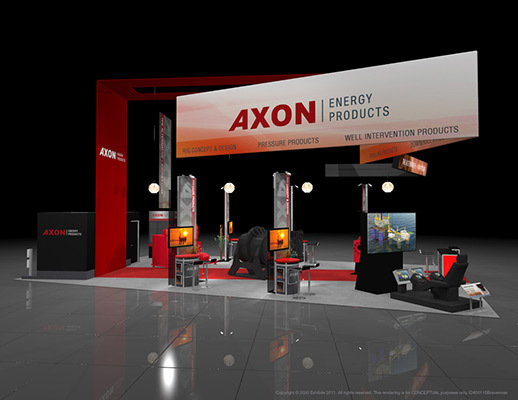 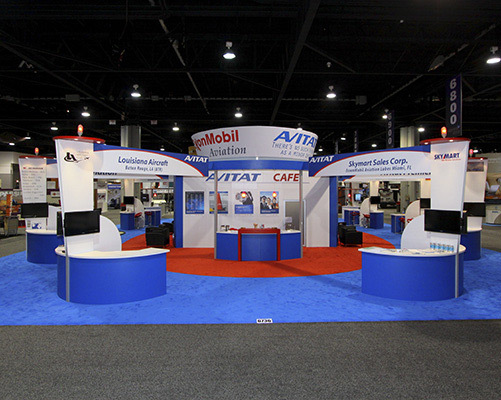 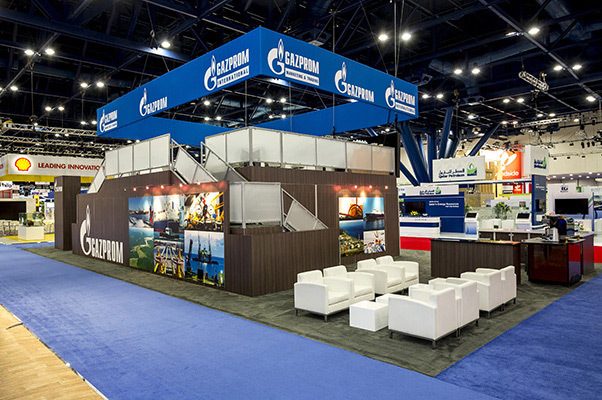 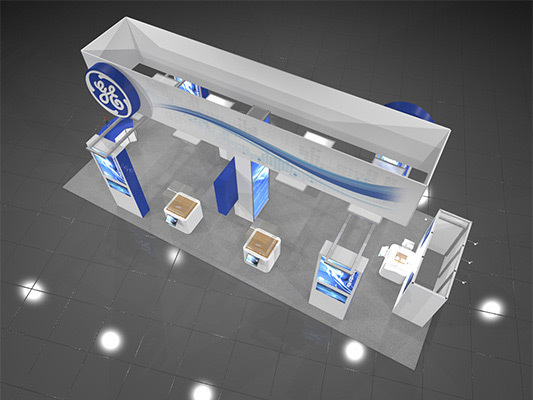 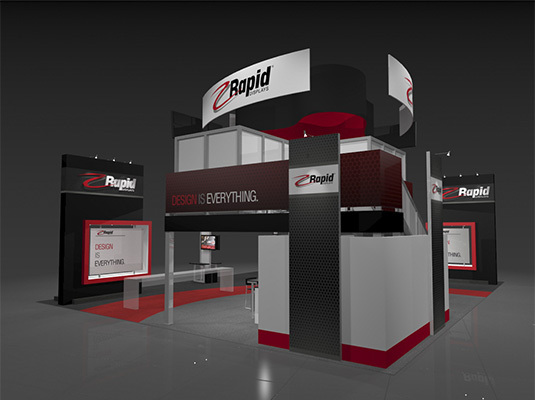 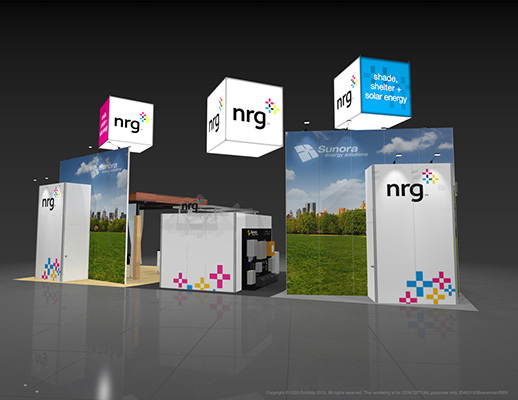 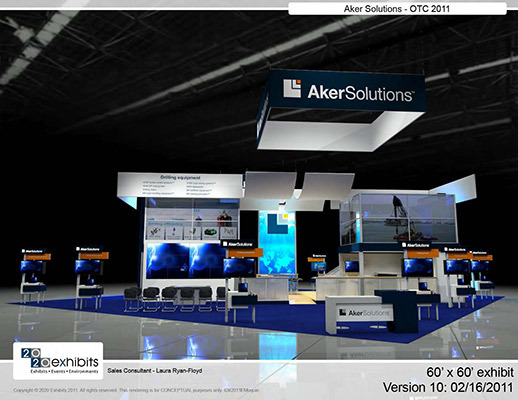 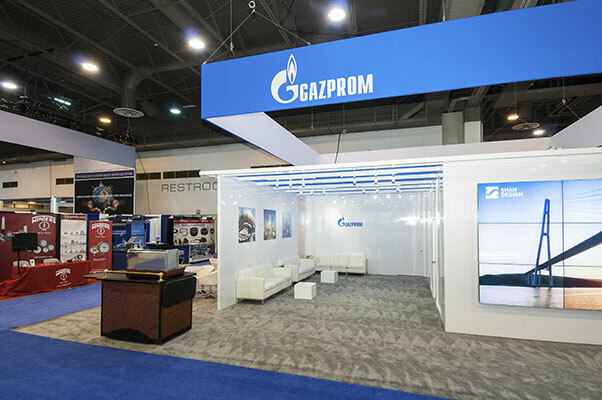 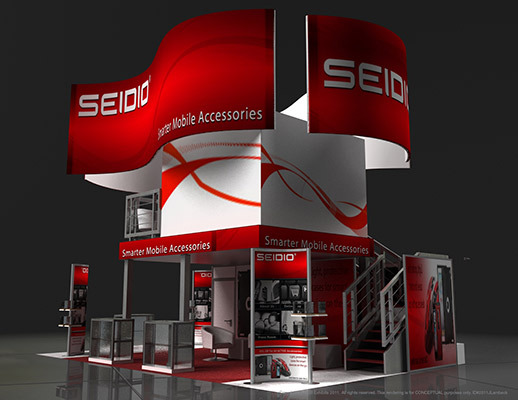 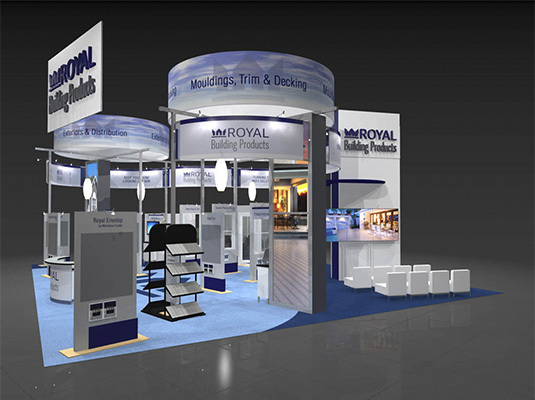 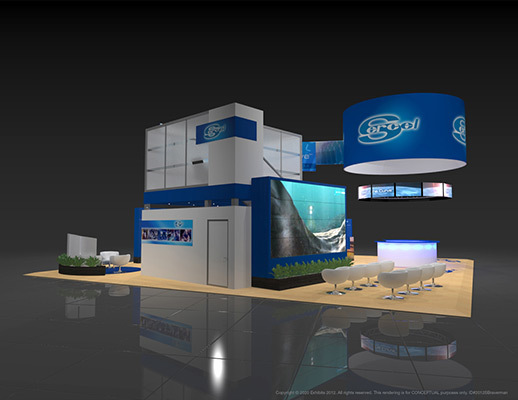 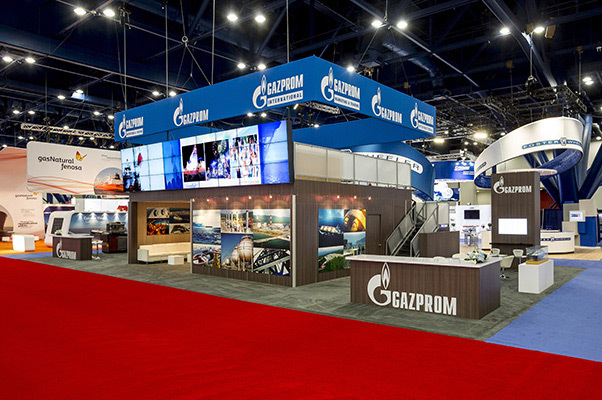 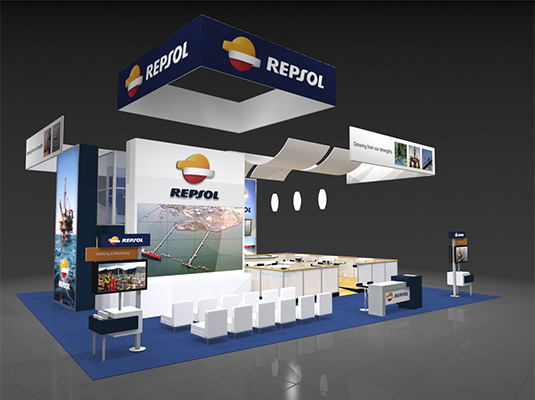 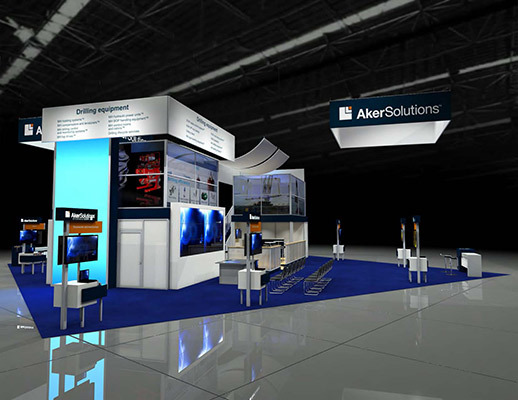 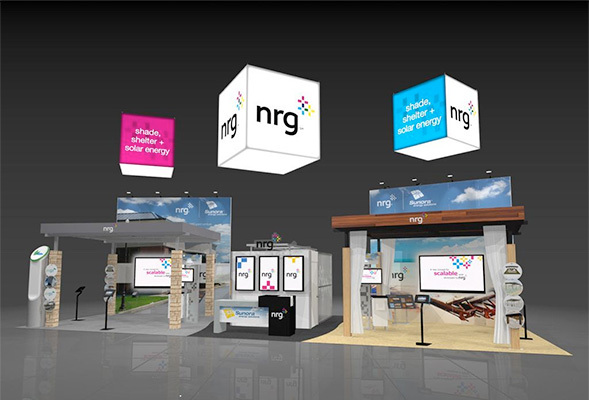 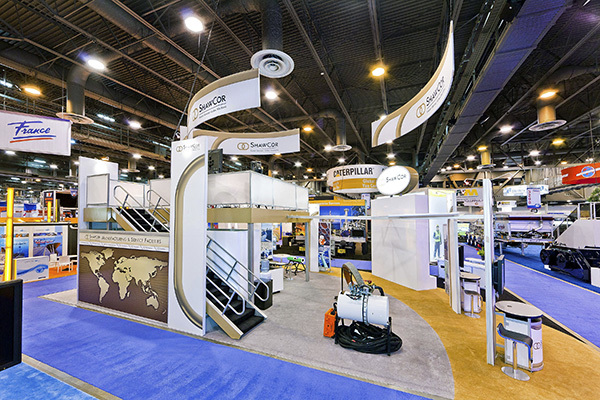 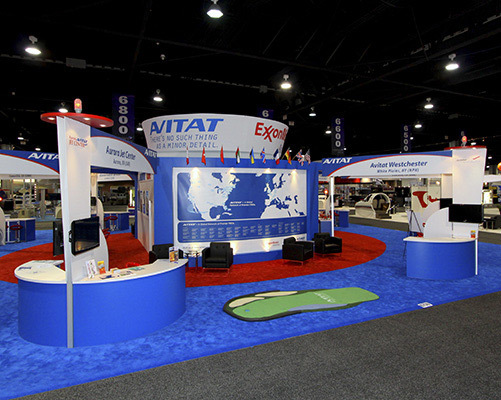 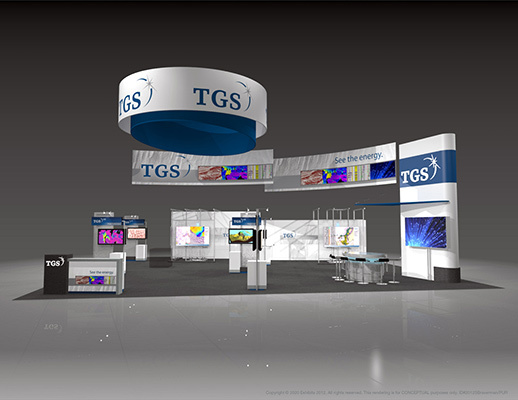 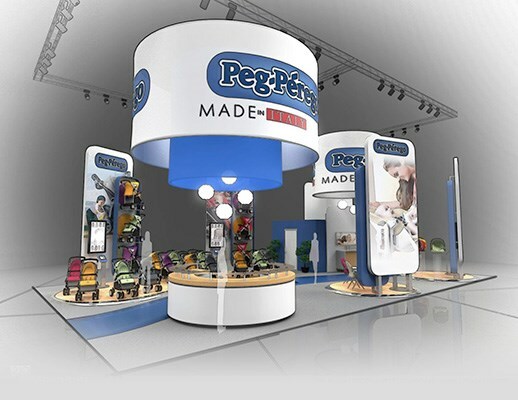 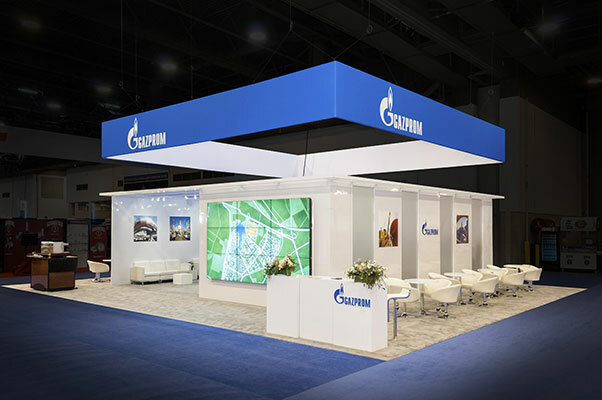 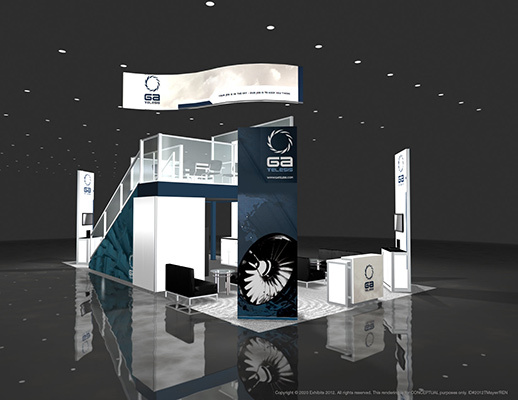 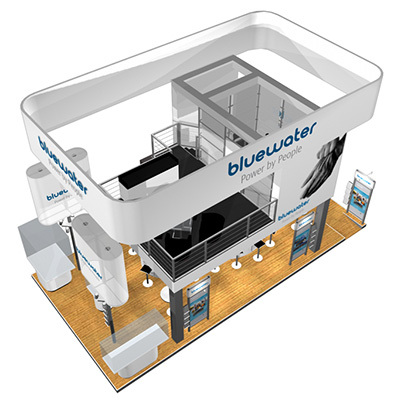 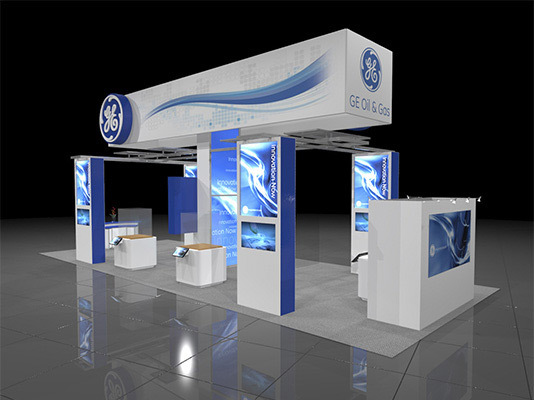 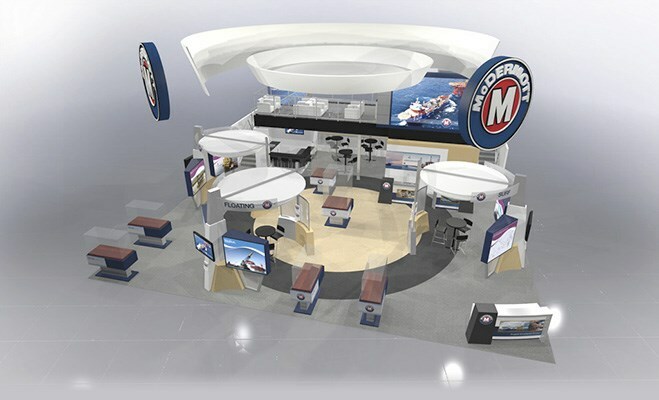 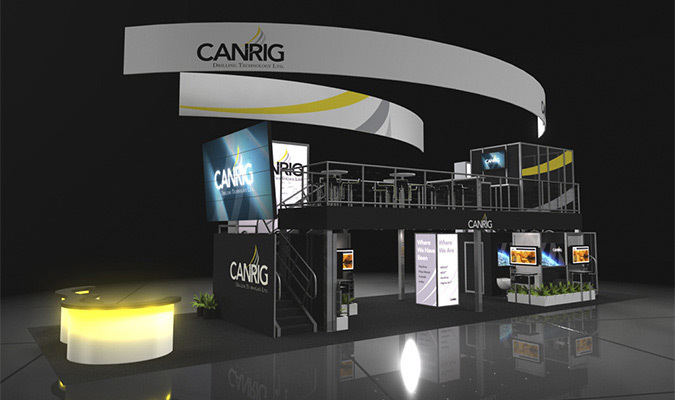 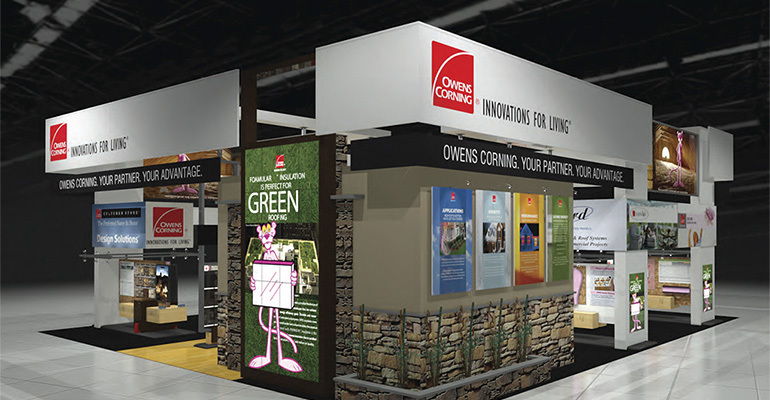 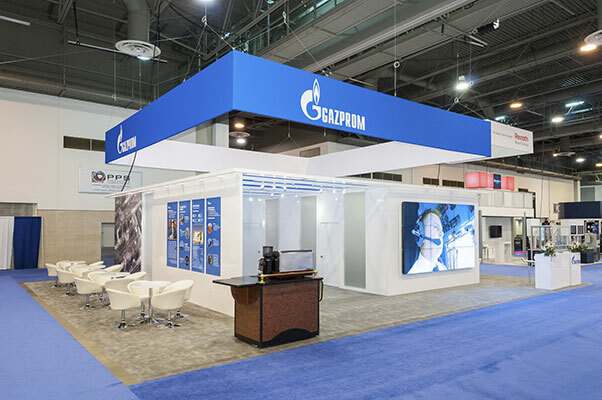 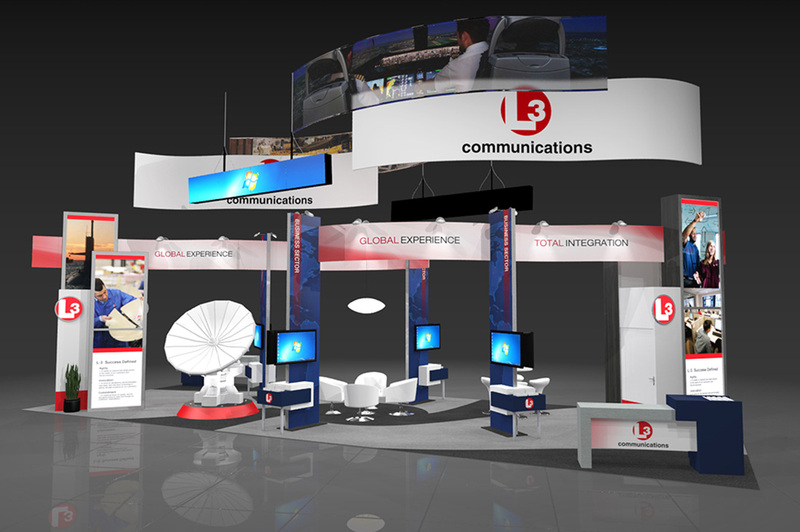 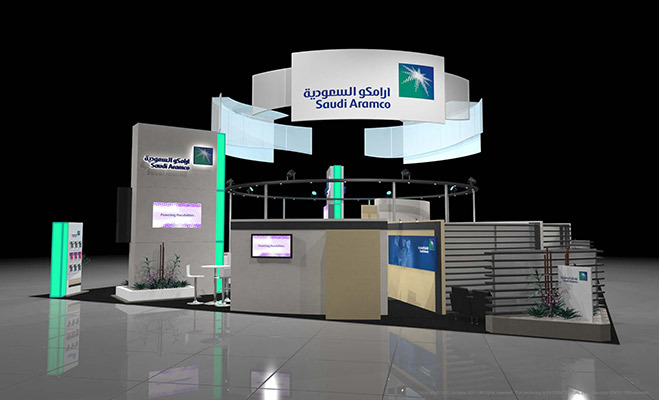 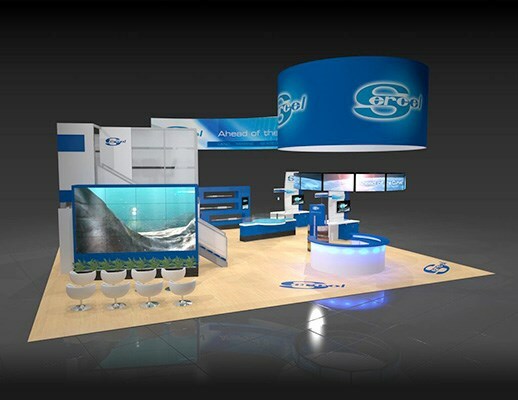 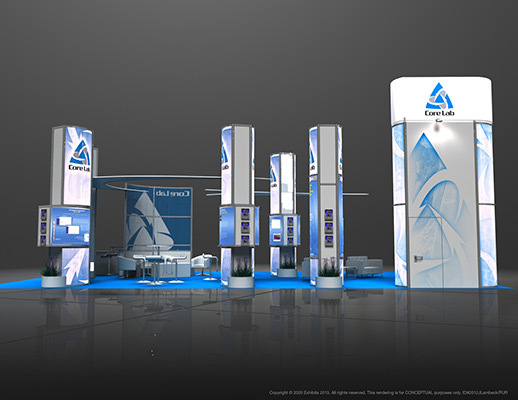 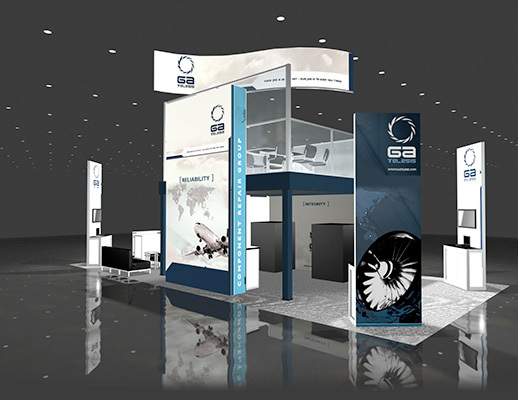 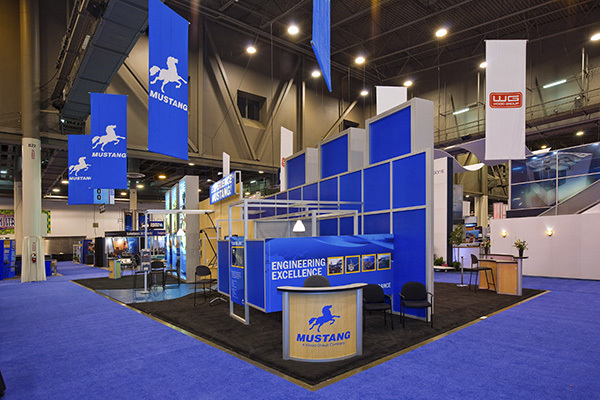 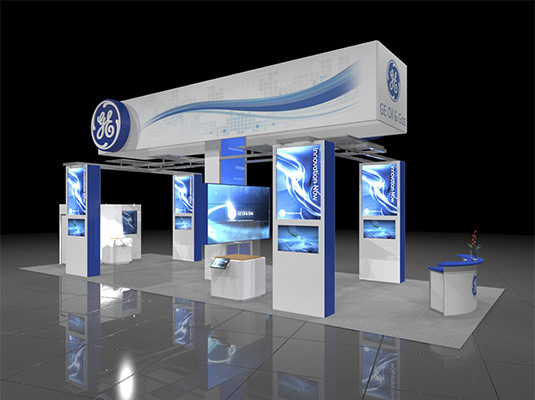 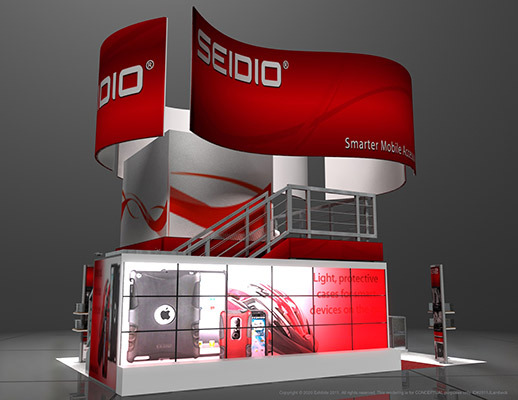 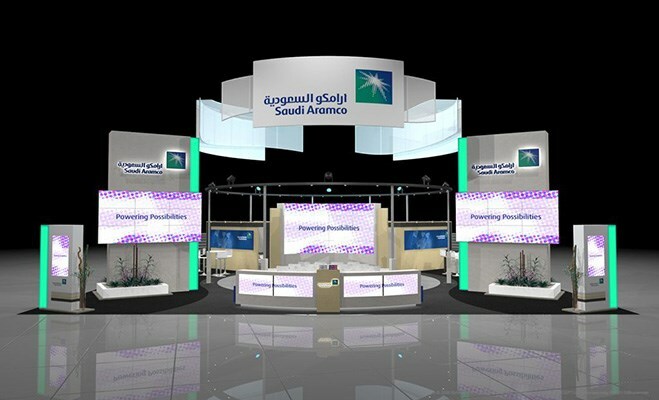 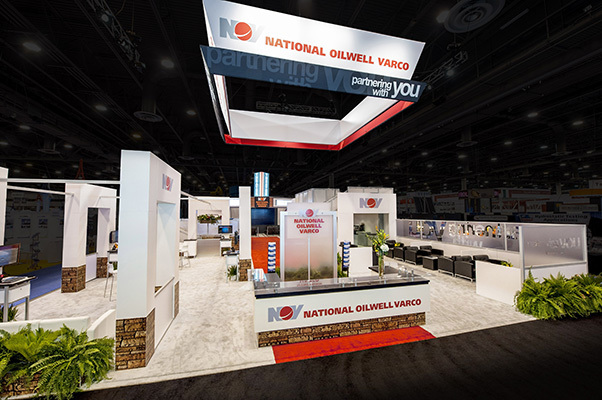 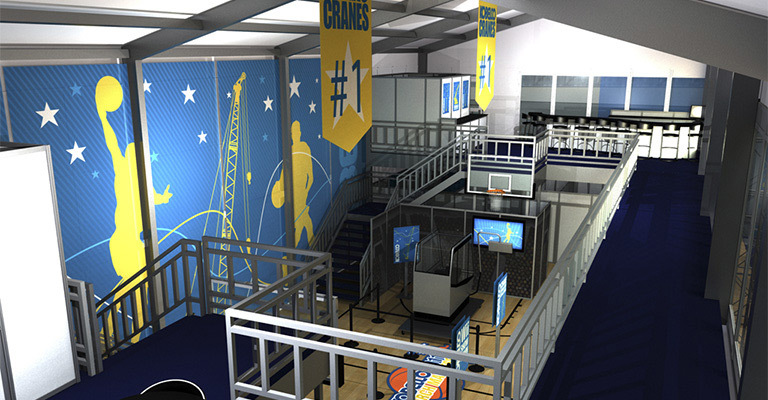 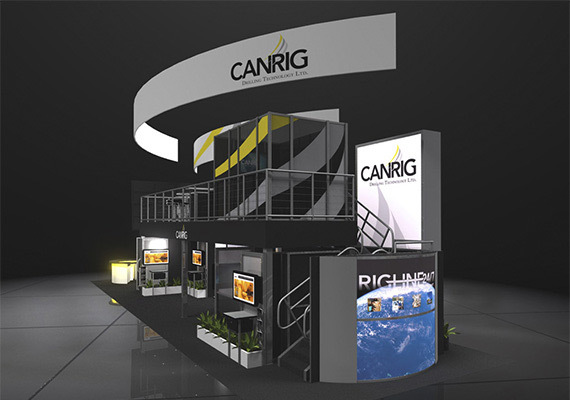 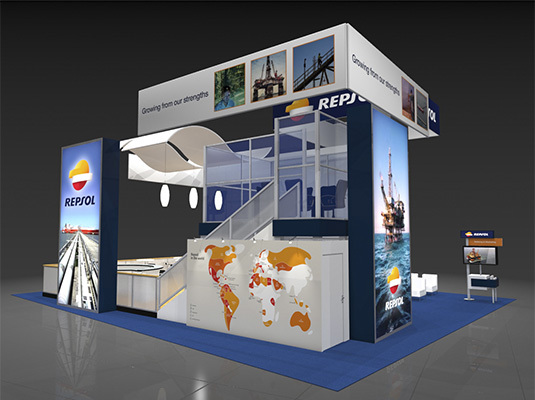 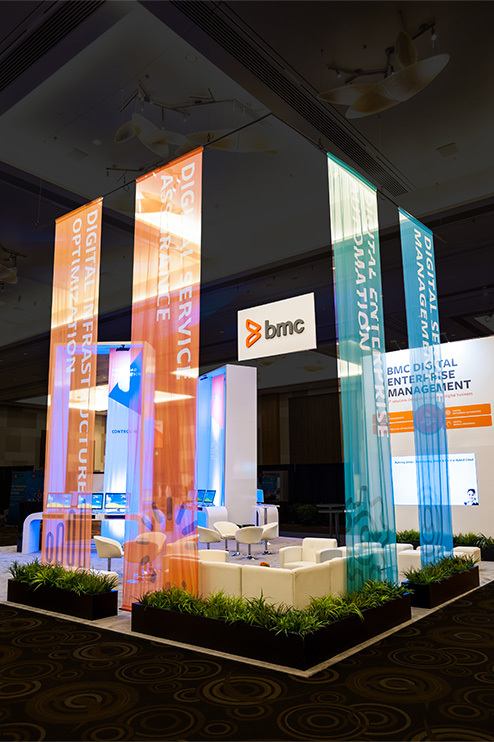 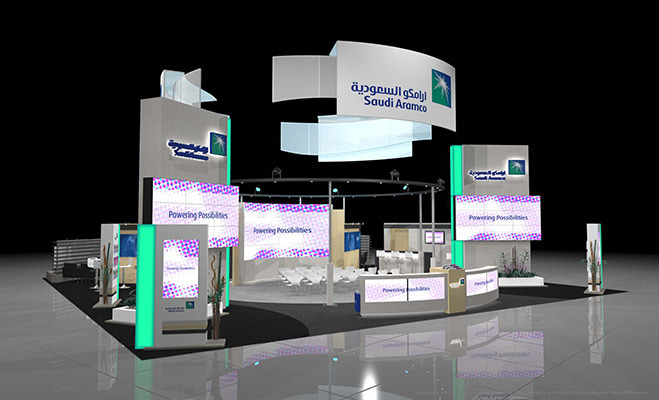 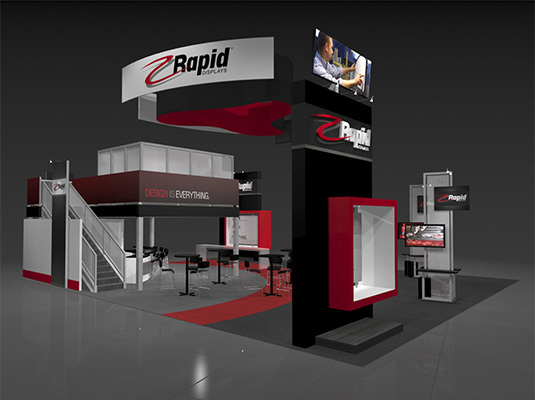 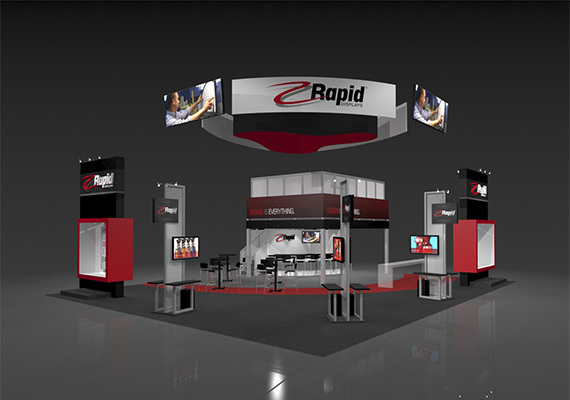 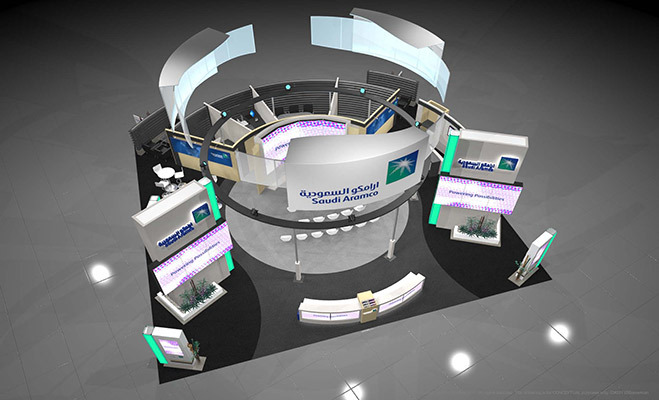 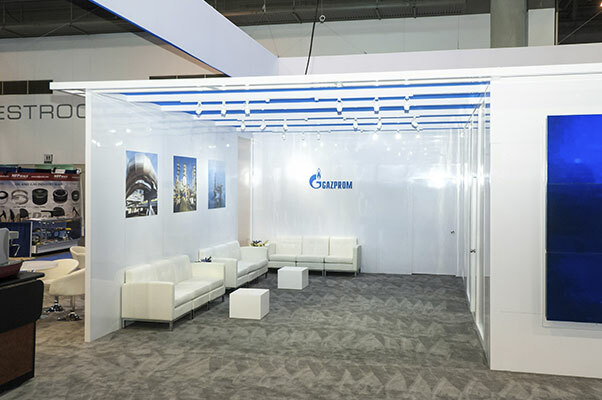 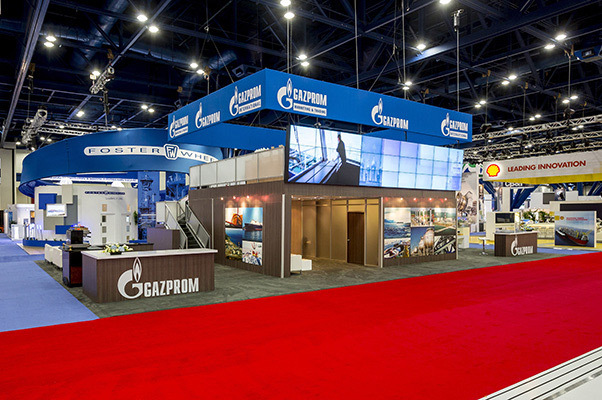 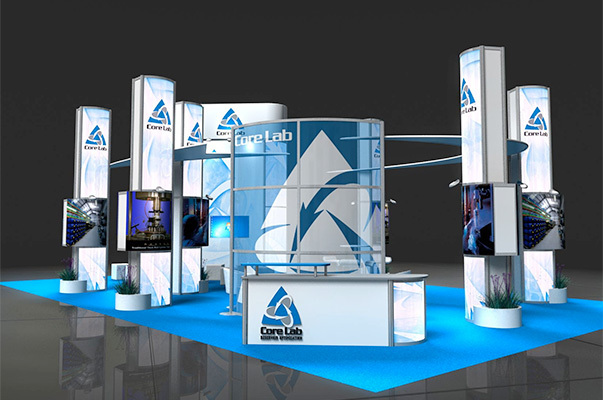 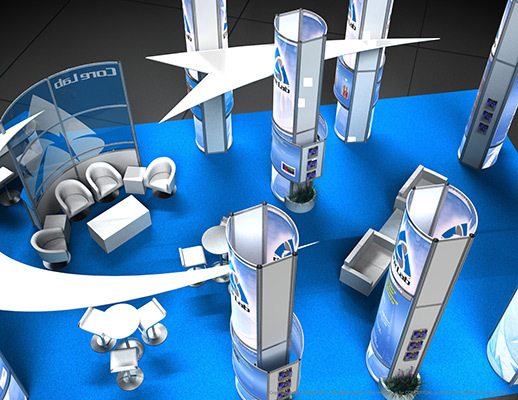 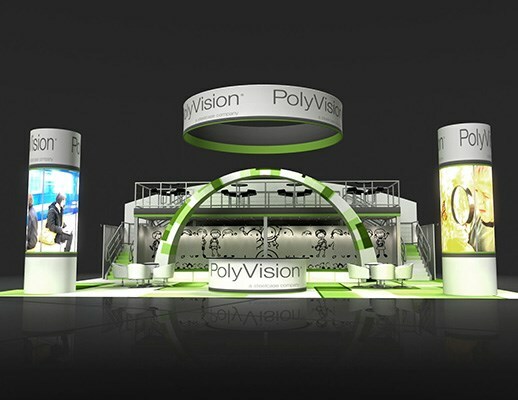 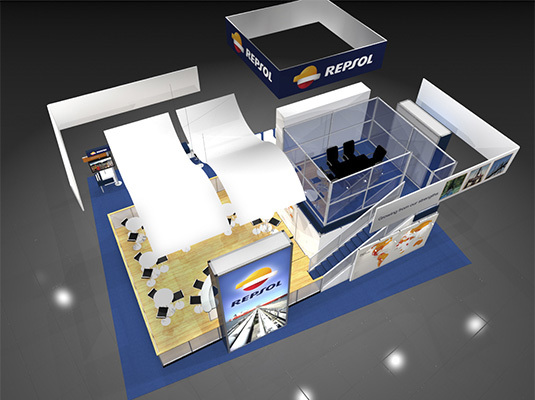 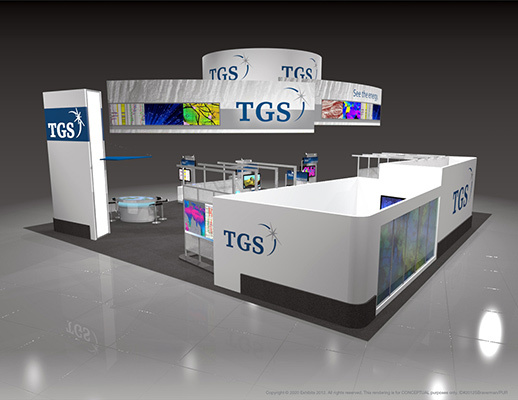 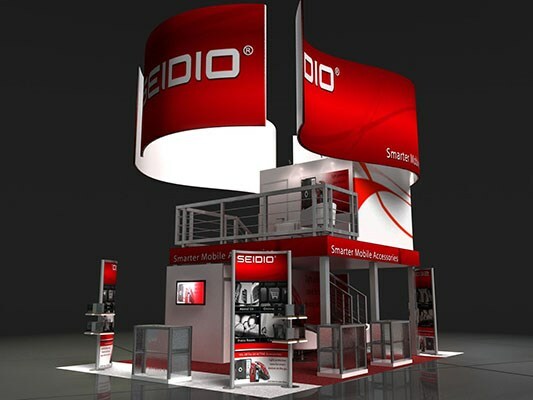 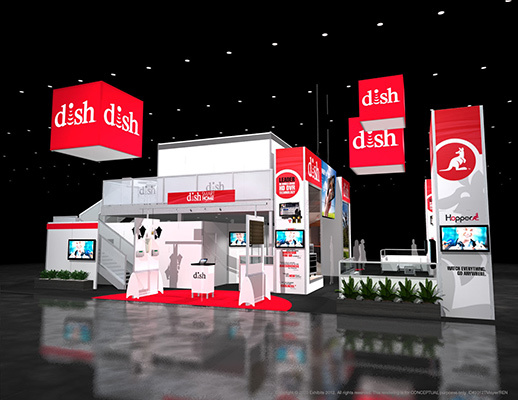 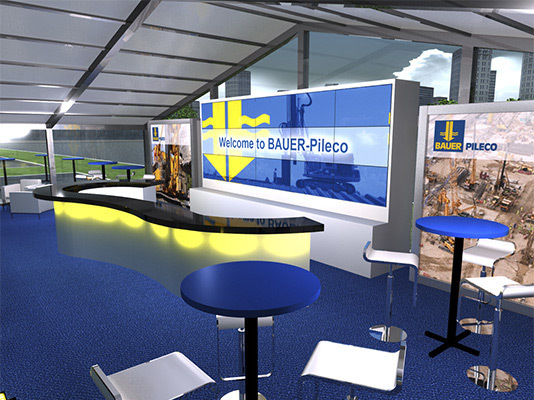 Features include: overhead graphic logo signage, overhead lighting, large product display areas, storage closet, storage areas, enclosed private meeting areas, lounge seating, open conference seating, cushioned seating, curved graphic banners, banner stands, sharp colors, illuminated graphic towers and literature displays.